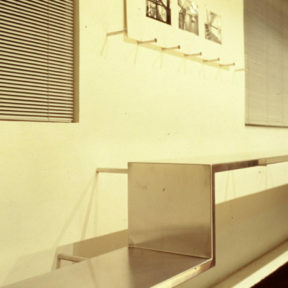 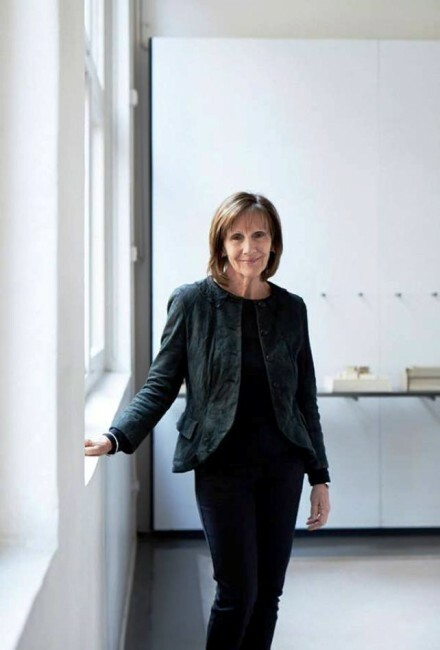 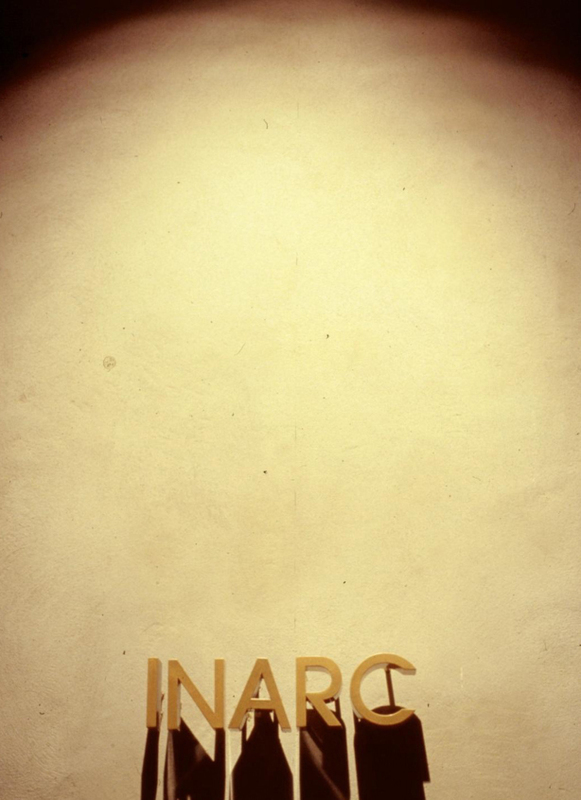 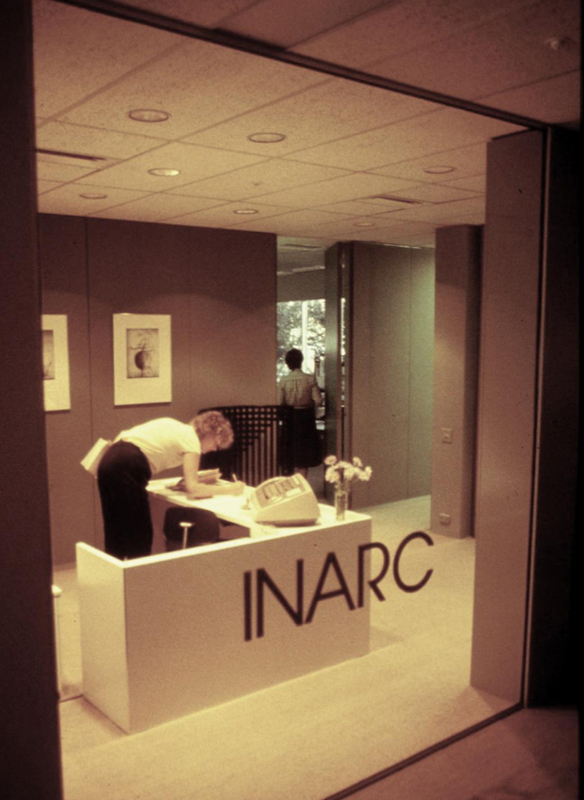 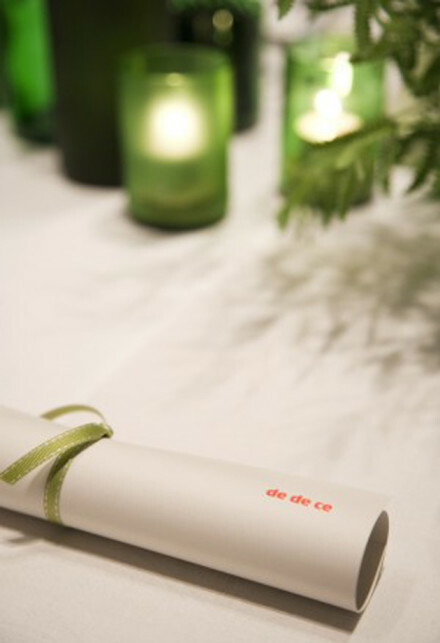 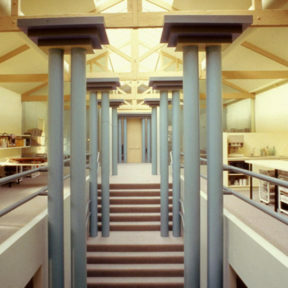 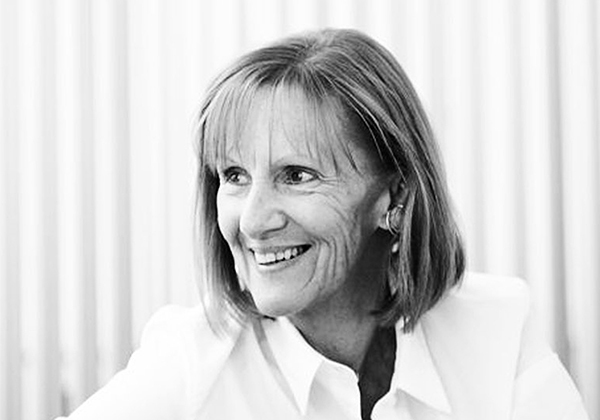 “Being the first career achievement award the IDEA jury has ever bestowed upon an Australian designer, the process in deciding our winner was a studious and methodical process, but there was an unmistakable difference, of prolific resonance, in the large body of work Sue Carr had presented. A unique site, covered in willow myrtle and tea tree, and immediately adjacent to the beach, the brief was to harmonise with Portsea’s coastal scenic character. 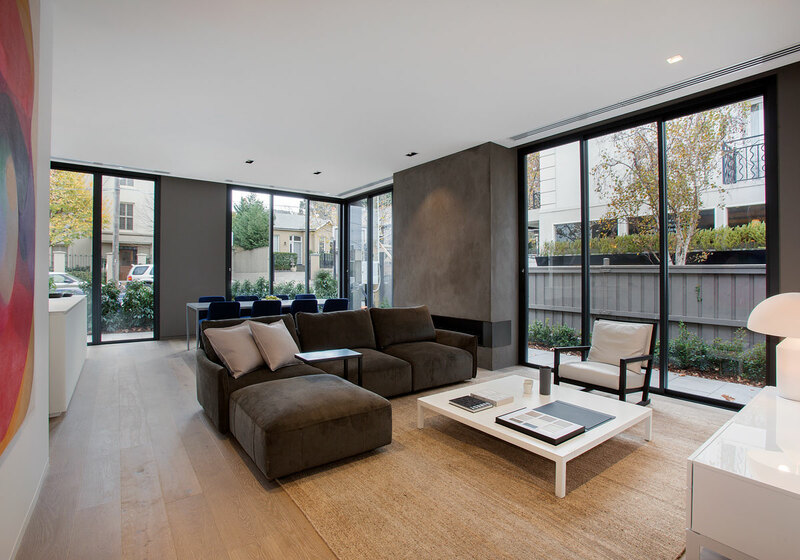 The construction is a simple articulated square of three storeys, unified with exterior, interior and furnishings conceived as complimentary parts of a whole. 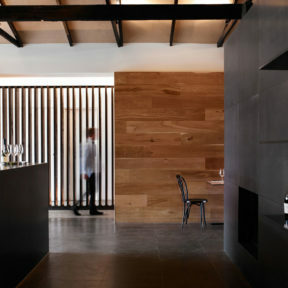 A structural steel exposed frame, is clad in vertical western red Cedar; the interior walls are neutral with polished box timber floors. 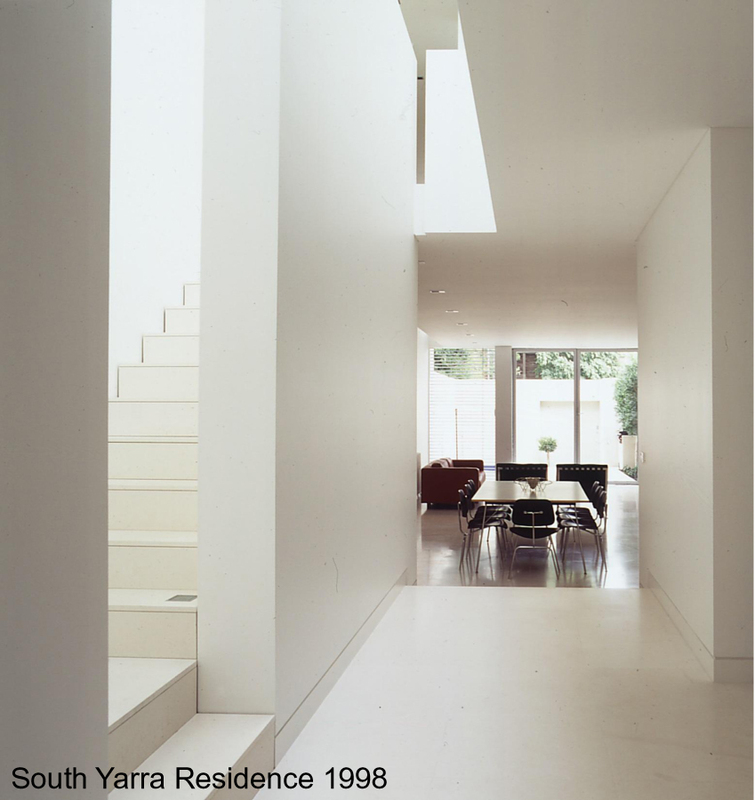 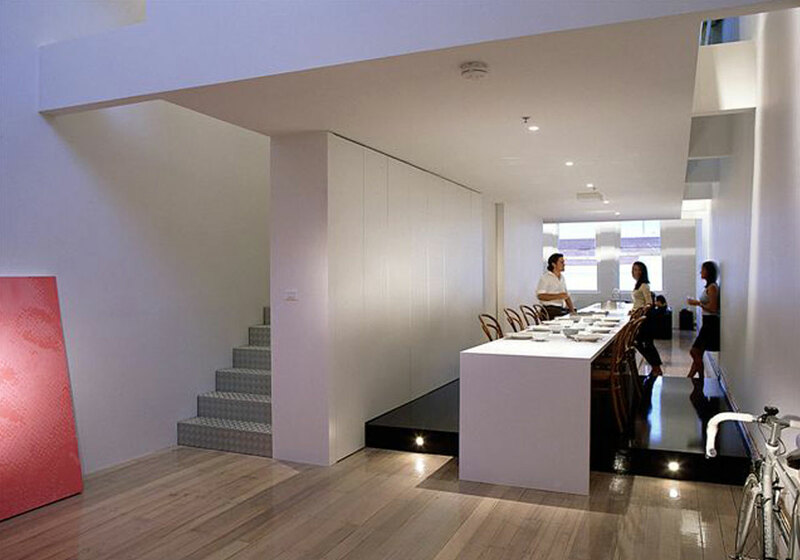 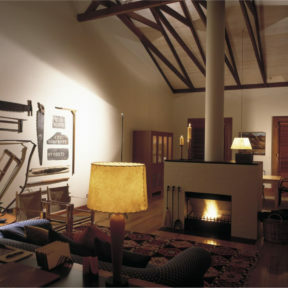 The restoration of the spacious three level home on Yarradale Road required an extensive interiors and architecture scope. 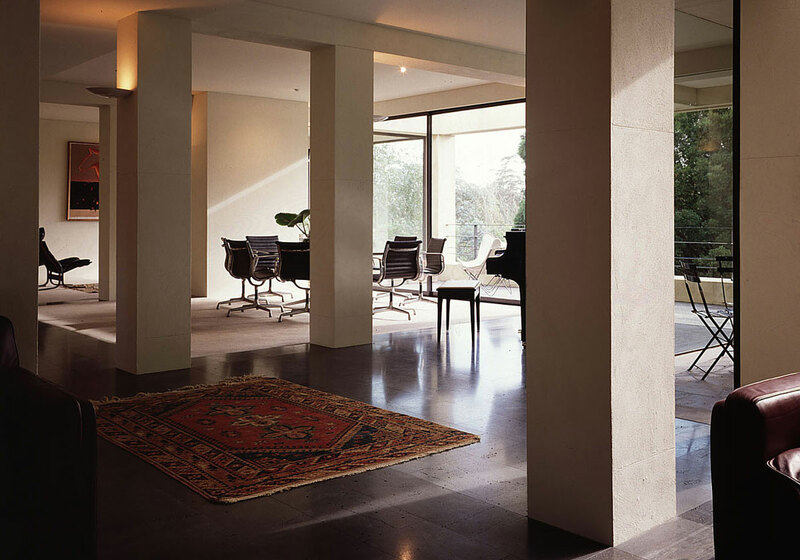 The house is situated on a site that falls over 14 metres towards the Yarra River and therefore the views dominate. 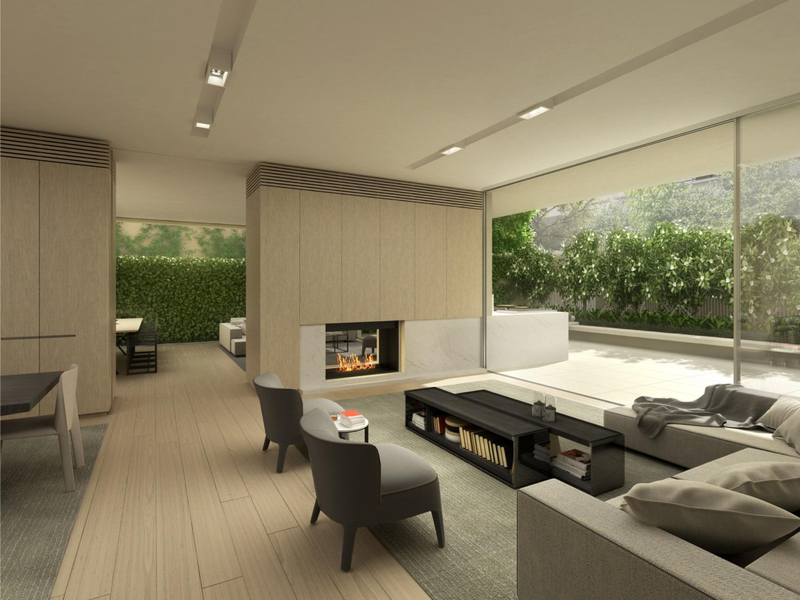 Sliding glass walls at each level take full advantage of colonnaded terraces and balconies. 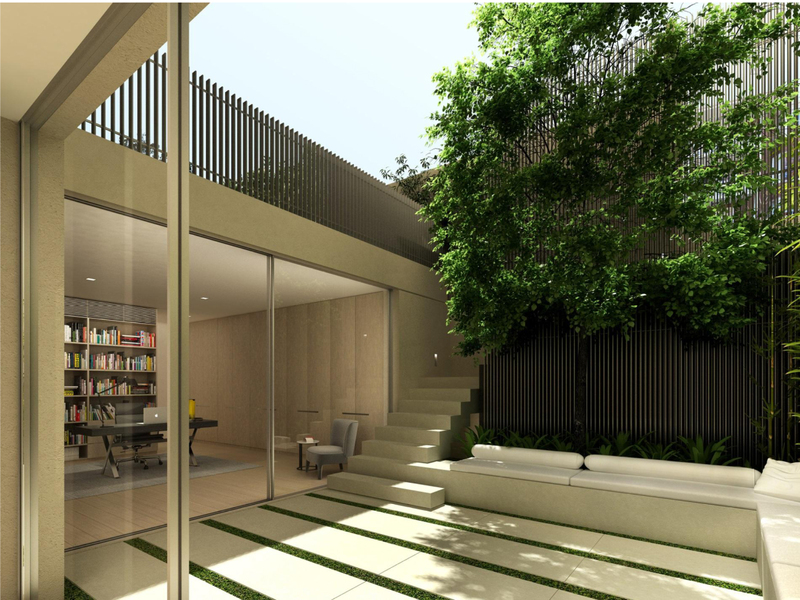 The leafy garden and golf course beyond bring a country feel to this urban villa. 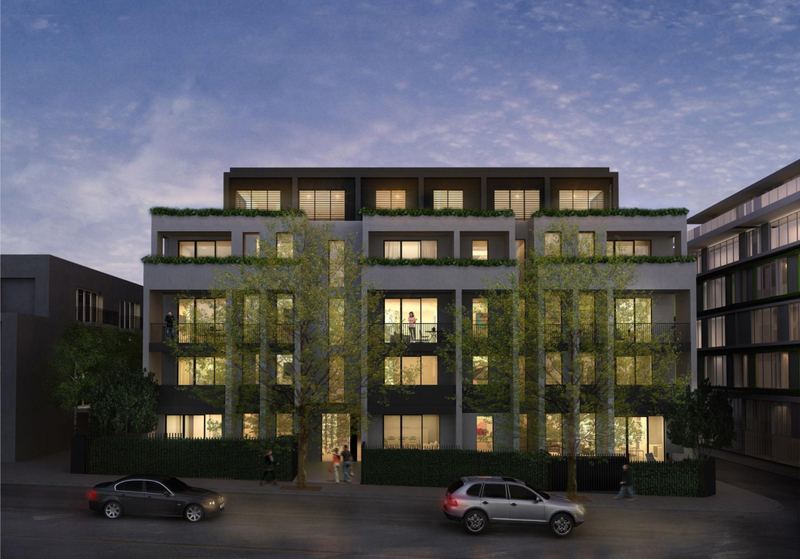 The Merriwee Crescent Residence is an enduring, modern project. 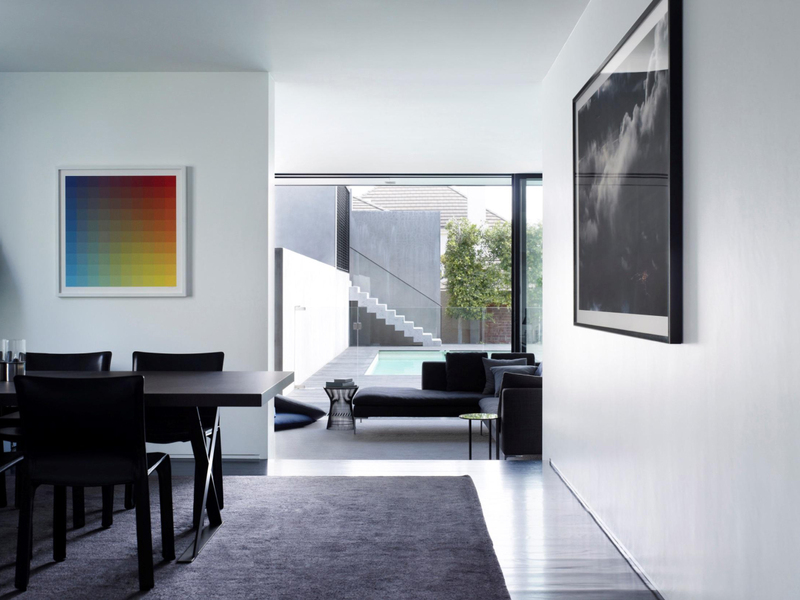 A 5 metre atrium space forms the main axis of the house around which three bedroom suites, two living spaces, a study and dining room are grouped. 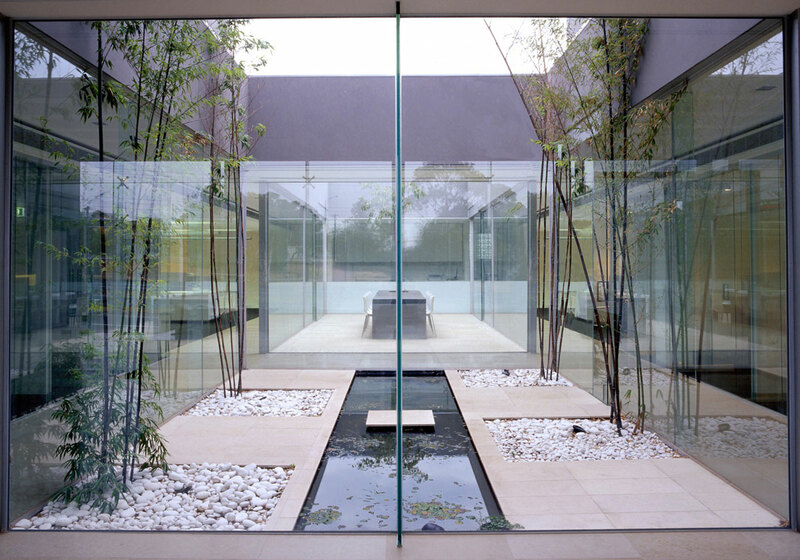 Terraces flow from each space to the garden and a glass bridge leads to a lush pool pavilion including a spa and steam room. 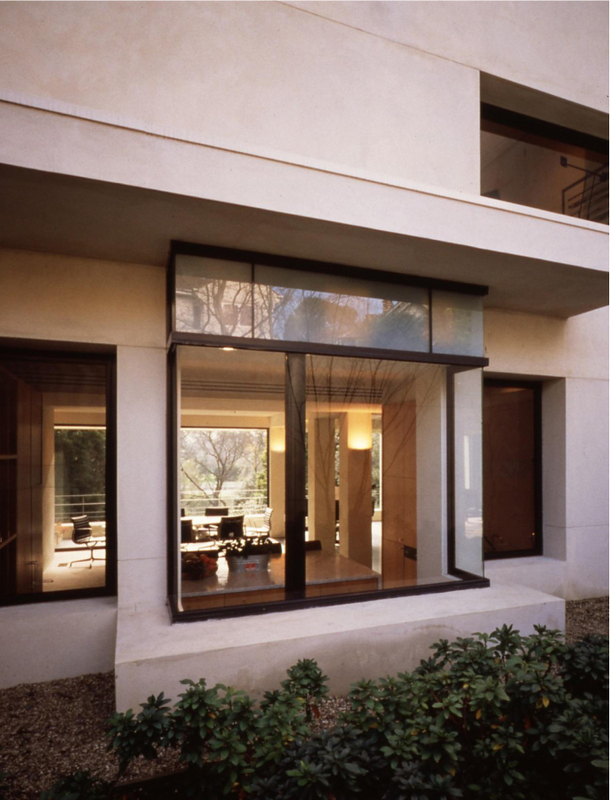 This residential project involved alterations to the existing 1920’s residence and the design of a new glass pavilion facing north adjacent to the tennis court. 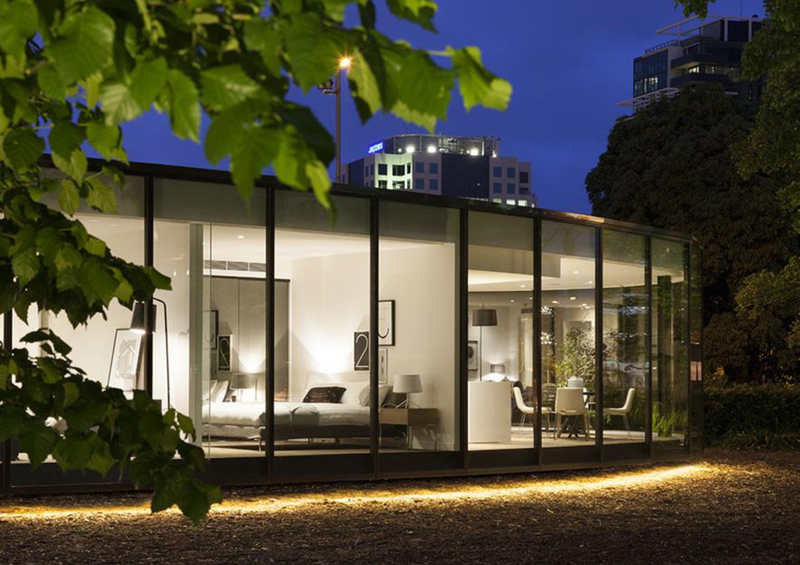 Designed as a counterpoint to the solid and closed existing building, the pavilion is light, transparent and open. 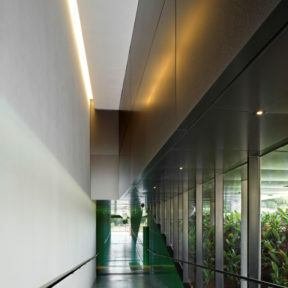 It provides a translucent glazed entry link between the two buildings, an informal living space and an office/studio. 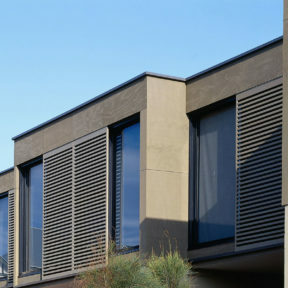 Working within the perimeter walls of an existing heritage building, Carr’s brief was to design and administer the construction of two new townhouses. 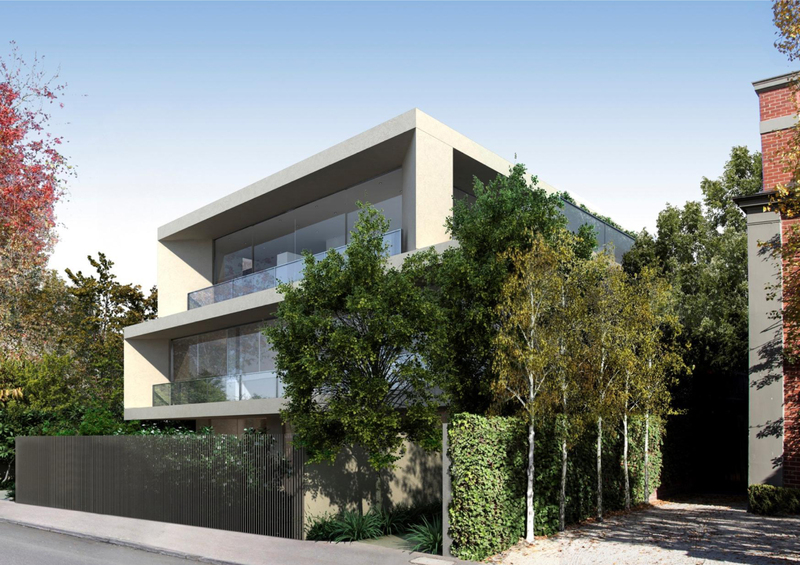 One residence was to be occupied by the owner with 3 bedrooms, 2 bathrooms, a plunge pool and two car garage, whilst the second was to be sold on completion with a courtyard and off street parking. 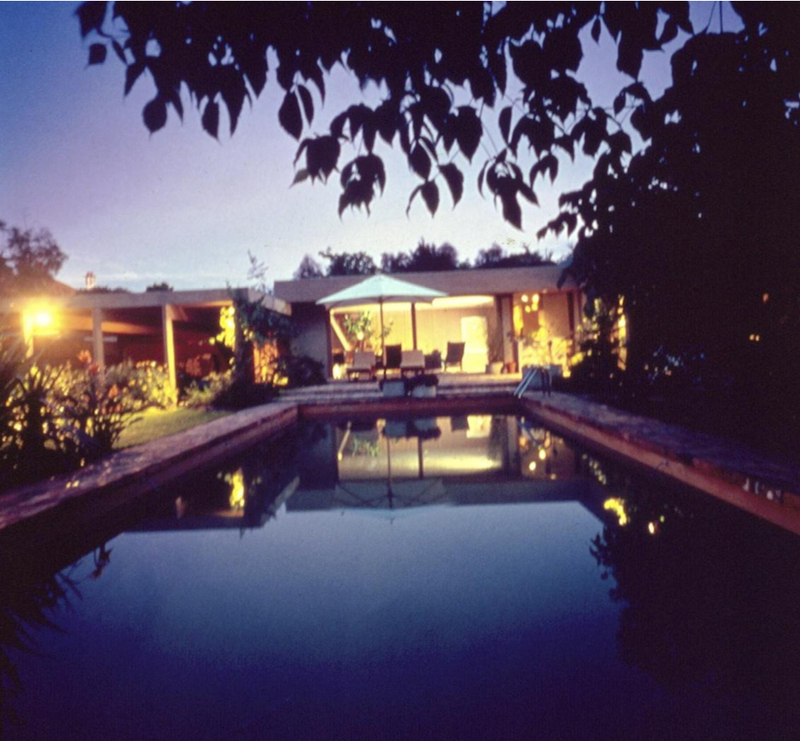 An overseas resident, the client purchased this three bedroom property to use as a base when visiting Melbourne and engaged Carr to complete a soft refurbishment. 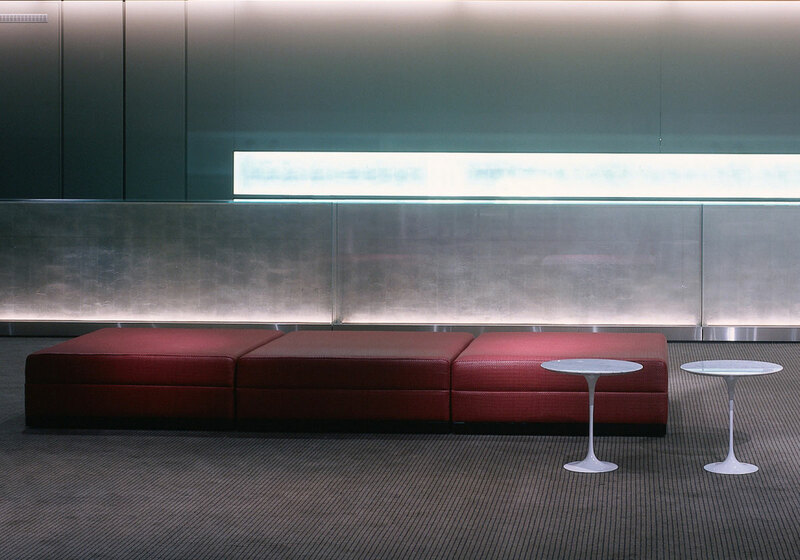 Many of the furniture pieces and accessories were custom designed and made to suit the client’s requirements for function and aesthetics. 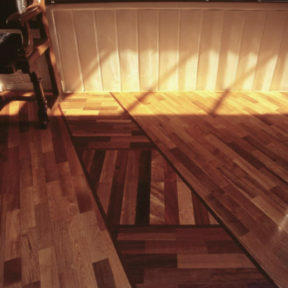 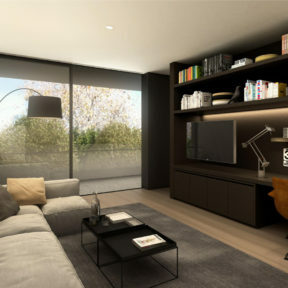 The result was a completely tailored and personalised interior. 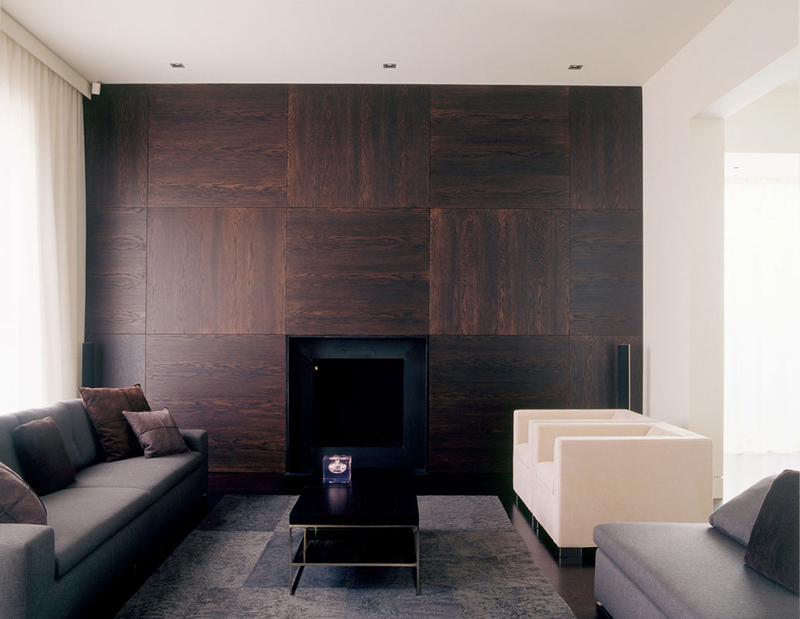 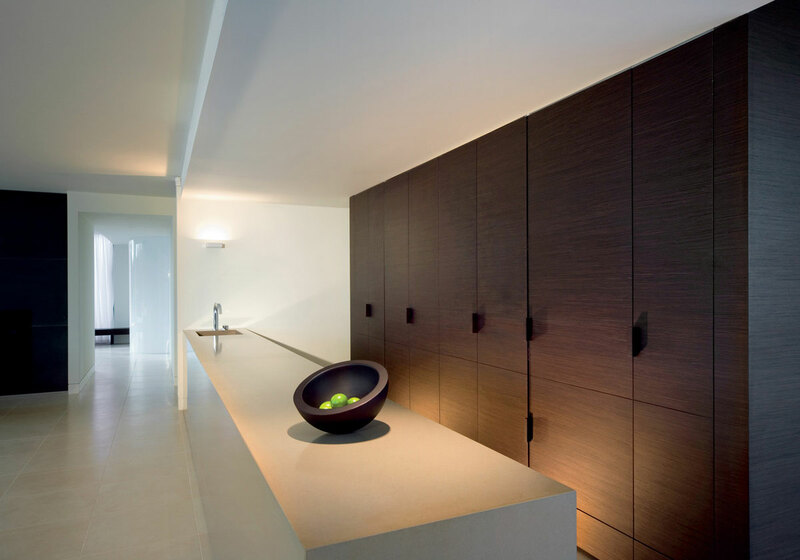 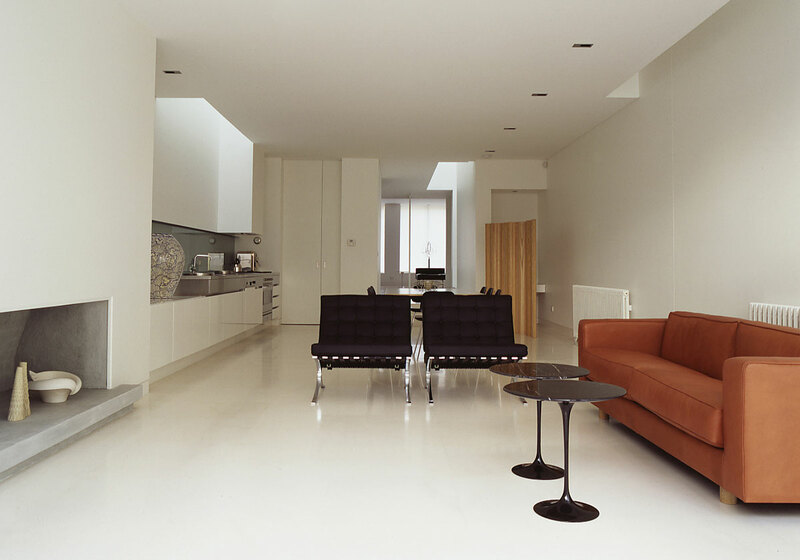 A contemporary residential interior with a refined elegance was the defining brief for this project. 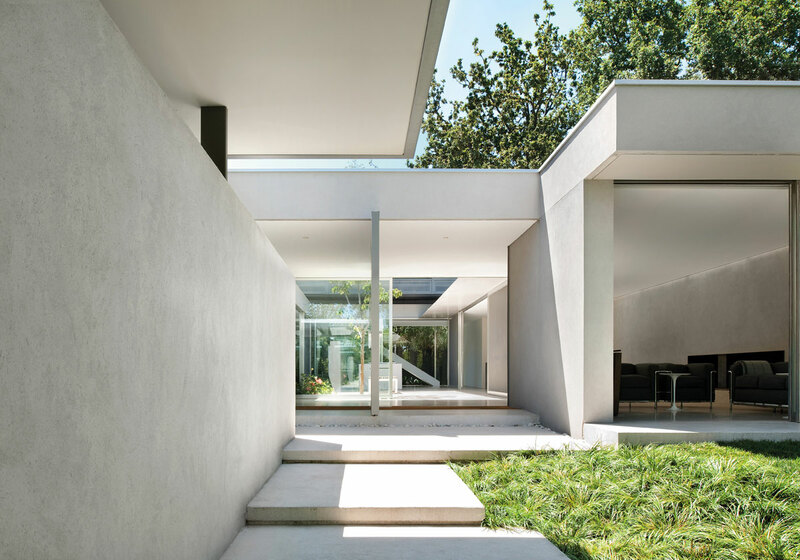 Adjustments were made to the original architectural layout, re-planning to increase the sense of space and flow between different areas, with improved access to natural light and ventilation. 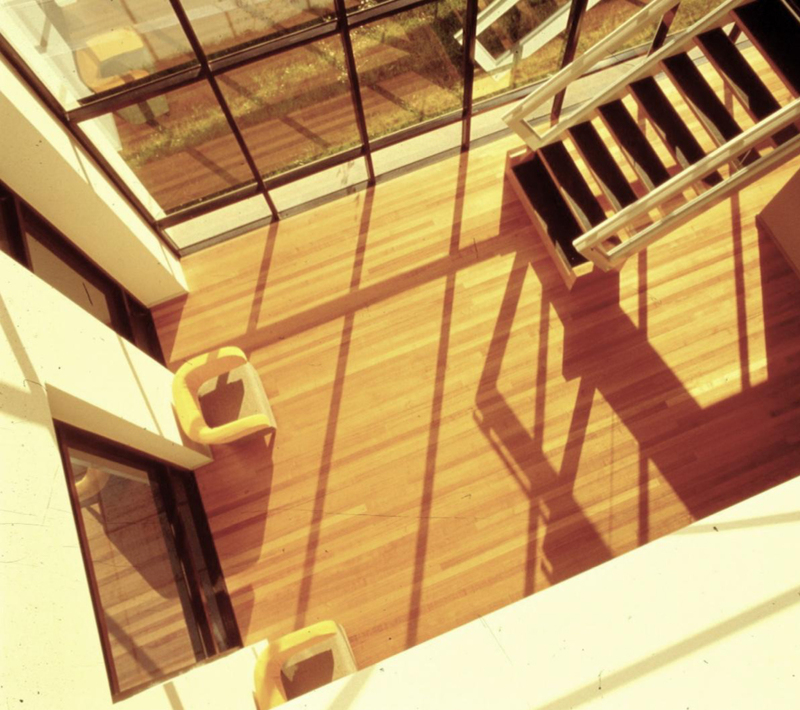 The revisions addressed the requirement for north facing, sun-filled living areas. 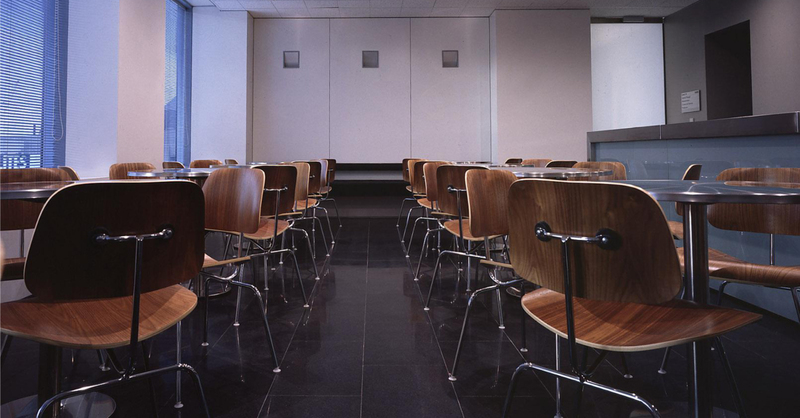 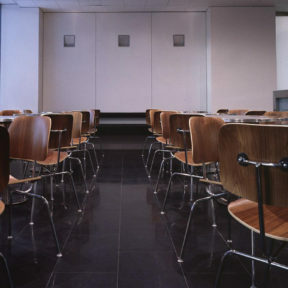 The use of large sliding panels and flexible furniture layouts greatly increase functionality. 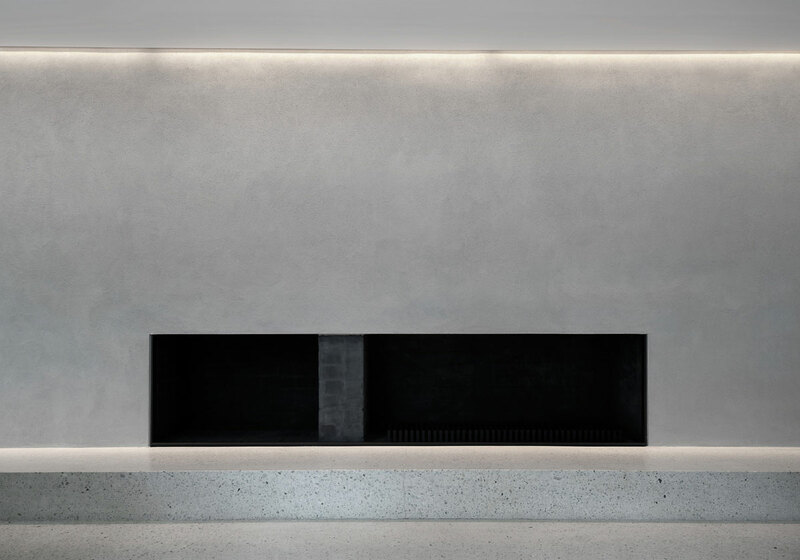 The Melbourne residence is a luxury family home designed with careful attention to the integration of external spaces and maximisation of light into the living areas. 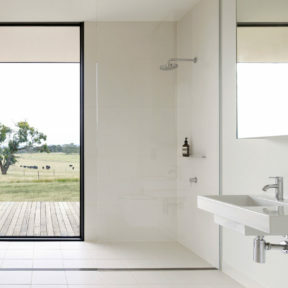 Large panes of clear and translucent glass allow connection with the surrounding environment and abundance of light. 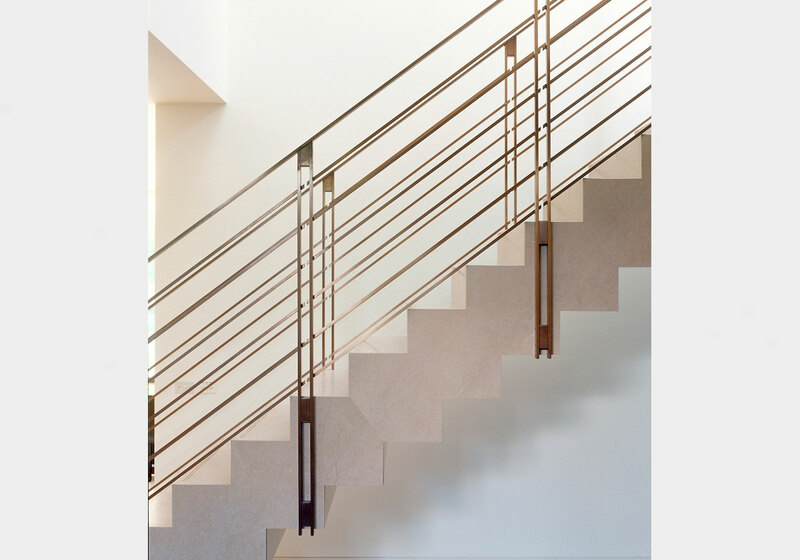 A neutral scheme provides continuity of materials accented by the warm glow of bronze paneling and stair balustrade. 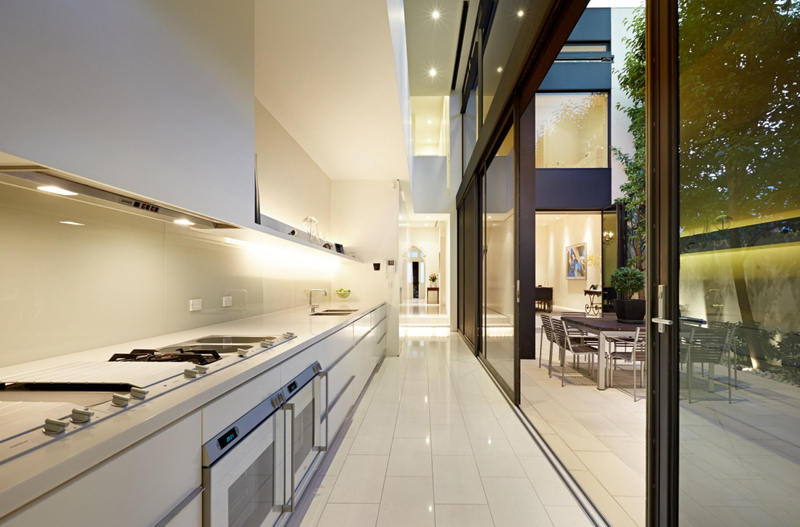 This project involved the consolidation of two urban sites to create a private inner-city sanctuary for the client. 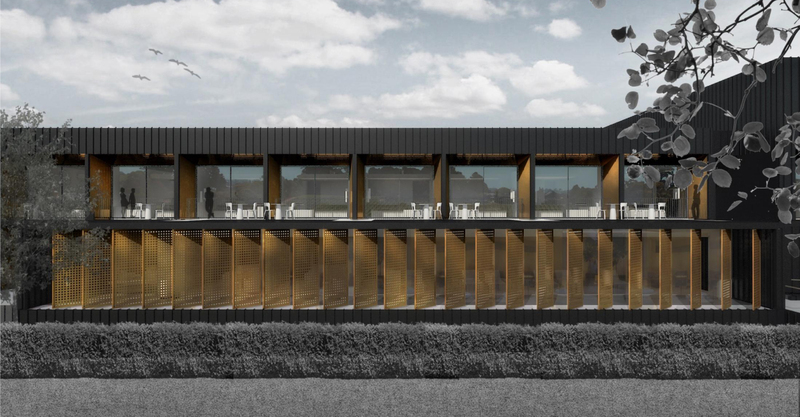 An existing building was demolished to provide space for a new north-facing landscaped garden, indoor pool pavilion and gym. 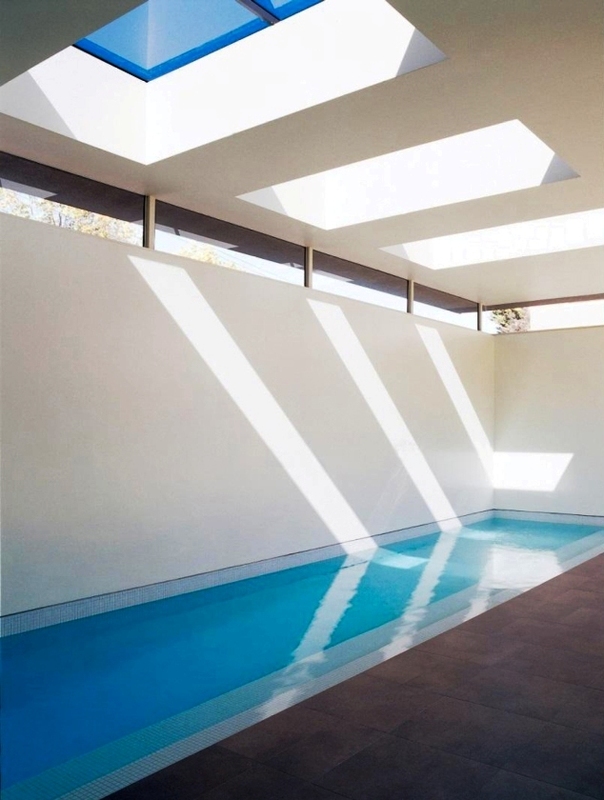 A series of skylights positioned over the pool create a dramatic play of light throughout the day, while at night the pavilion glows. 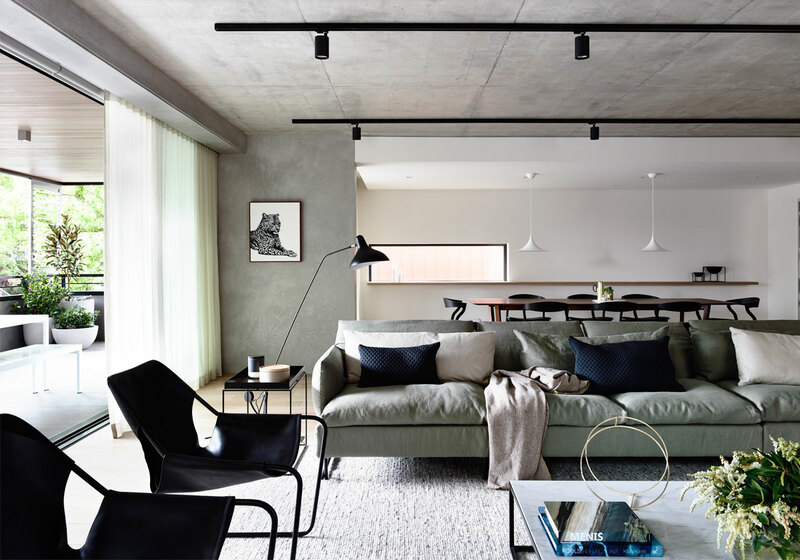 Presented with an apartment within Melbourne’s historic Herald and Weekly Times building, the brief was to create loft volumes, providing a canvas which to highlight and extensive collection of artwork. 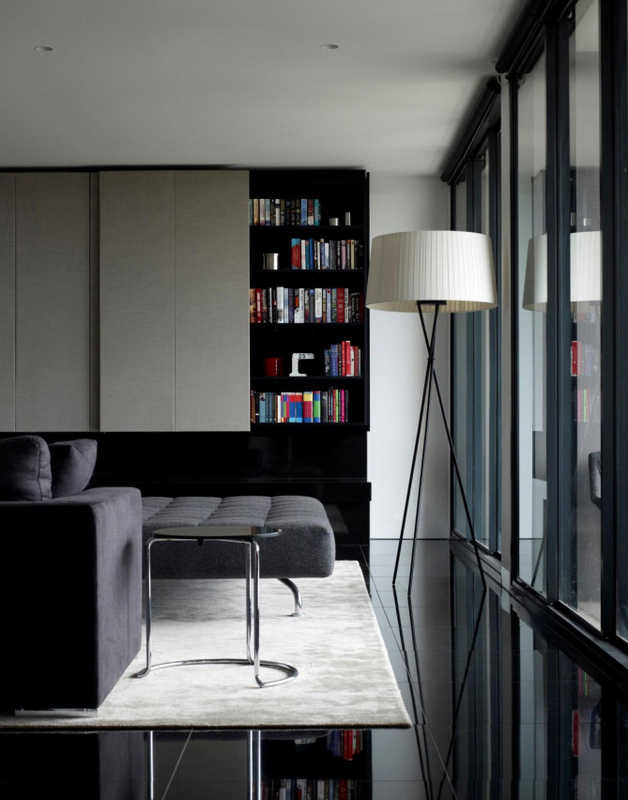 Achieving the client’s practical requirements for increased storage, the apartment has maintained the lofty, spacious feel of a New York style studio. 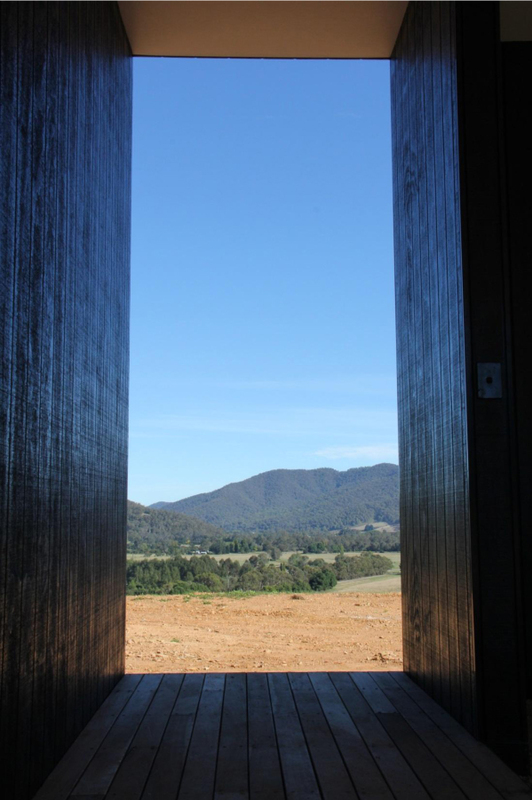 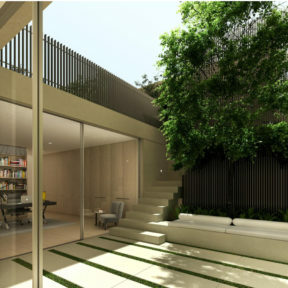 The Intermode design showcases full height sliding doors throughout allow for direct level access from all rooms onto the external timber decks and provide seamless access to the landscape beyond. 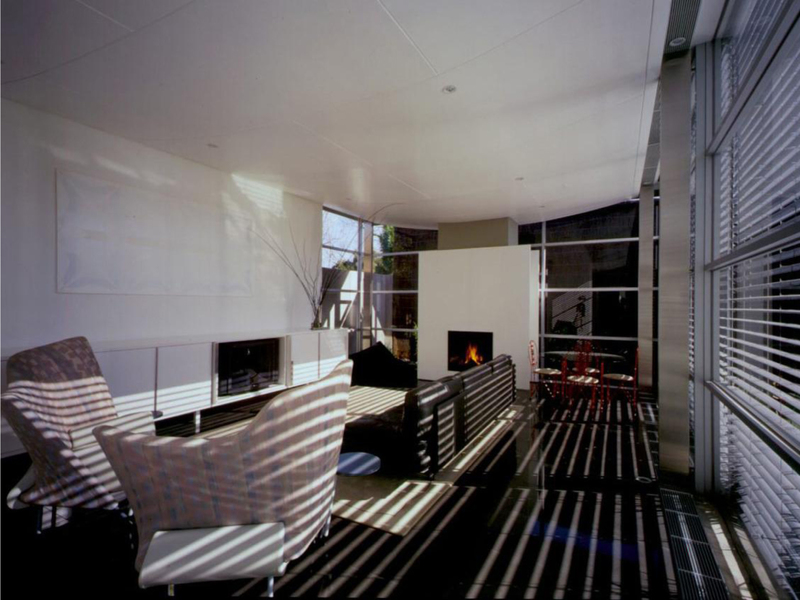 Large eaves over the decks provide protection, hence maximising opportunities for use in all weather conditions. 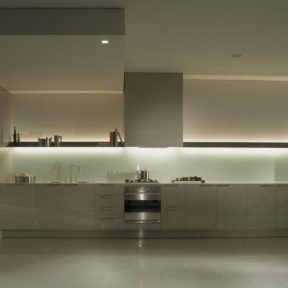 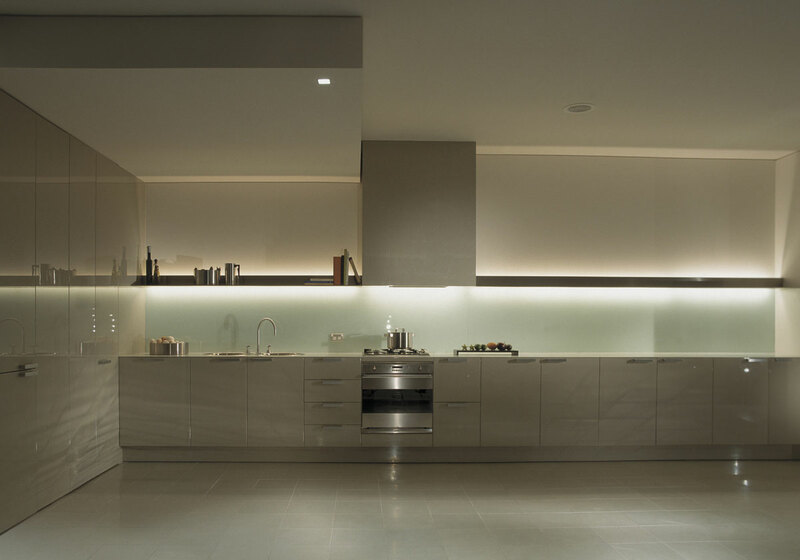 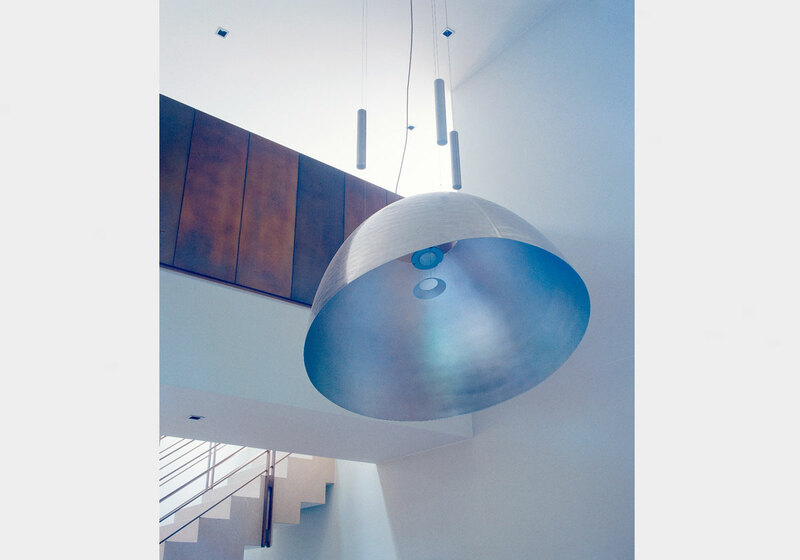 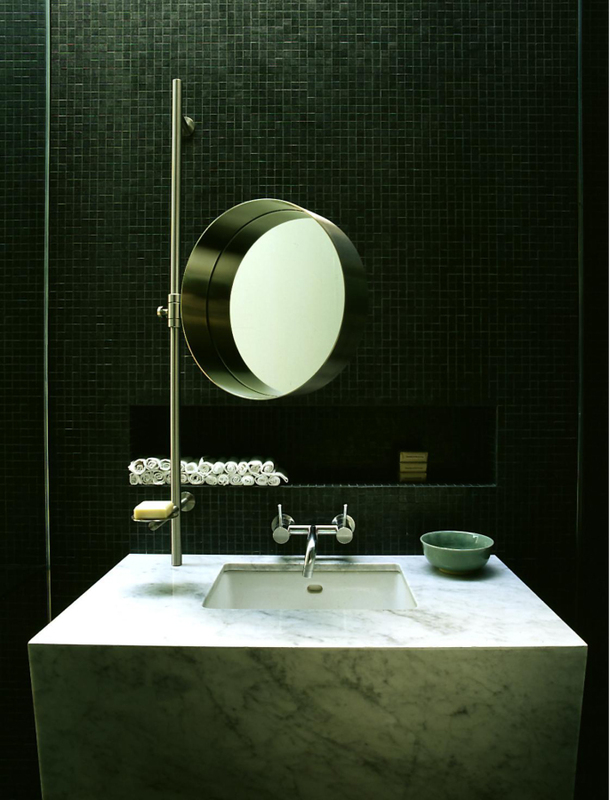 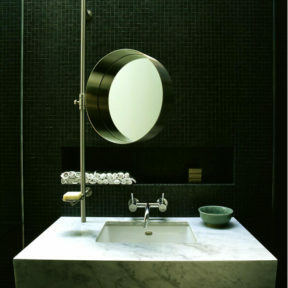 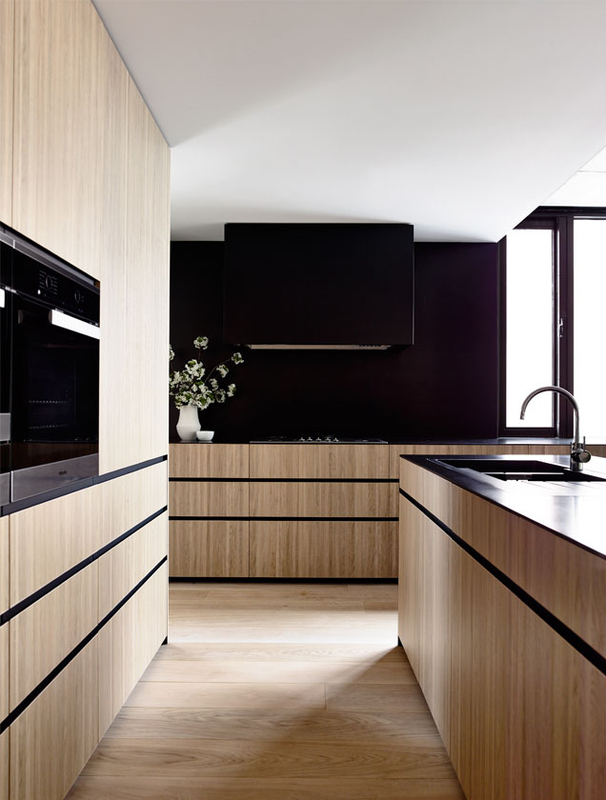 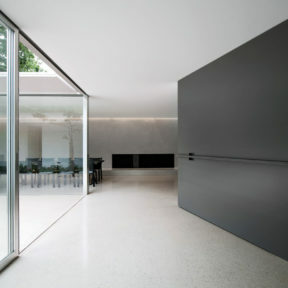 Modern without overt references, the design embraces shadow and light. 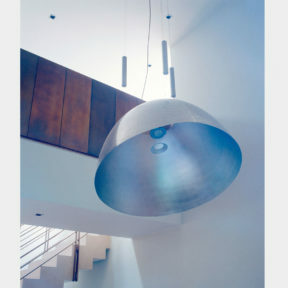 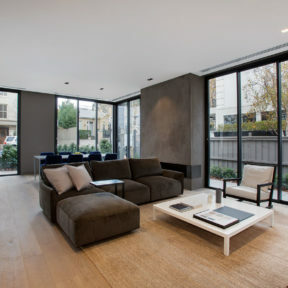 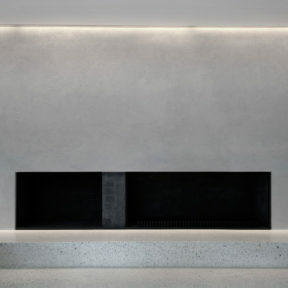 A refined palette of materials – cement rendered walls, honed concrete, steel, aluminium, glass – allude to a simplicity of form and function reminiscent of houses built in the 60’s and create a compelling rhythm of opposites: solidity and transparency, light and dark, cool and warm, hard and soft. 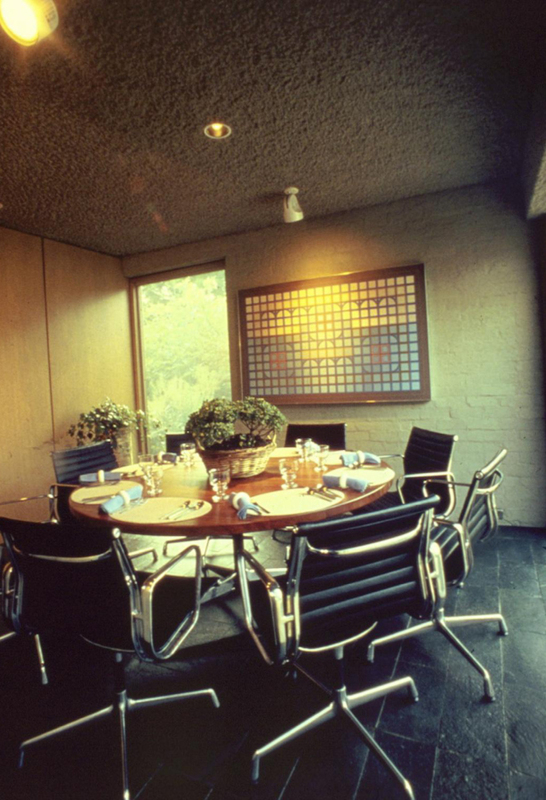 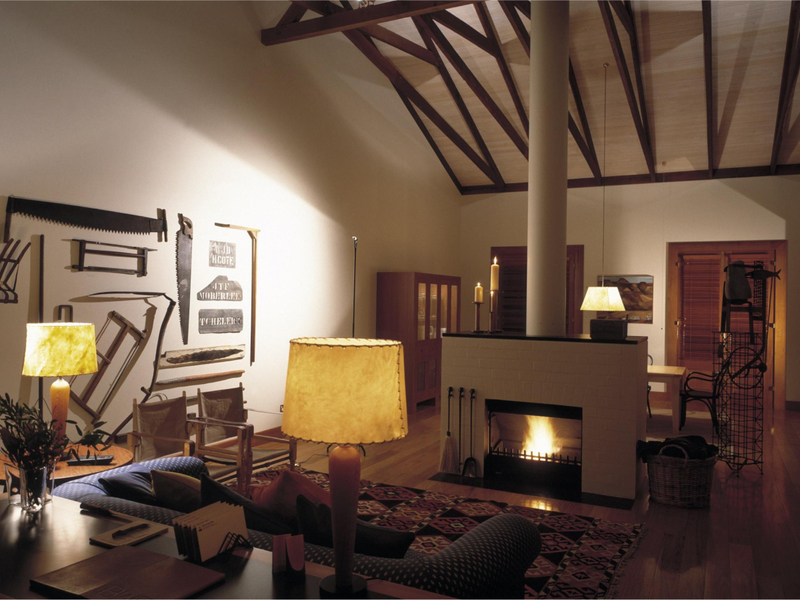 The Intermode house at Kilmore, 60km north of Melbourne, is approximately 500 acres and used for cattle farming. 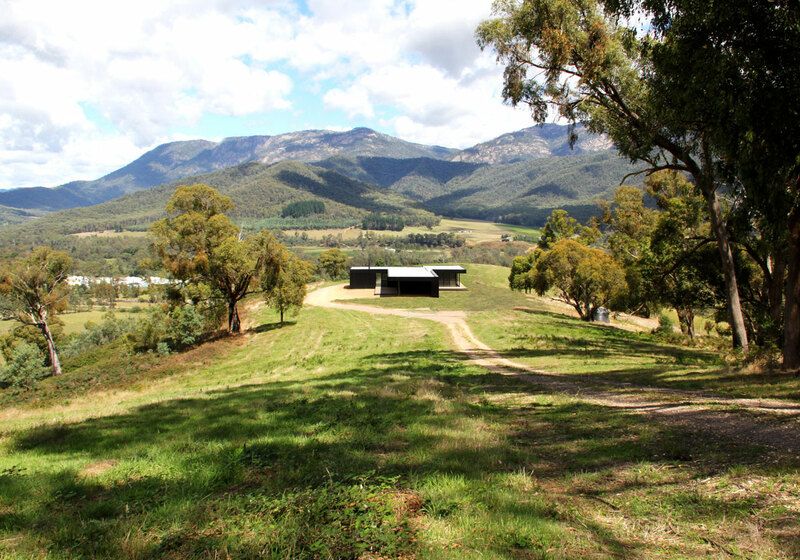 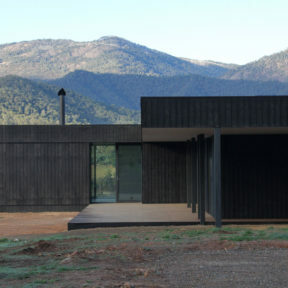 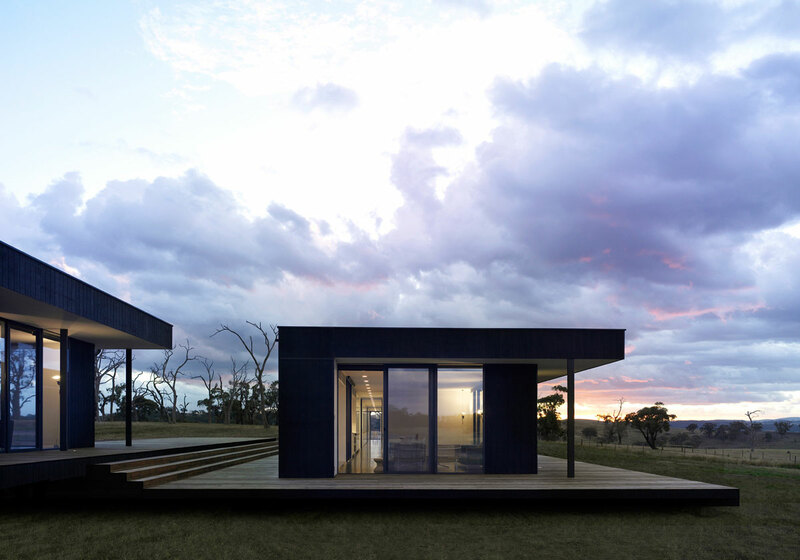 An open site with only slight fall, the house is sited within a paddock. 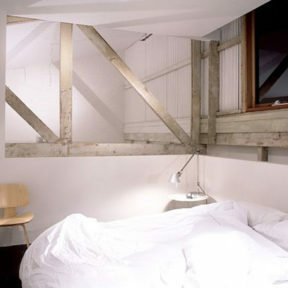 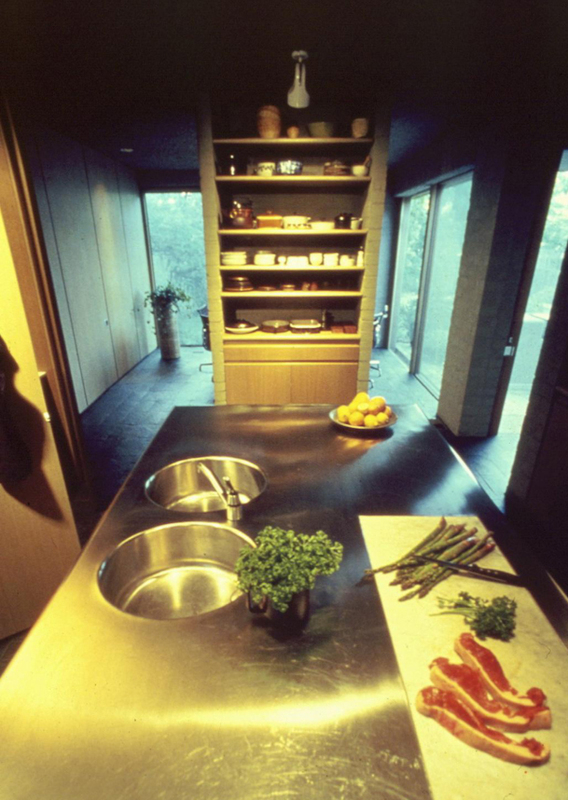 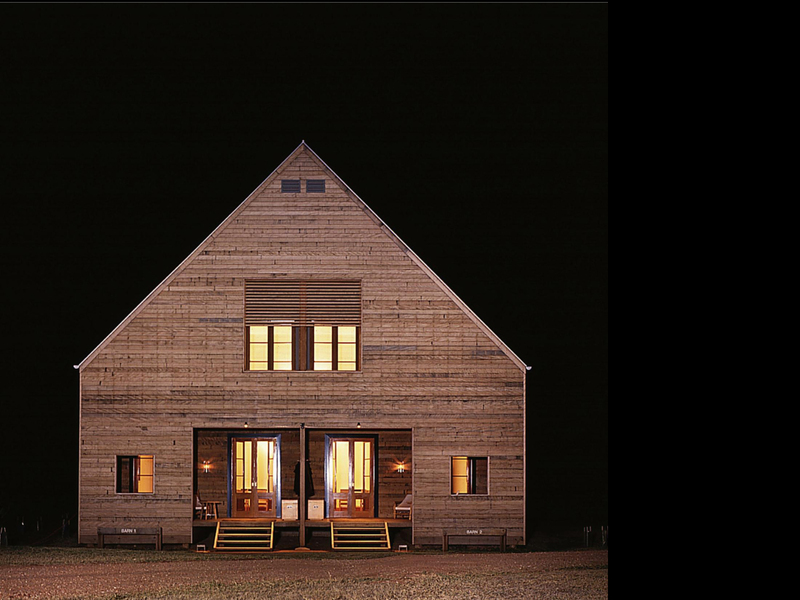 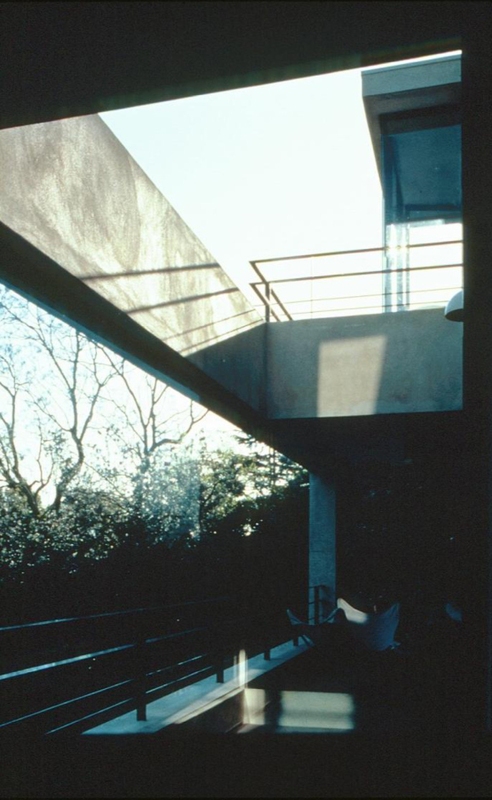 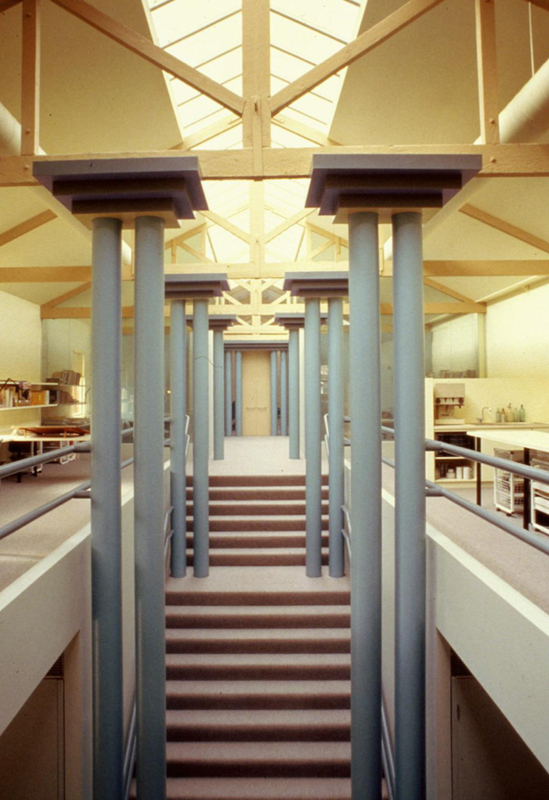 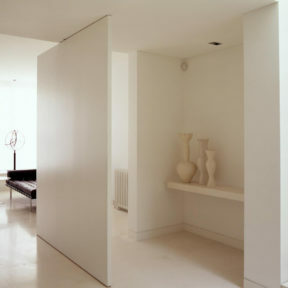 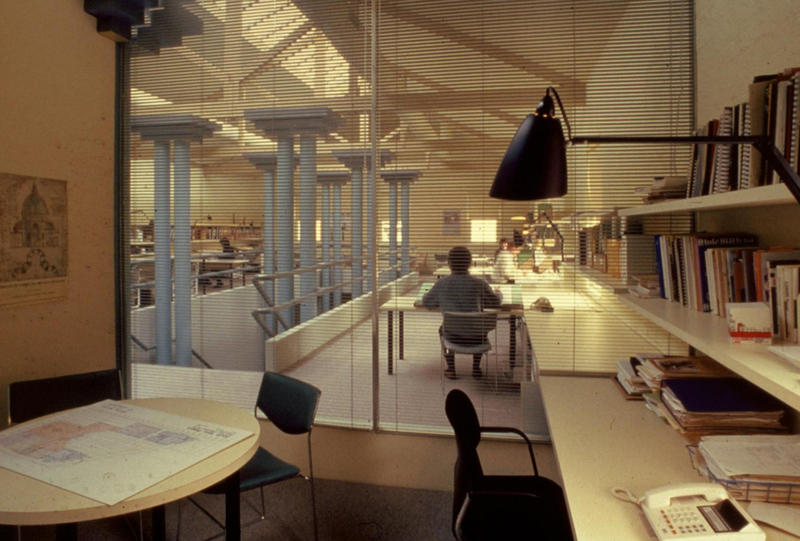 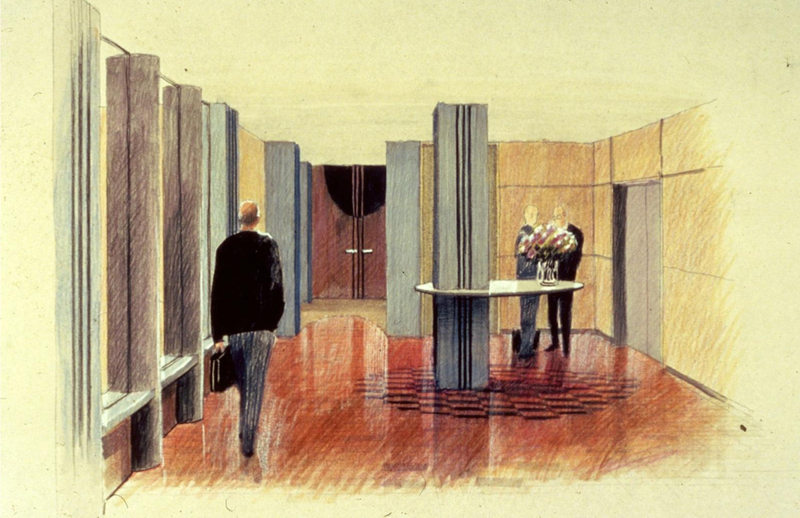 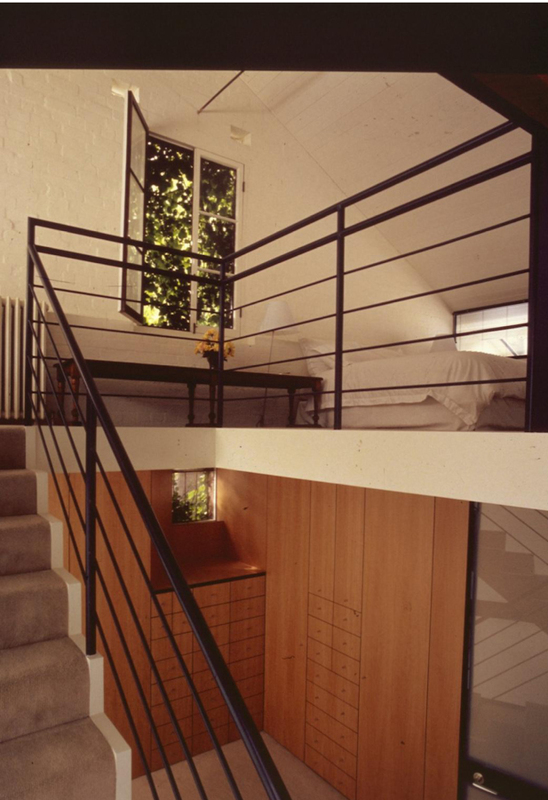 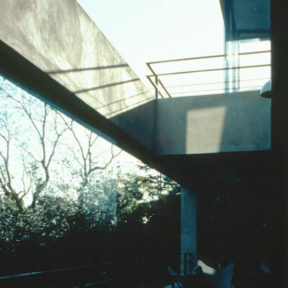 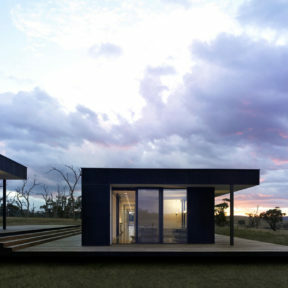 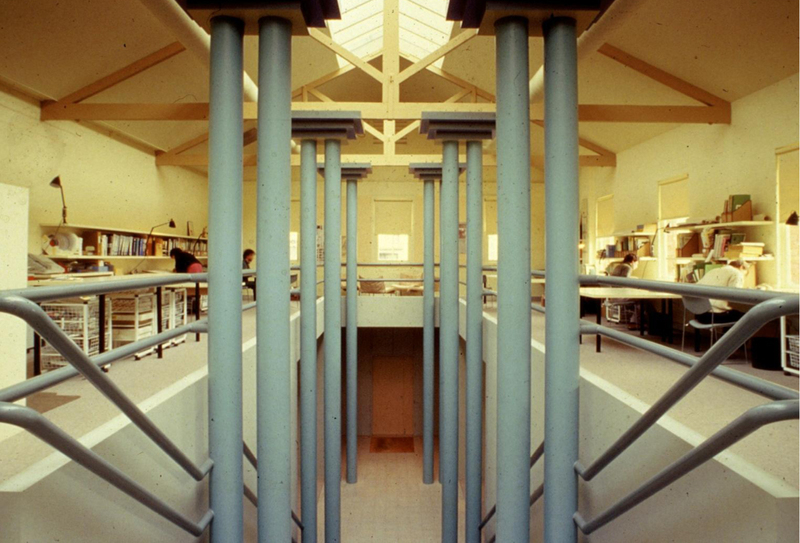 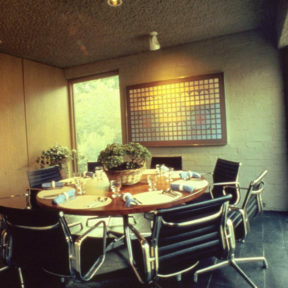 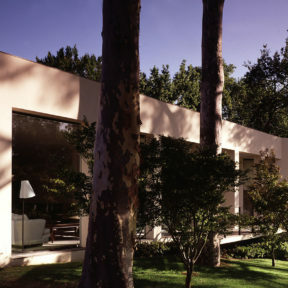 Embracing the modular philosophy, Carr designed the house as a series of pavilions, with multiple interstitial spaces. 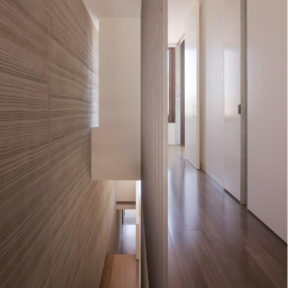 The house forgoes the typical notion of ‘front and rear’ opting instead for carefully sited seasonal areas. 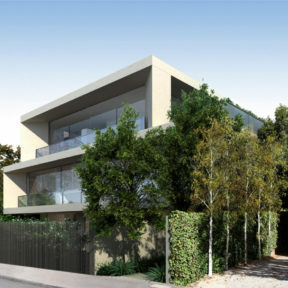 On Marine Parade, overlooking Port Phillip Bay, the project required the demolition of an existing smaller residence to make way for the new three level dwelling. 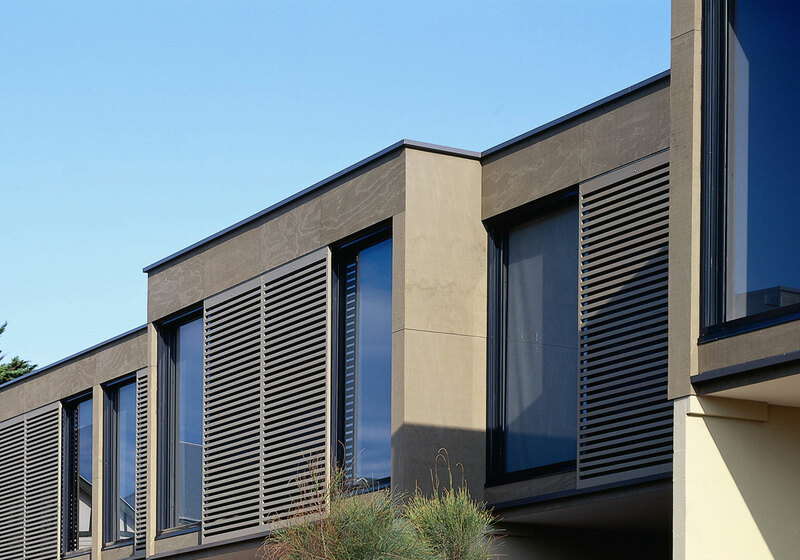 Responding to council requirements, a traditional pitched roof is inverted providing an awning to the façade. 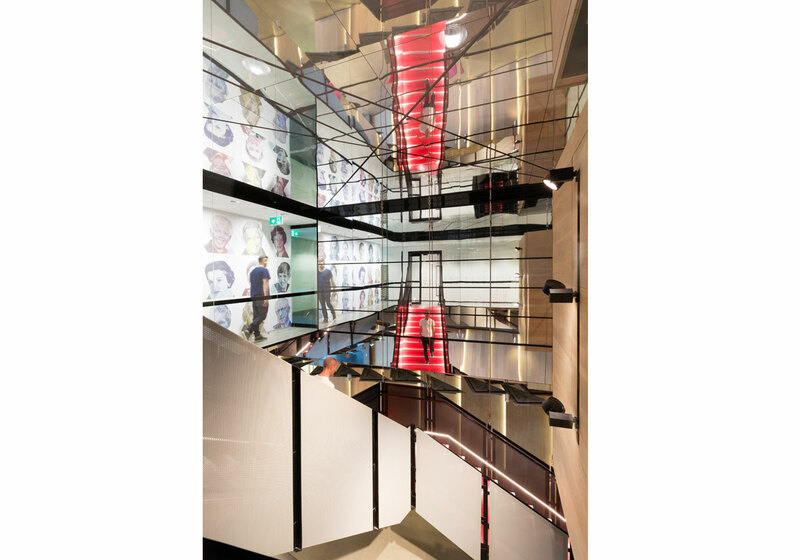 Each level adopts a distinct purpose connected by a striking spiral staircase and a tonal grading materials palette leads you through the spaces. 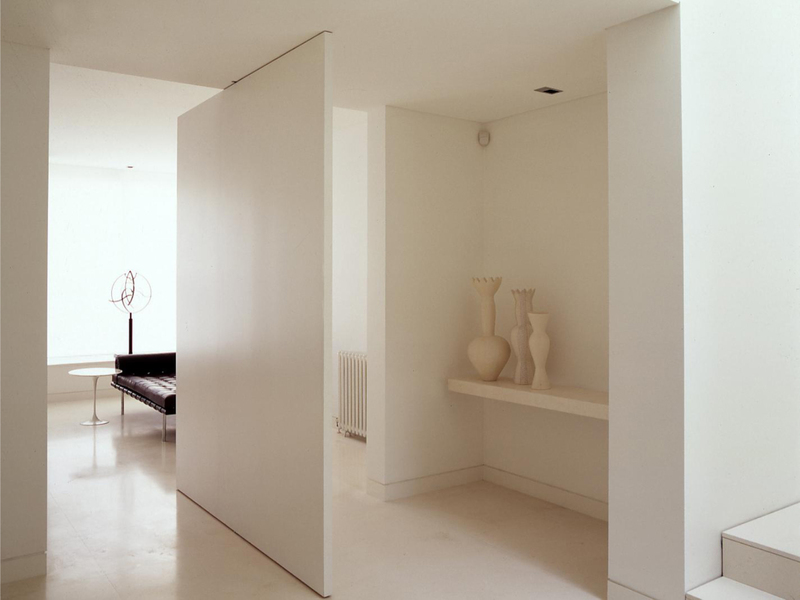 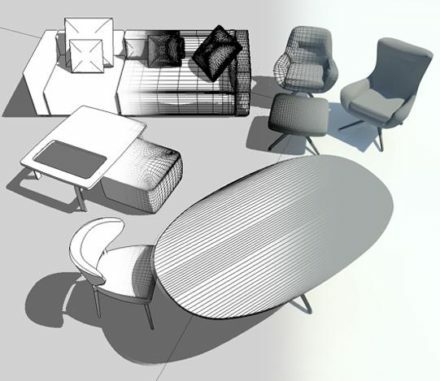 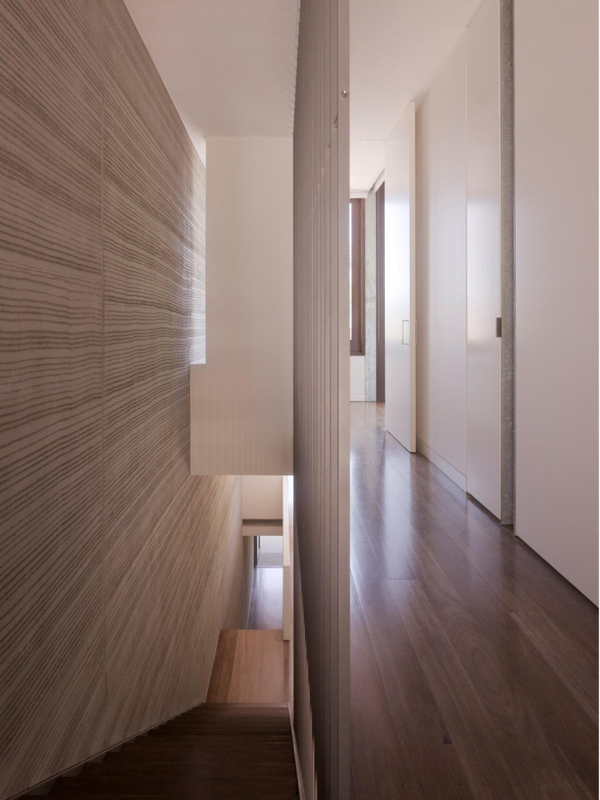 After a costly and time consuming experience with another architect, the clients looked to Intermode to provide an alternative approach for building their three bedroom, two bathroom home. 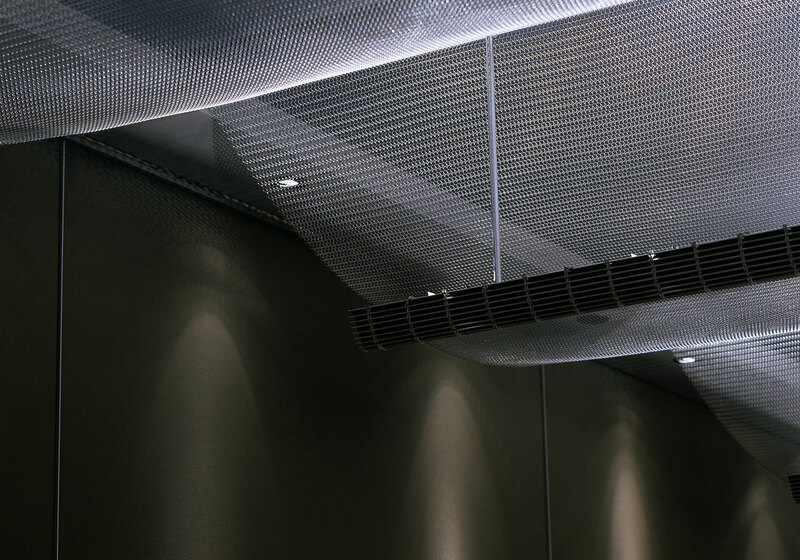 Embracing the modular design, Carr and Intermode worked together to exceed quality expectations and deliver the project to meet their budget in just six months. 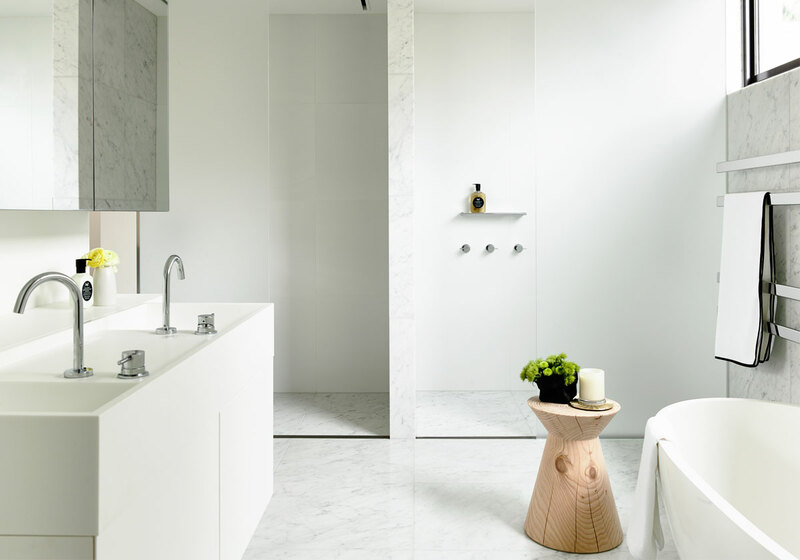 Perched high above the skyline in the iconic Melburnian building, the apartment exudes a sense of calm high above the inner city activity below. 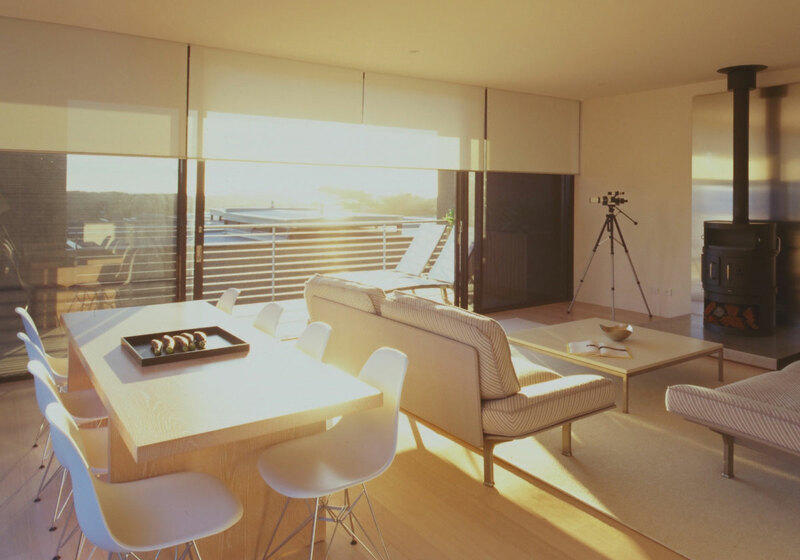 The planning repositioned the living and dining spaces to run the length of the panoramic views. 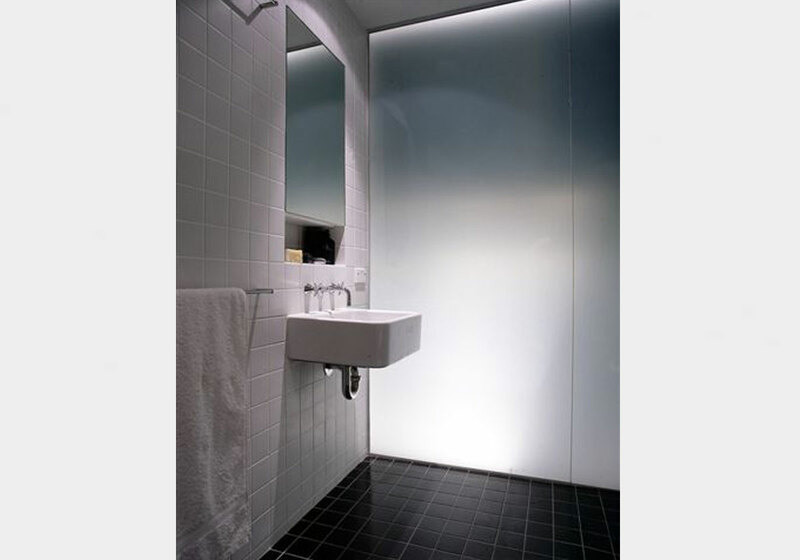 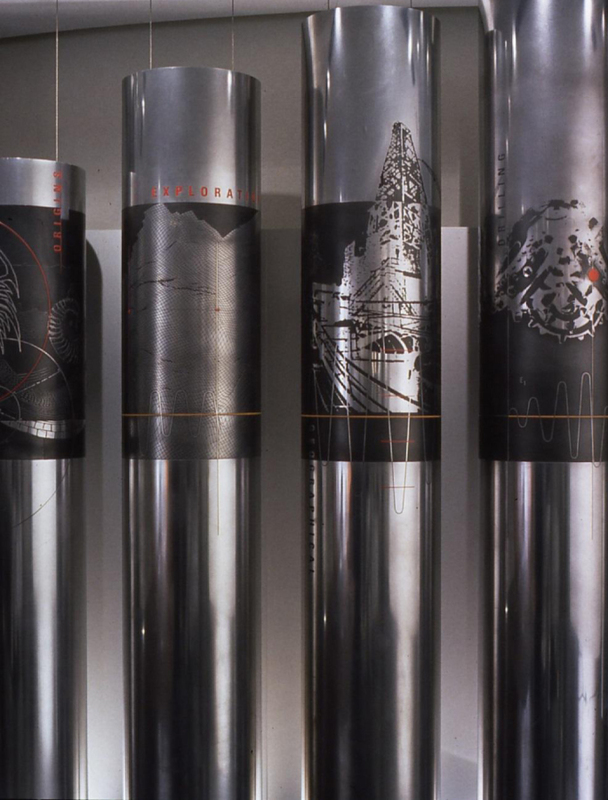 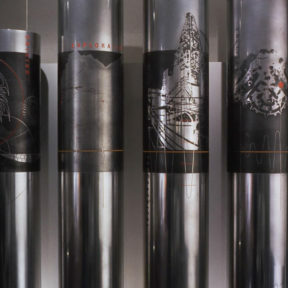 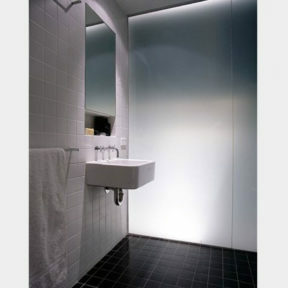 Glossy and mirrored materials were specifically selected to reflect the city lights. 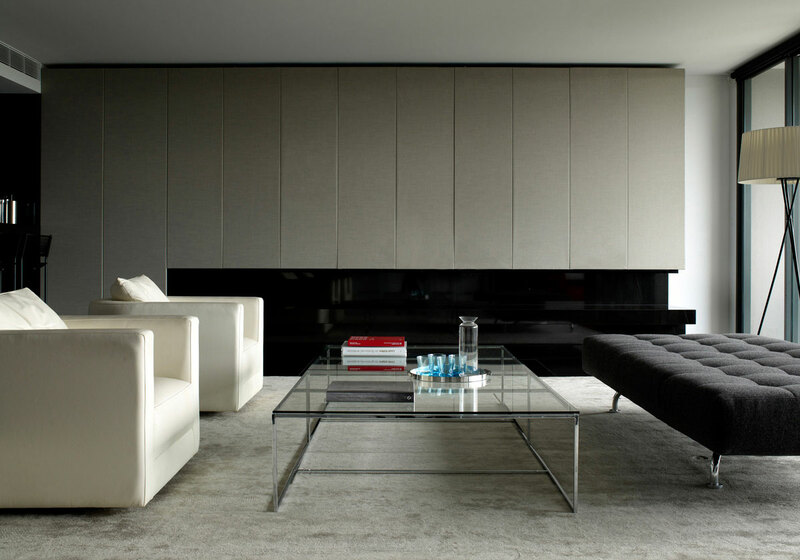 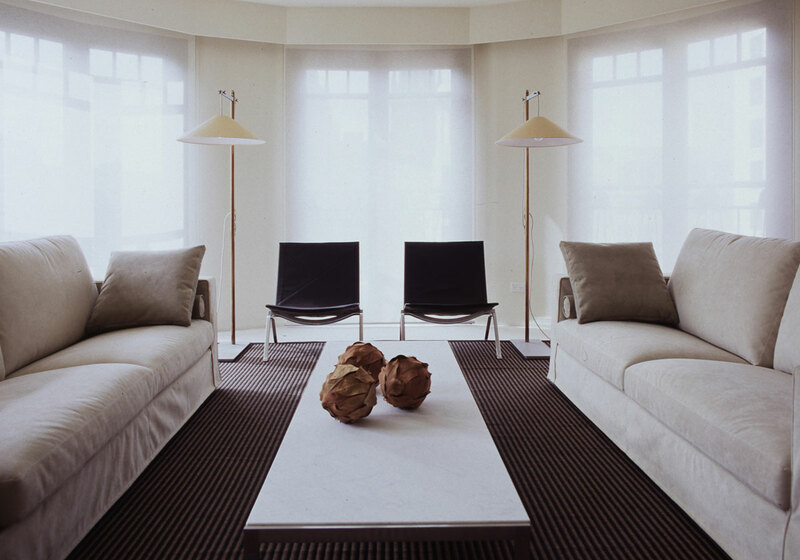 Balancing the overall composition, the use of soft grey and clean lines offers serenity and order. 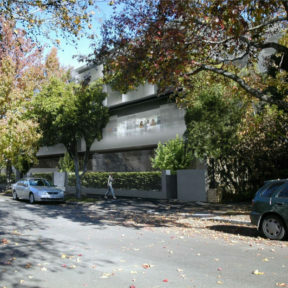 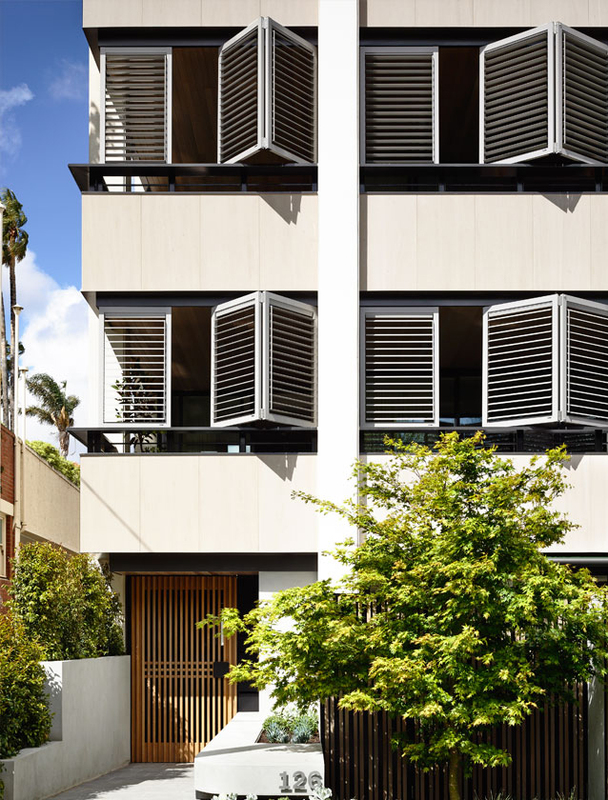 Built in 1929 the property began life as two duplexes, one of which was originally inhabited by the artist Sunday Reed before her move to Heide Gallery. 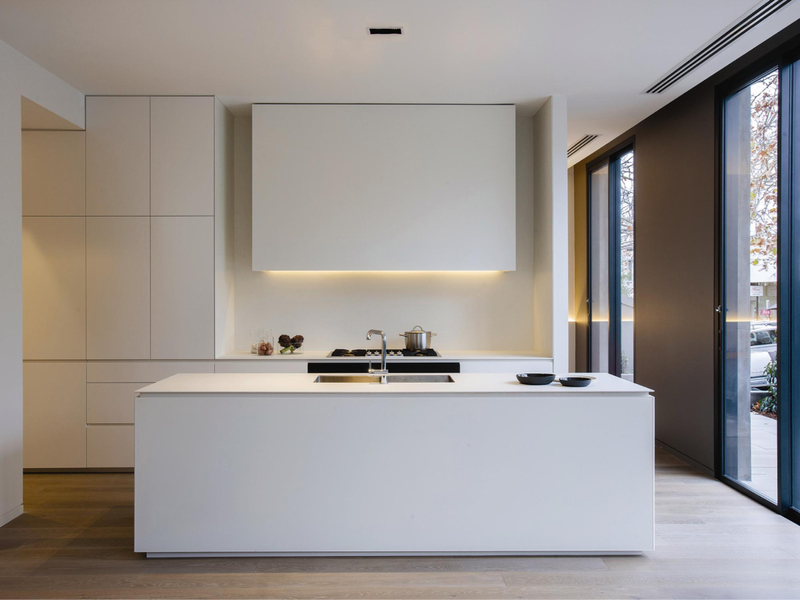 Positioned in Melbourne’s Domain precinct, the completed residence meshes character filled historic architecture with the crisp detailing of a modern addition to suit a family of five. 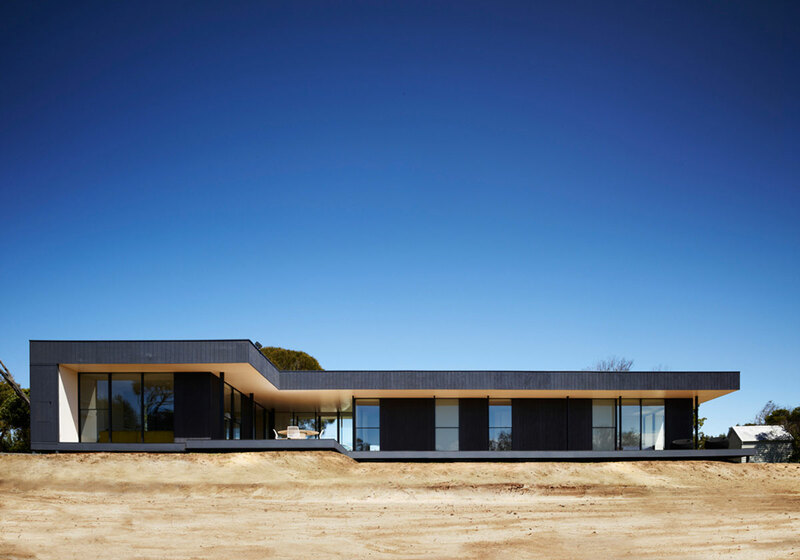 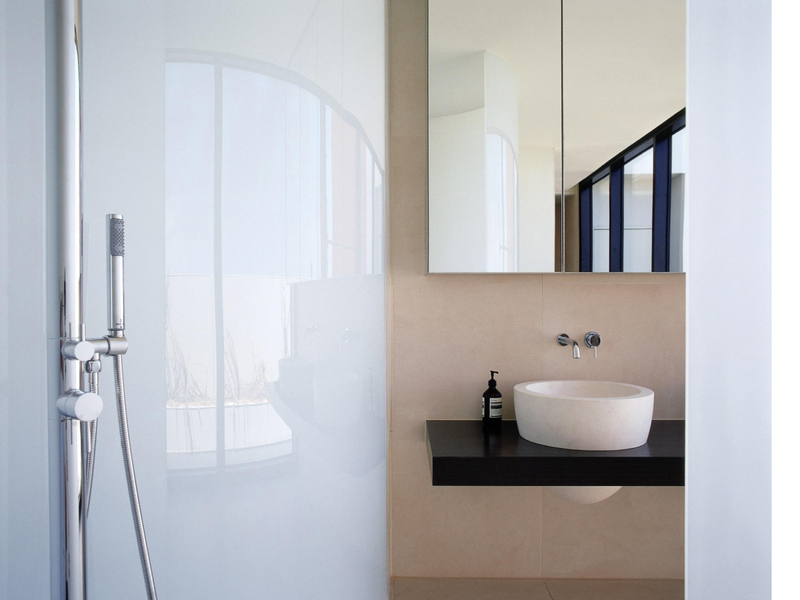 Situated in a popular coastal location on the Mornington Peninsula, the Blairgowrie Residence is a successful collaboration between Carr and Intermode. 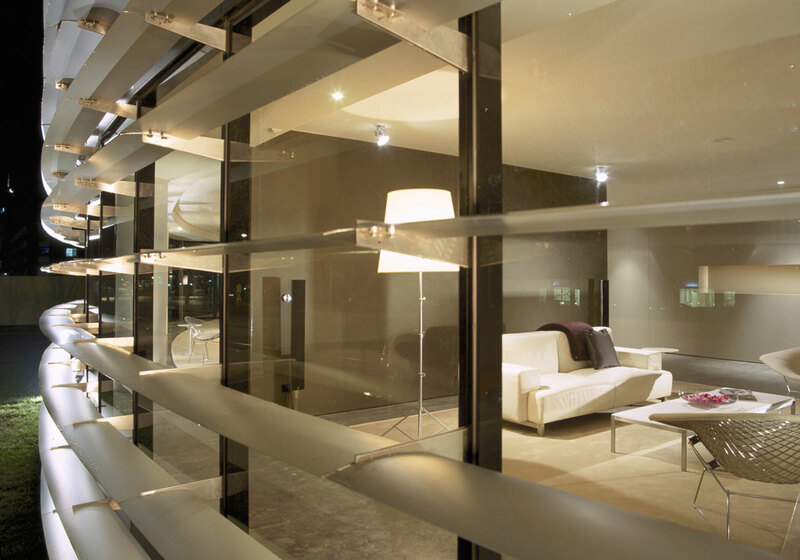 Utilising a highly refined modular design system, Carr has configured a linear solution to optimise the long and narrow block. 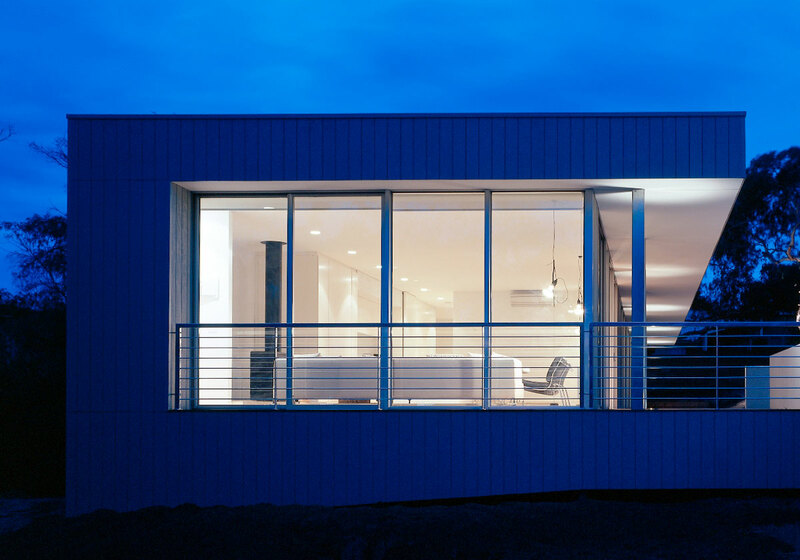 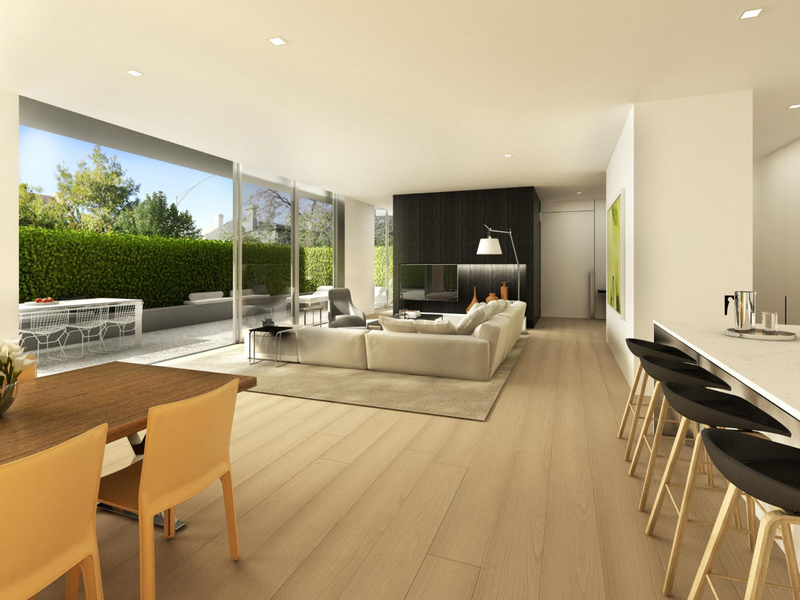 Exploring a well resolved sustainable planning solution, the house offers a comfortable atmosphere without excessive energy consumption and earns 6.6 star energy rating. 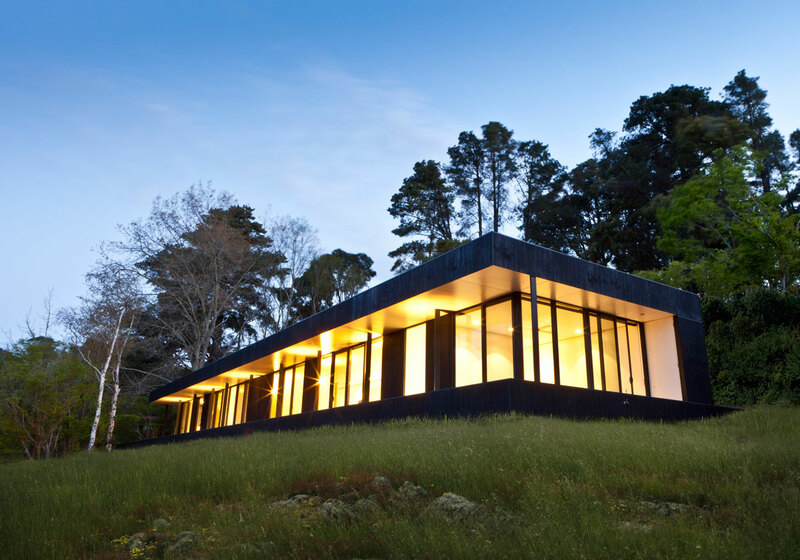 Brilliantly positioned on an elevated ridge-line overlooking Mount Buffalo, the Bright Residence is an ideal setting for the Intermode modular architecture which offers a choice of panoramic views. 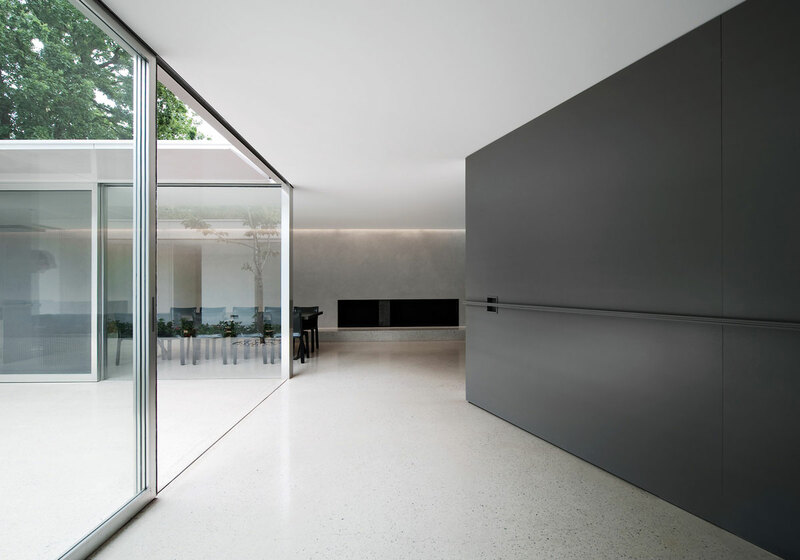 The house’s positioning optimises view corridors whilst floor to ceiling windows provide unhindered connectivity to the surrounding landscape. 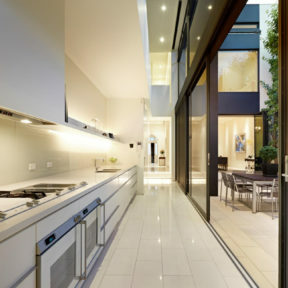 Situated on a large block in Melbourne, the family home exposes little to the street. 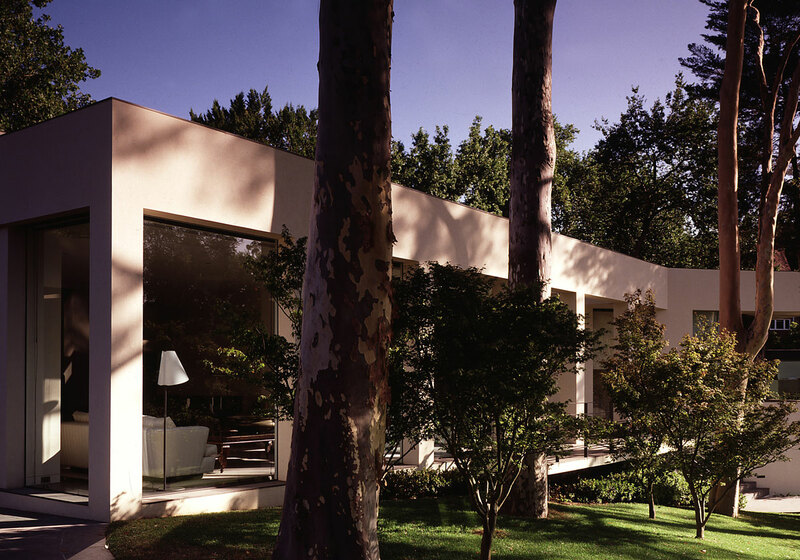 Behind the textured stucco wall a striking house is revealed within a lush secret garden. 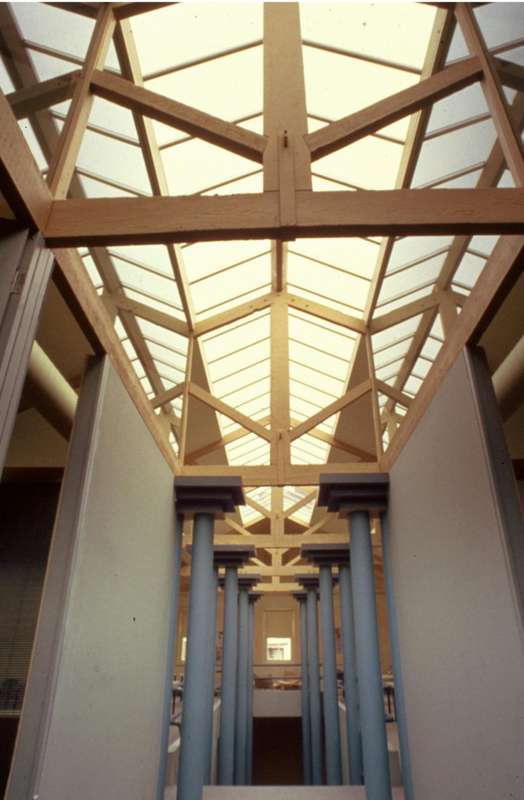 The rhythm of the colonnade and overall proportions evoke the elegance of Georgian architecture. 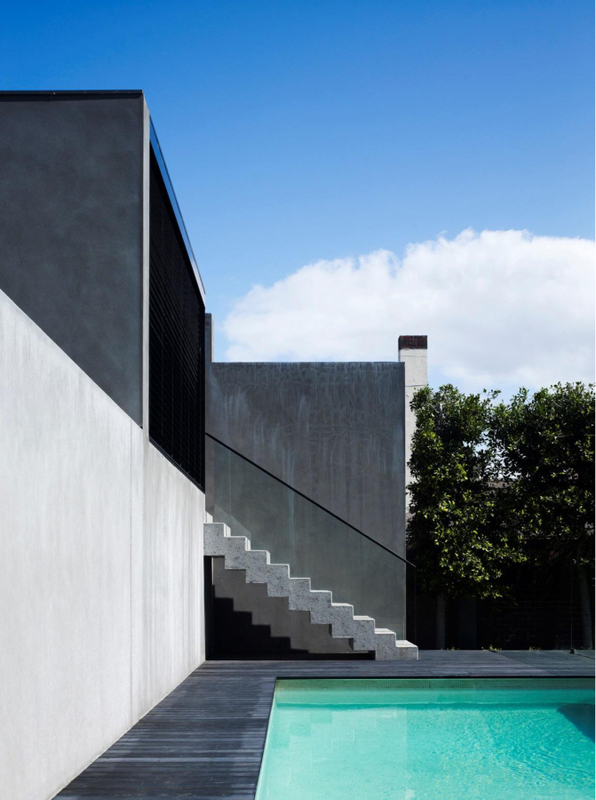 Conversely the house is bold and contemporary with its robust steel frame supporting a finely detailed metal screen and zinc cladding. 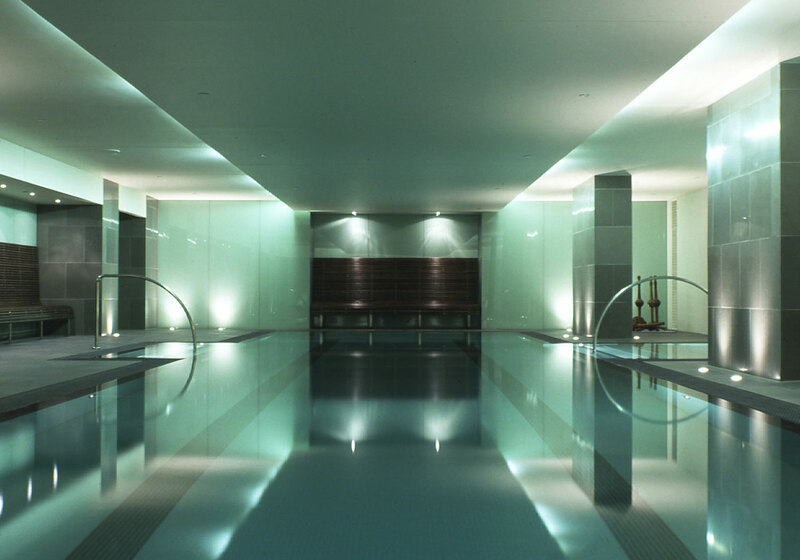 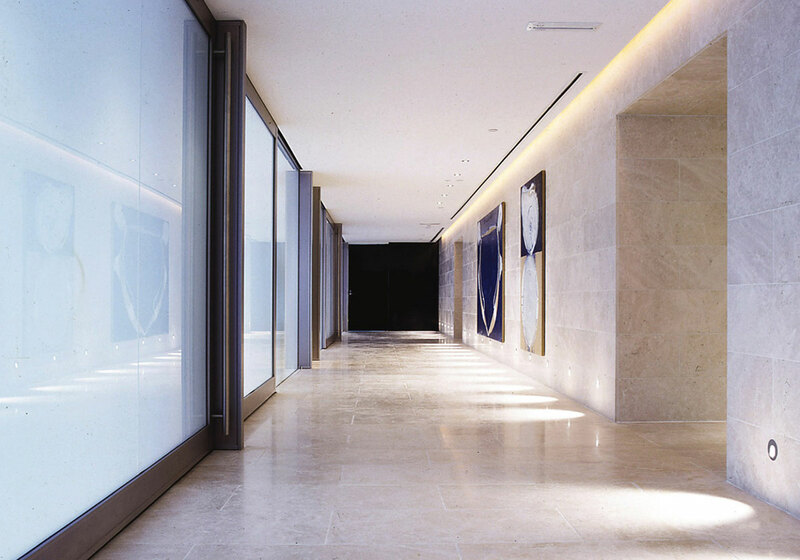 The site of a former office block, Marquise is a complete transformation into a luxury residential complex. 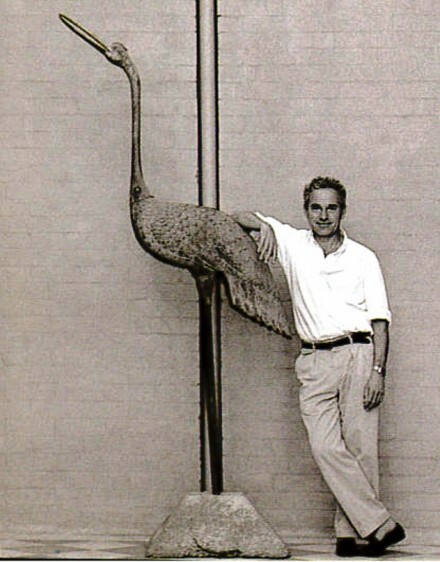 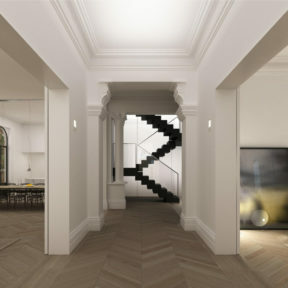 A Sculptor and Architect were engaged to conceive a unique boutique lifestyle development comprising 60 apartments. 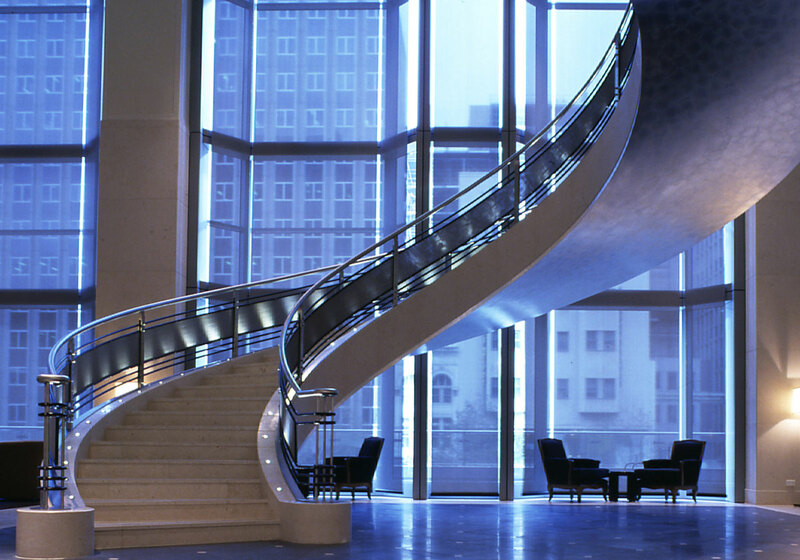 Carr was involved in architectural concepts from the beginning of the project and oversaw all interiors to bring an iconic presence to the building and define new standards in multi-residential building. 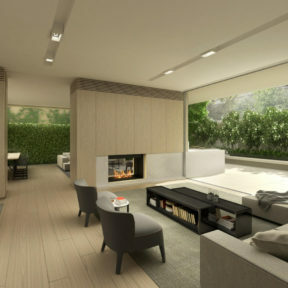 Debonair Development is a low cost multi-residential coastal community comprising of 14 beach houses. 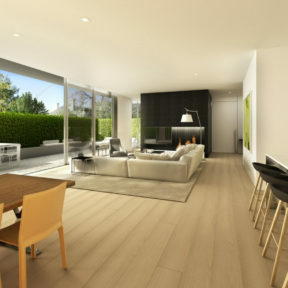 Each house is based on a space and cost effective module with ‘add on’ elements according to site, accommodation mix and specific client needs. 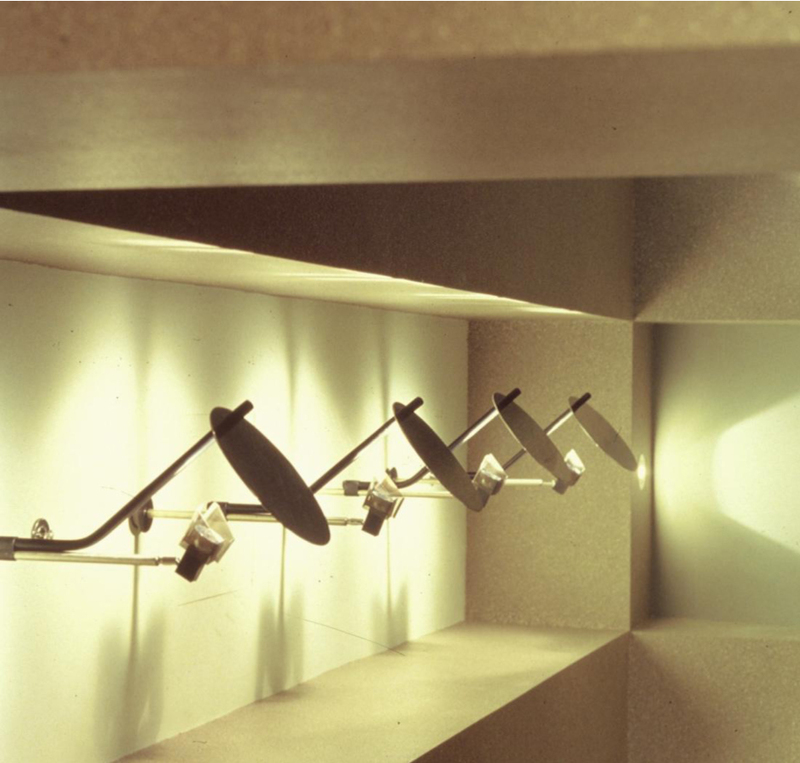 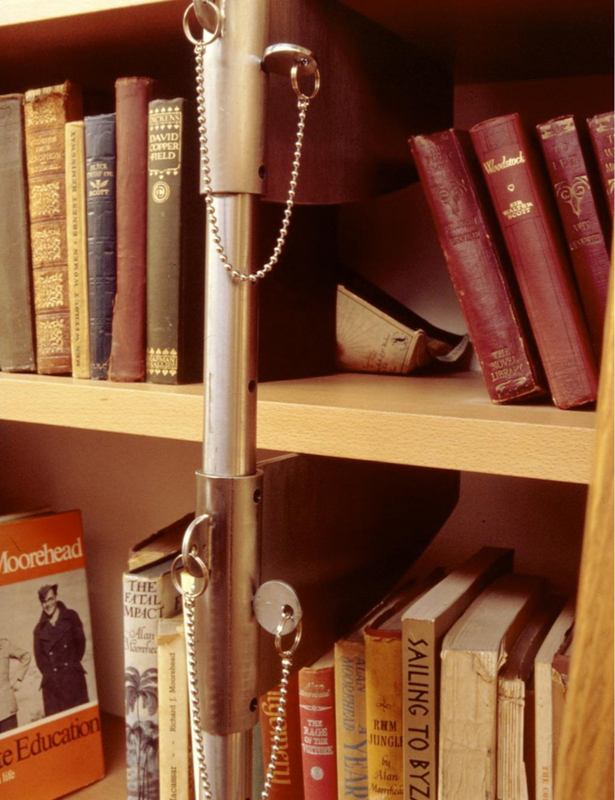 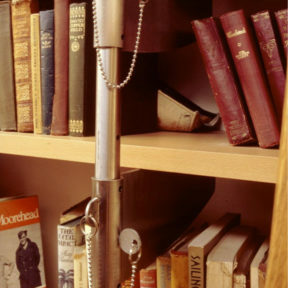 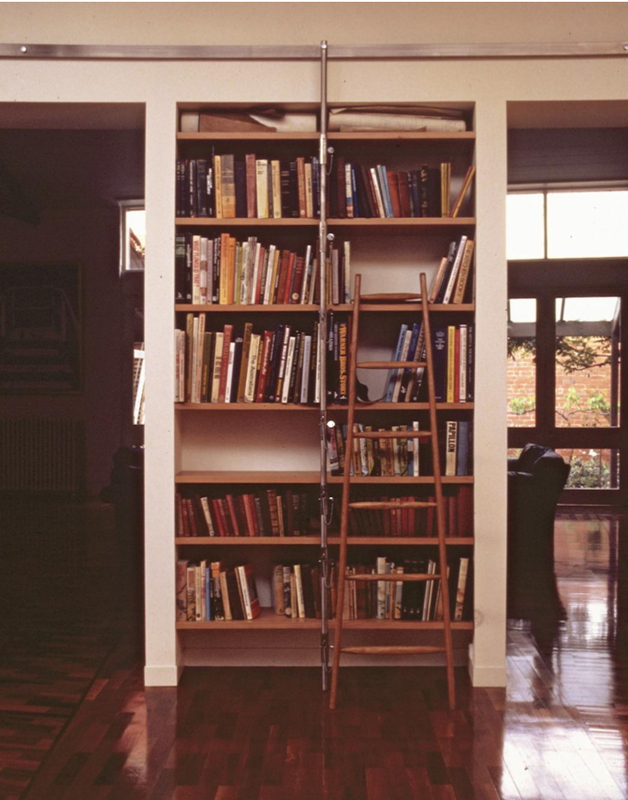 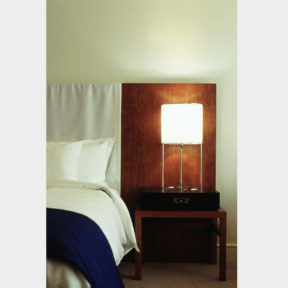 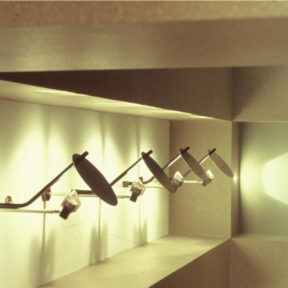 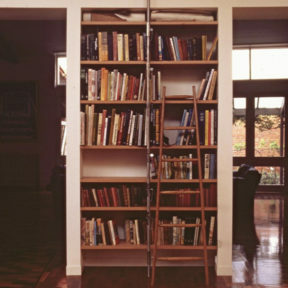 Off the shelf components are combined with quality finishing touches to achieve strict budget and contextual character. 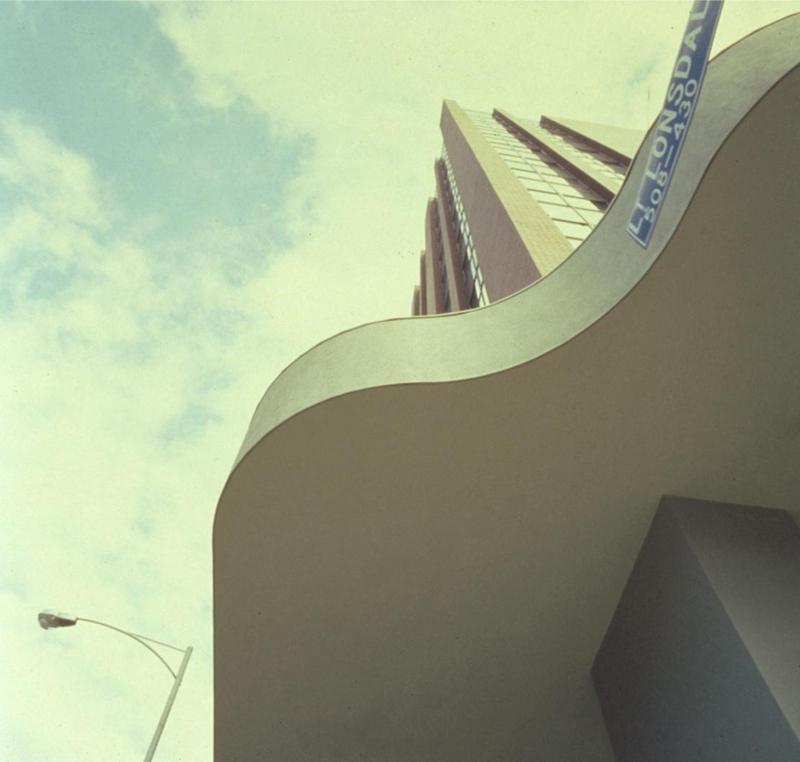 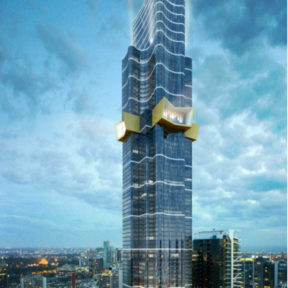 At 80 storeys, Vision was designed as Brisbane’s tallest building. 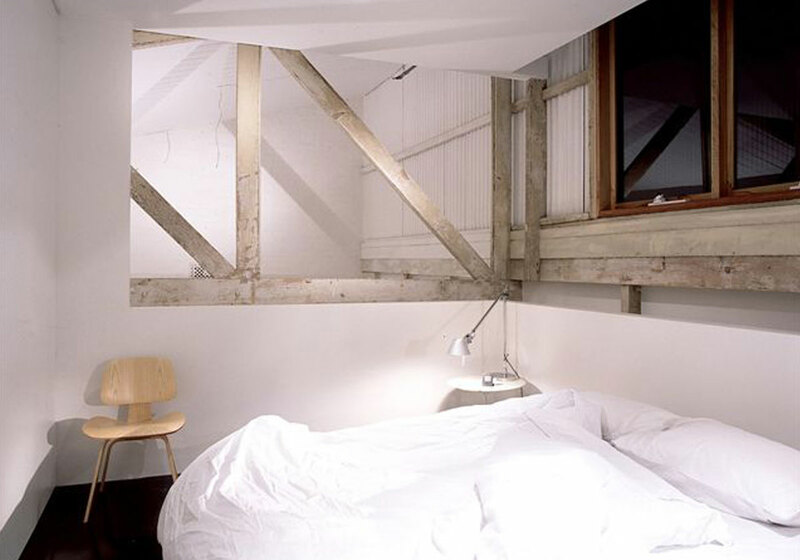 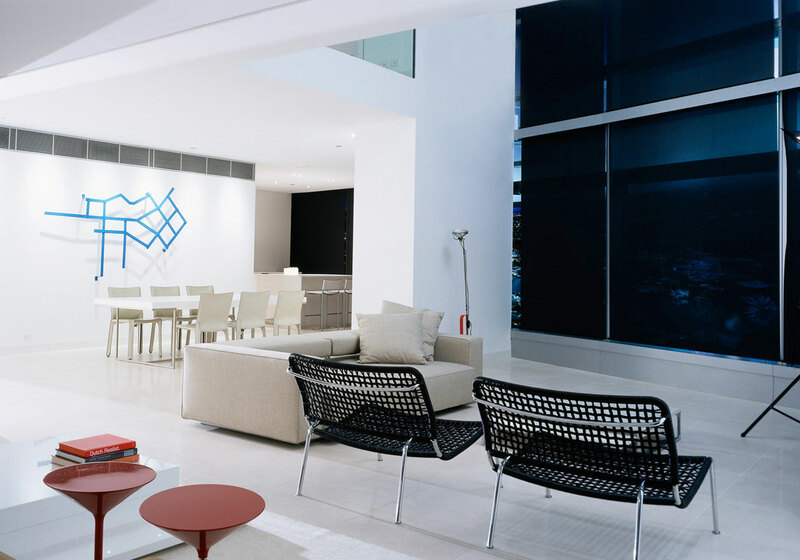 The loft apartments act as “home-like spaces in the sky” offering over seven metre high portraits of the city. 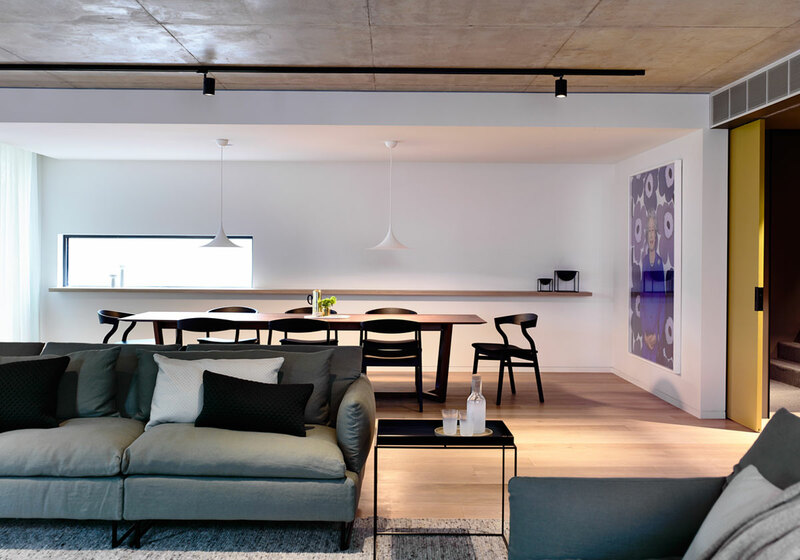 These volumes house large living areas, overlooked by the mezzanine level above that can be open to the lower floors or closed for visual and acoustic separation. 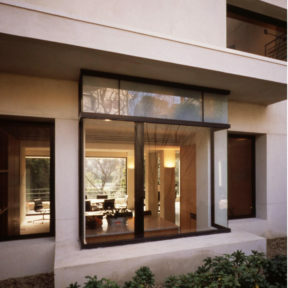 Fresh air flows through the apartments via user-controlled venting and operable windows. 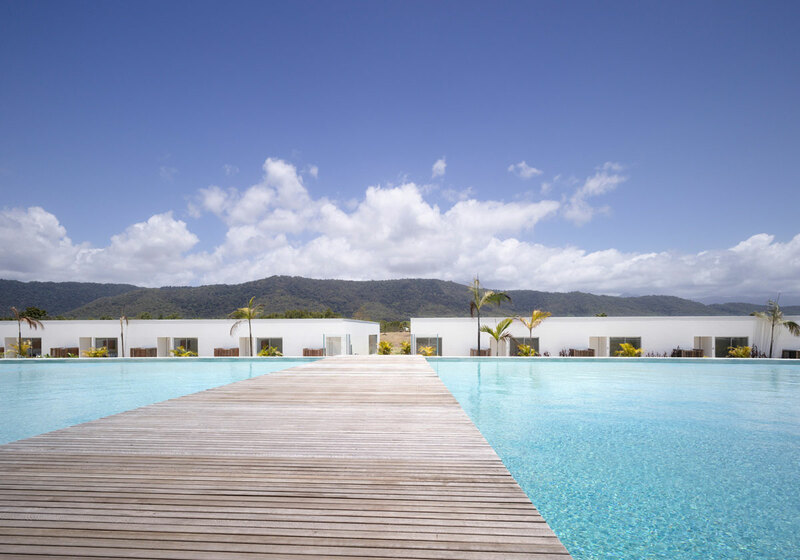 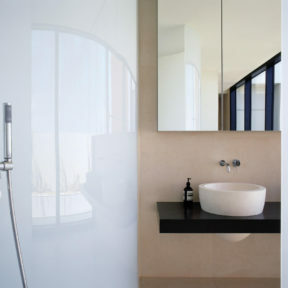 The Port Douglas Residences are designed to bring a modern aesthetic to the tropical Far North Queensland location. 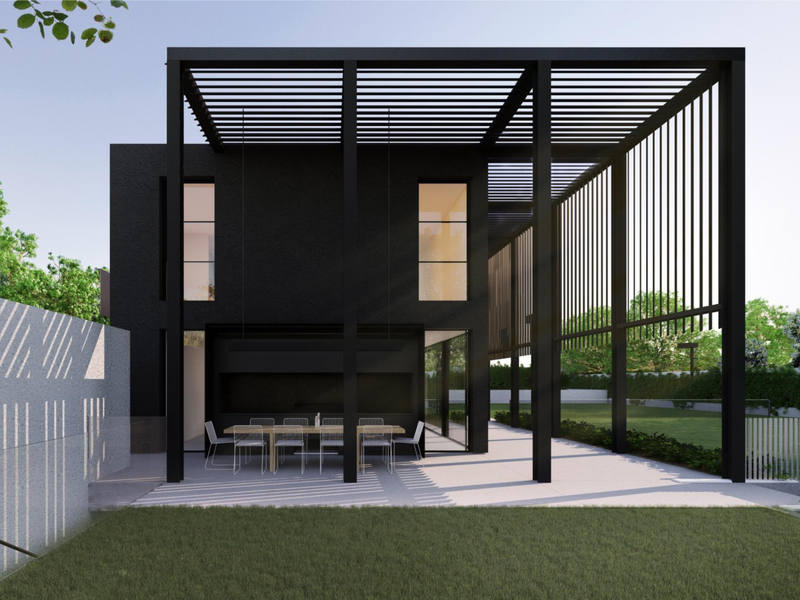 The minimal exterior is combined with a skillion roof-line that redirects tropical rainfall without the need for guttering. 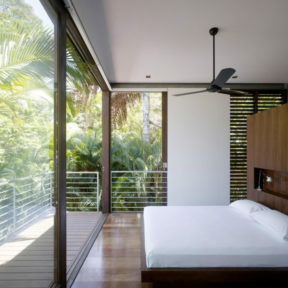 Through the careful synthesis of the architecture with the interior design, interaction with natural vegetation and wildlife is within arms reach. 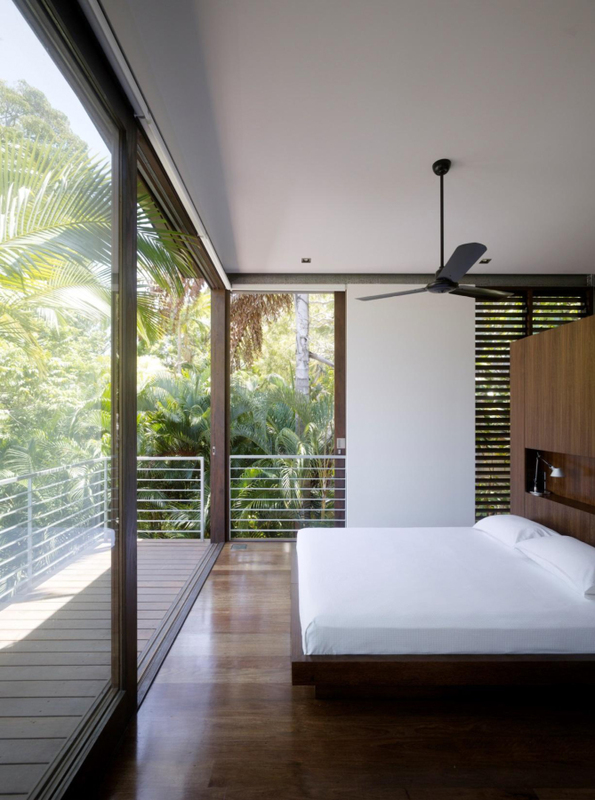 Glazing and balconies provide panoramic views of the Coral Sea and Daintree National Park. 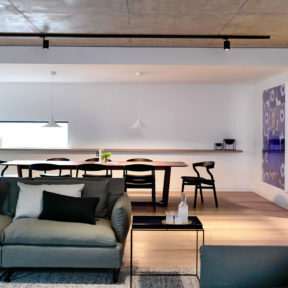 Located in Melbourne’s Southbank arts precinct, Triptych represents a residential development which has redefined the concept of vertical living. 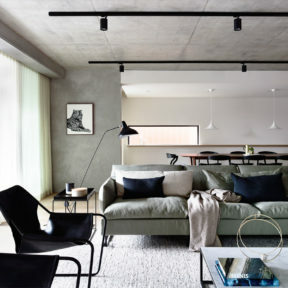 Developed as a community of linked neighbourhoods within a single building shell, the apartment interiors reflect innovative, contemporary spaces and a timeless selection of materials. 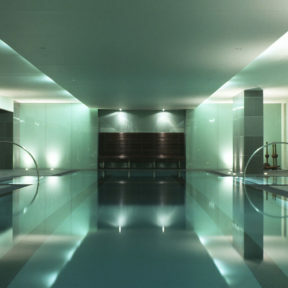 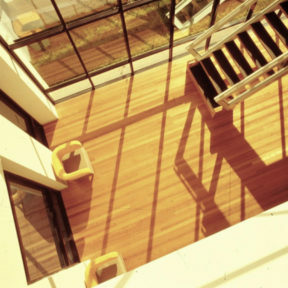 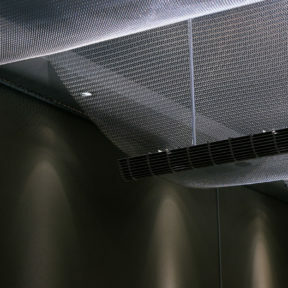 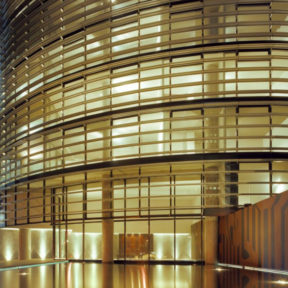 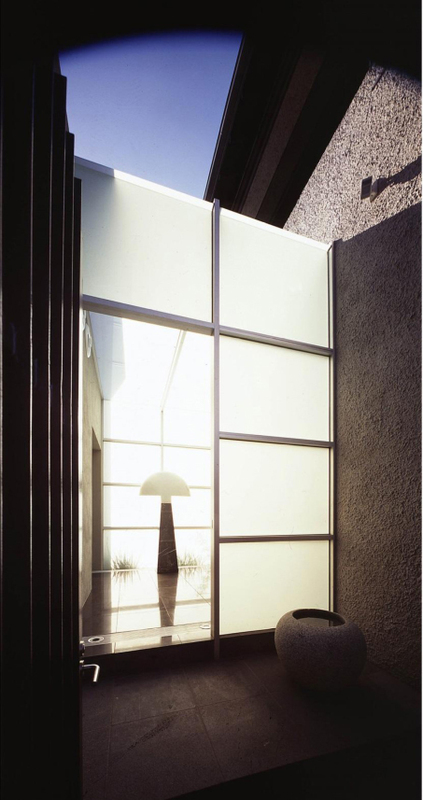 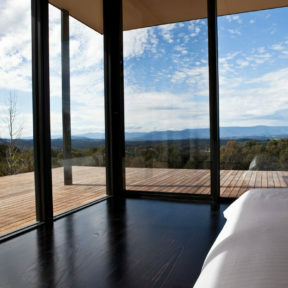 Screen walls made of “breathing” glass employ Environmentally Sustainable Principles to facilitate cross ventilation. 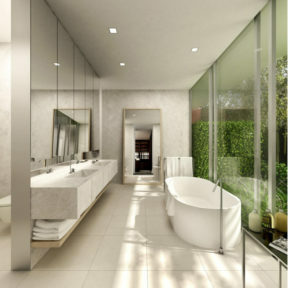 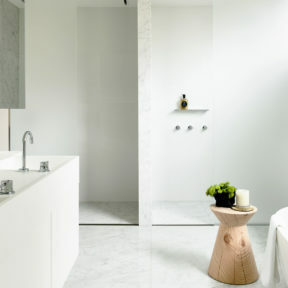 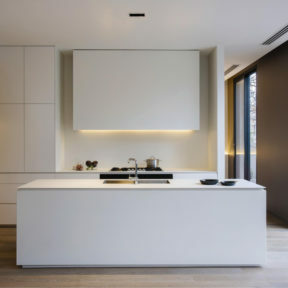 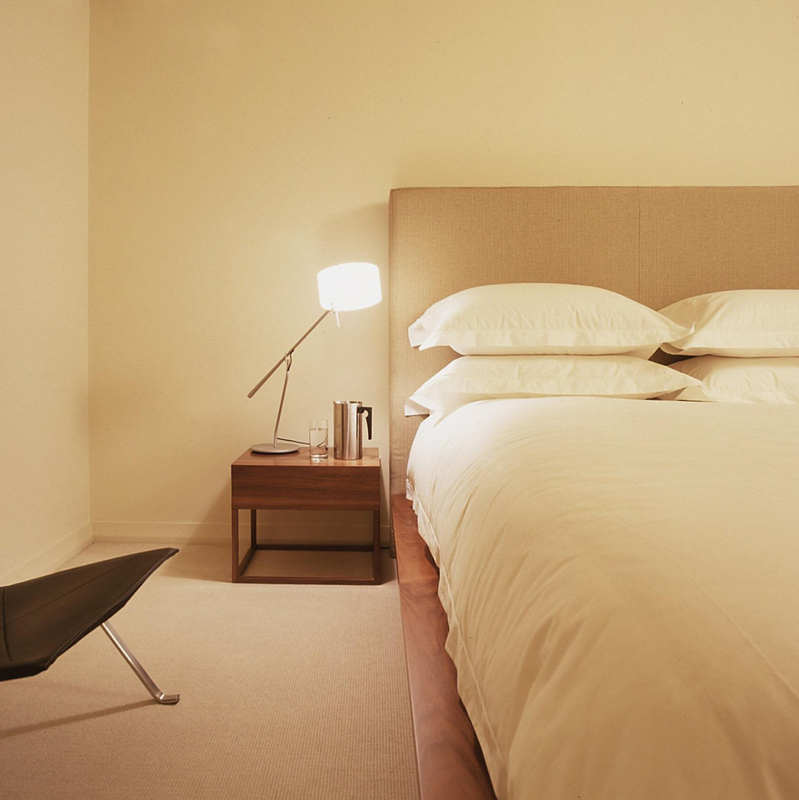 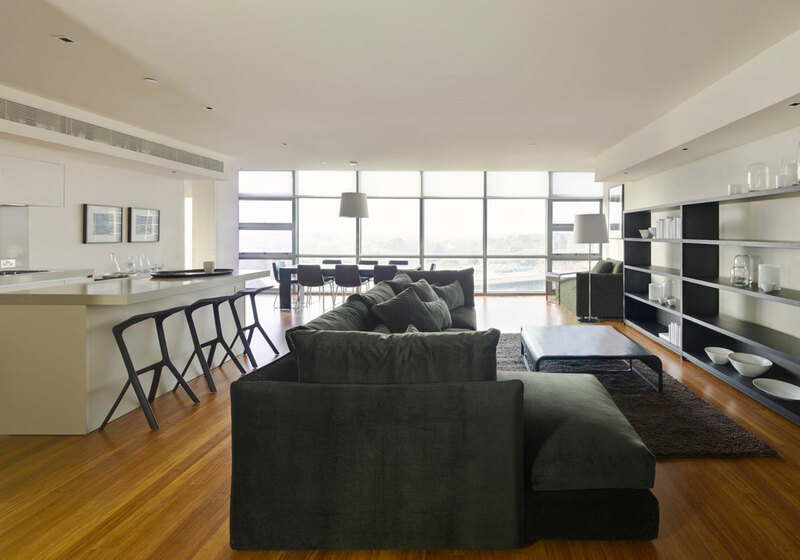 Carr delivered innovative residential interior designs for Becton at One East Melbourne. 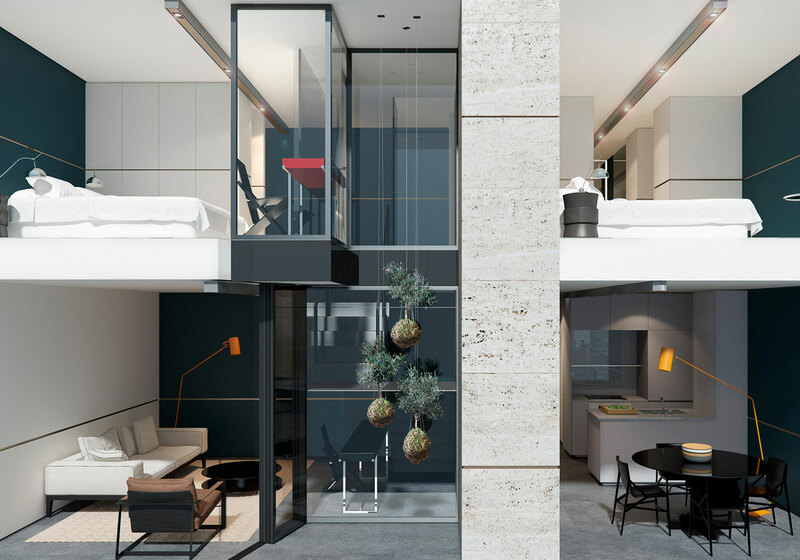 This luxurious apartment development represents half and whole-floor configurations that sit high above the landscape affording dramatic views. 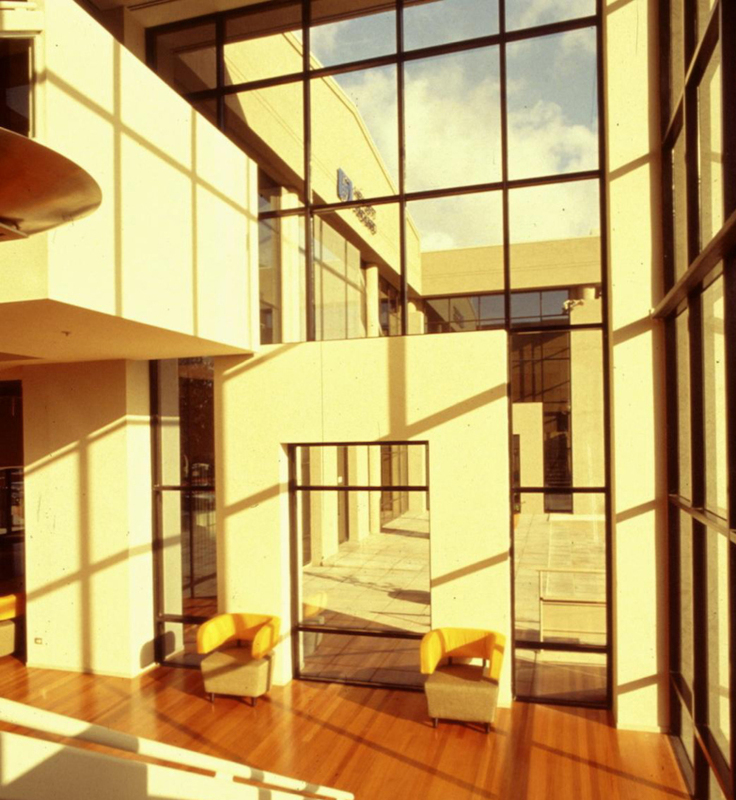 The strength of the design lies in its refined detail, with spaces drawing on generous light streaming through floor-to-ceiling windows. 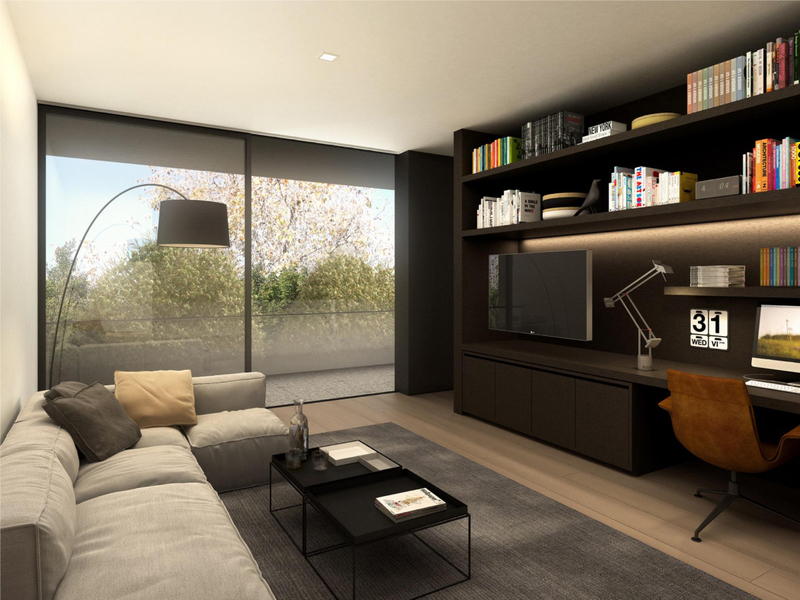 Carr’s new display suite for Parque Apartments is the introduction to the 19-storey, multi-residential development. 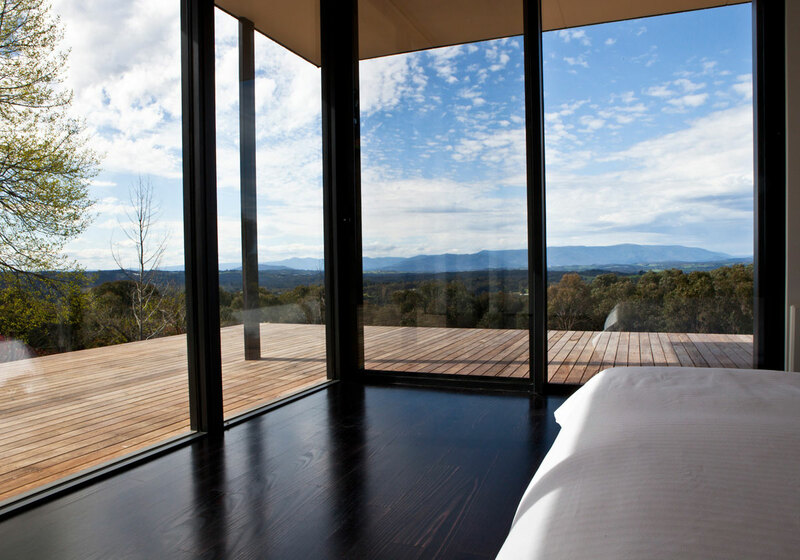 Taking cues from the curves of the building, the suite is a free-standing, transparent form that gently floats above the landscape. 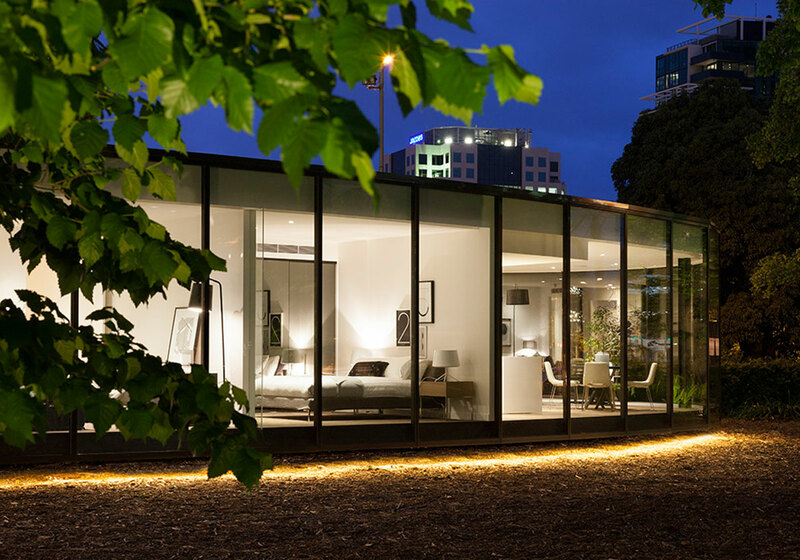 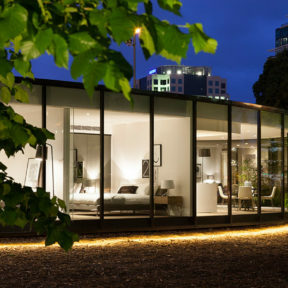 Positioned on St Kilda Road, it’s an exceptional tool for marketing, giving potential buyers an immersive, three-dimensional experience of a Parque Apartment lifestyle. 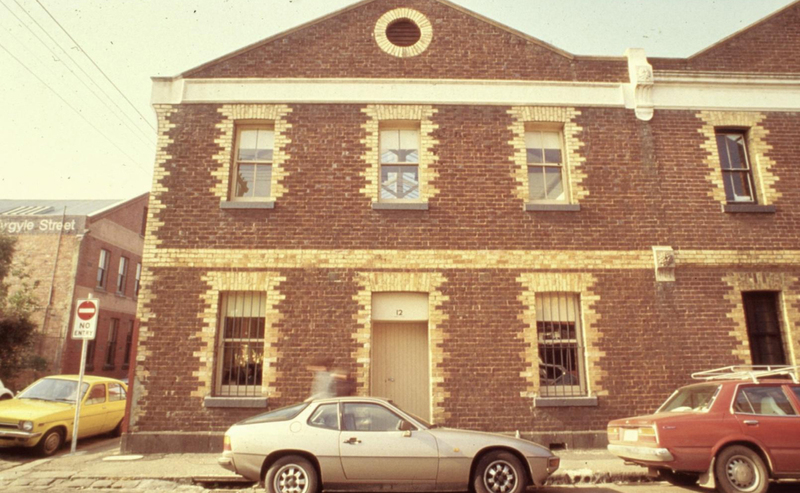 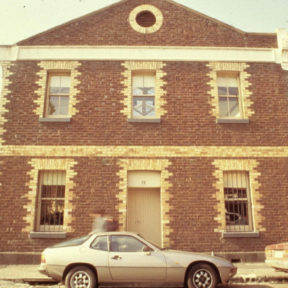 The architecture of Eight Murphy took inspiration from the adjacent scale and proportions of the Victorian terraces and apartment buildings in the street scape. 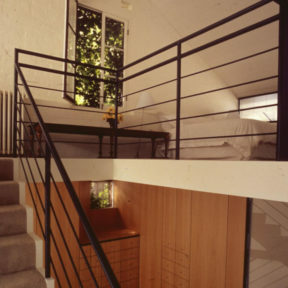 The elevation of the apartment building is broken down into three terraced bays, each form subtly varied from the other. 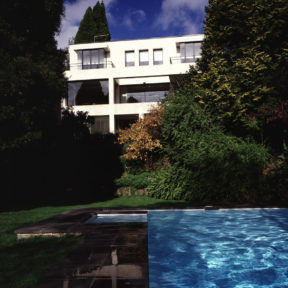 Stylistically the façade is a contemporary update to a Georgian proportioned design language; it’s a monolithic, robust form devoid of decoration. 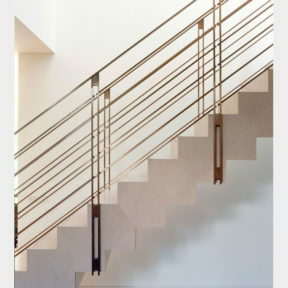 Detail is expressed in the articulation of the balustrades, handrails, spandrels and fencing. 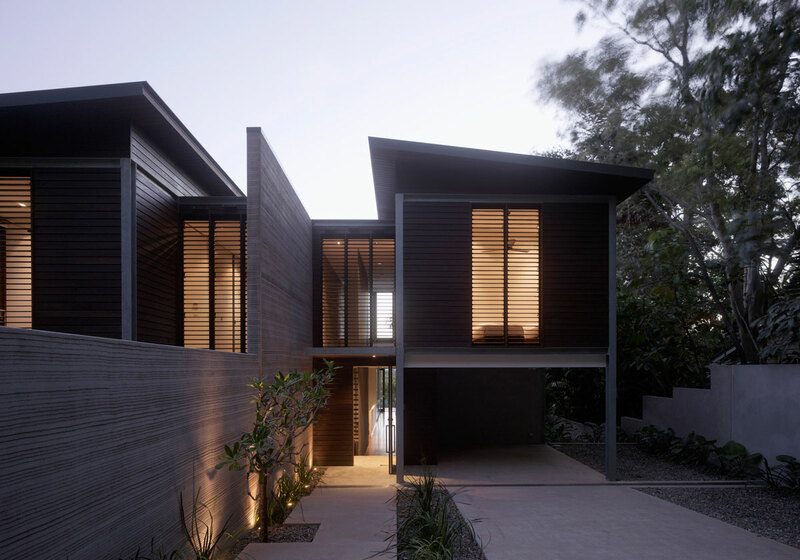 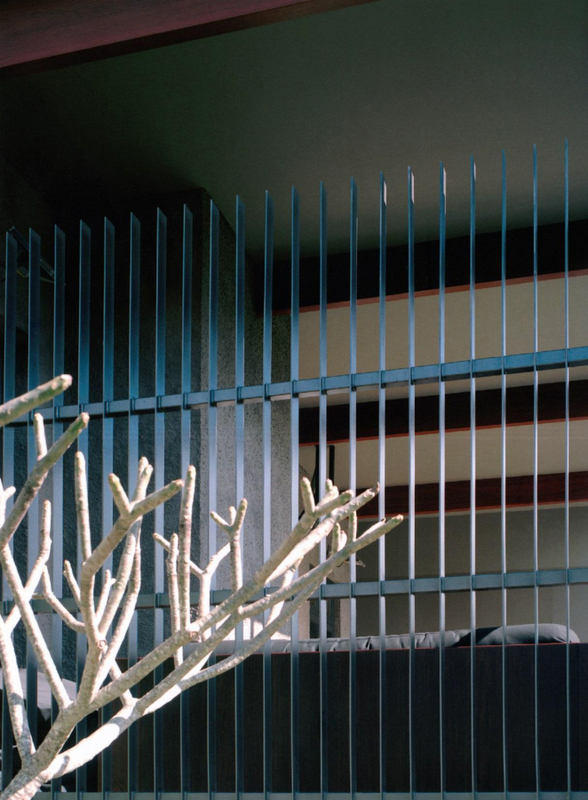 The top floor, recessed from the street to provide generous terraces, is expressed as a darker, zinc clad floor with continuous louvres to the perimeter for solar control. 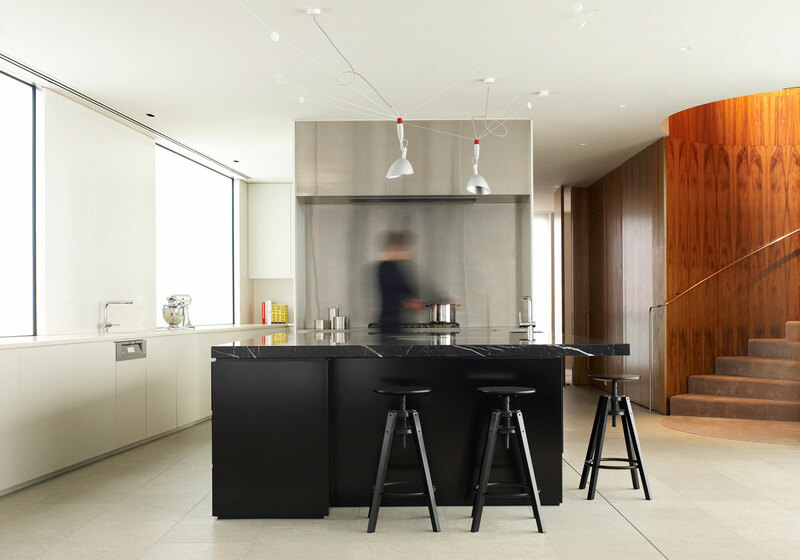 Each of the apartment interiors reflect clever spatial planning reminiscent of bespoke residential amenity and meticulous detailing, ensuring cohesion with the overriding themes of the project. 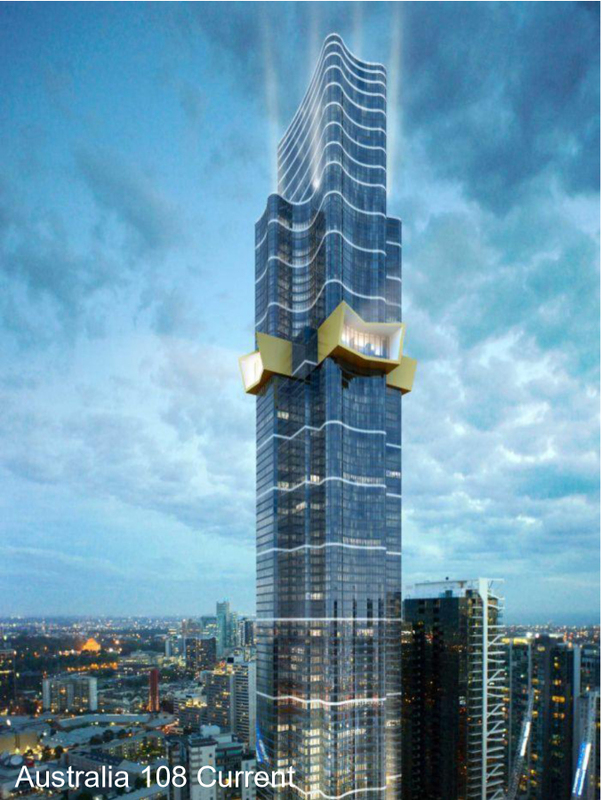 The new 71 level Tower Melbourne will be situated at the corner of Bourke and Queen Streets in Melbourne’s CBD. 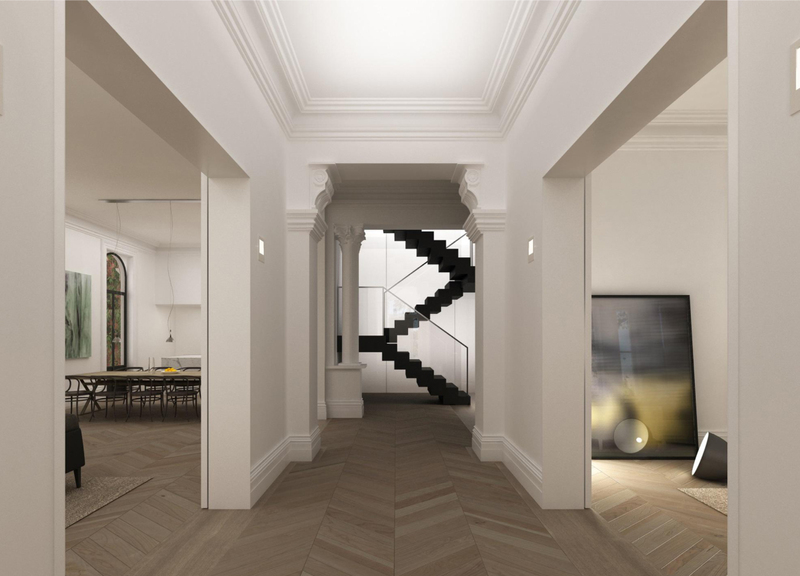 The townhomes and penthouses are designed by Carr, incorporate a series of intimate spaces referencing the Victorian terrace house. 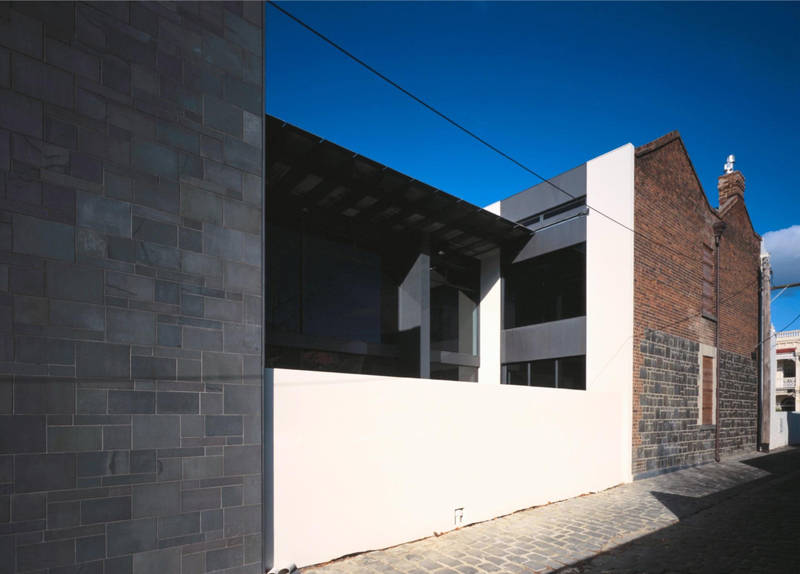 The colour palette is hinged on classic bluestone intersected by a bronze datum line that relates directly to Melbourne’s grid of tram tracks. 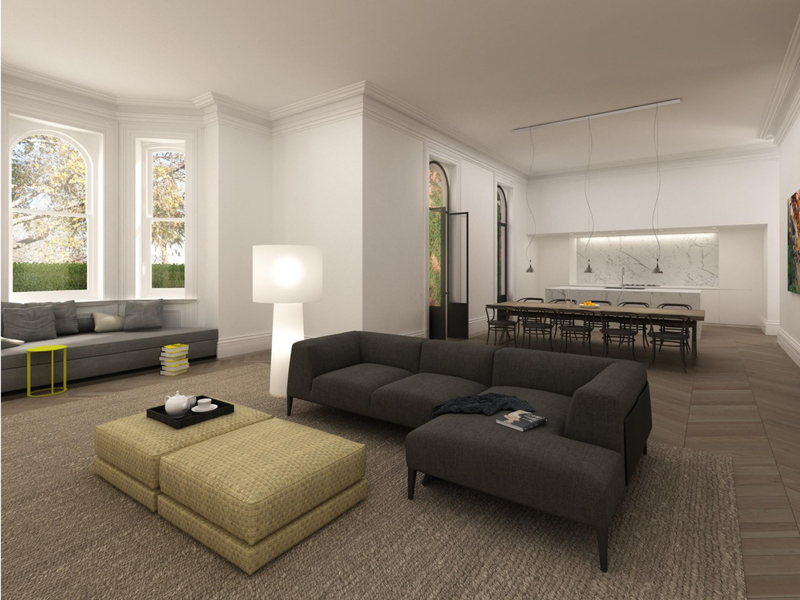 A collaboration of distinction, Carr has joined with Neometro and MAA architects to design four luxury single level apartments located in South Yarra’s coveted Royal Botanic Gardens precinct. 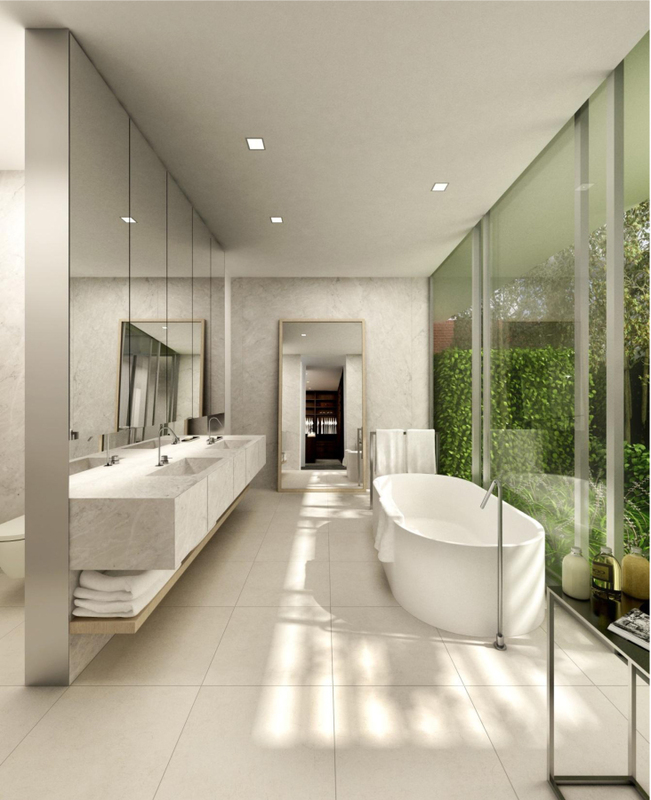 Neometro’s signature approach to quality development, combined with Carr’s refined design detail and a shared understanding of the demographic has made these bespoke residences highly desirable. 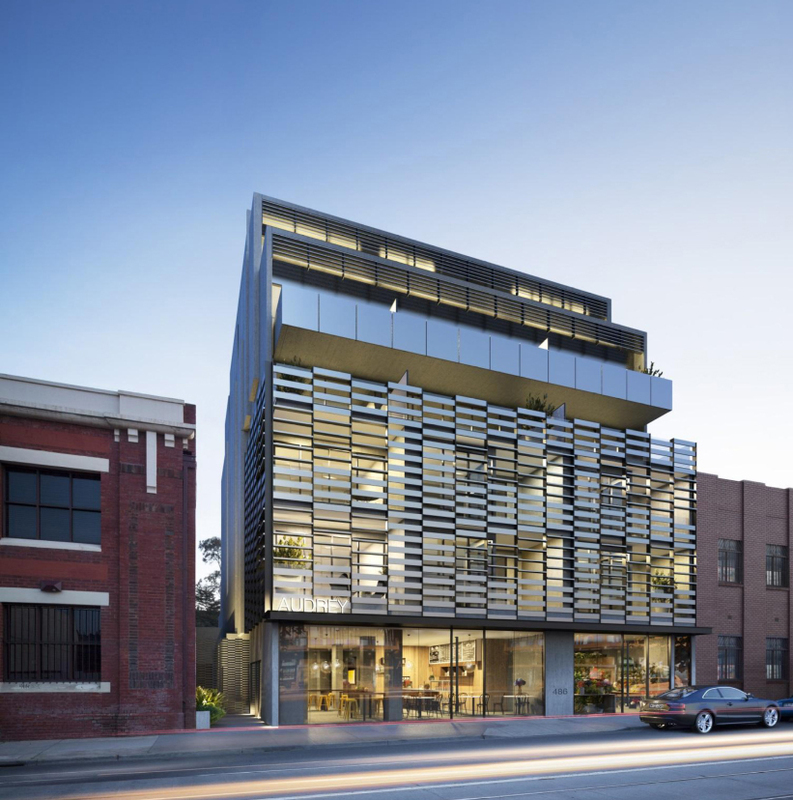 The striking facade and signage of Audrey Apartments, a multi-residential development in Richmond, draw heavily from its surrounding industrial neighbourhood. 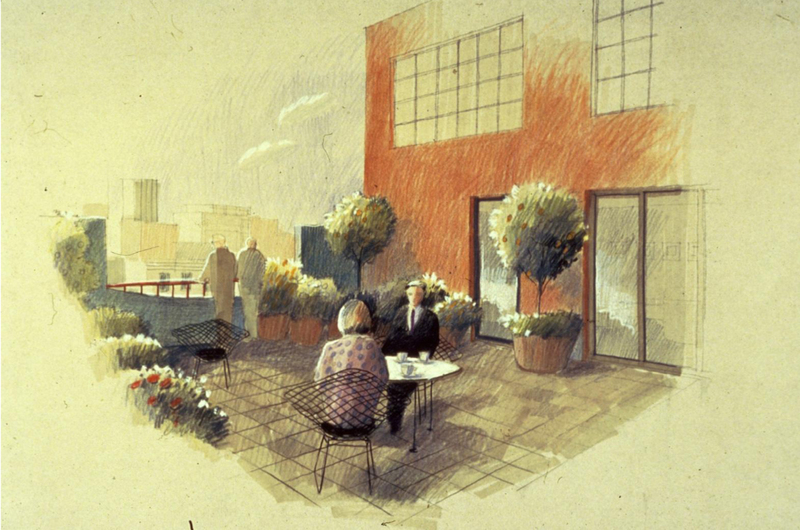 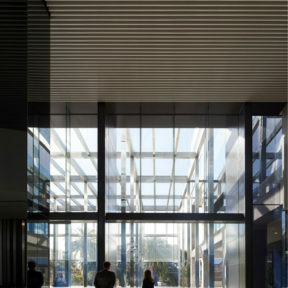 The design solution offers an interplay of light and shadows and provides a level of privacy and security from the heavy traffic of Victoria Street. 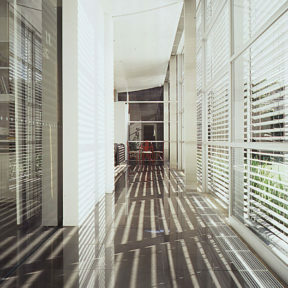 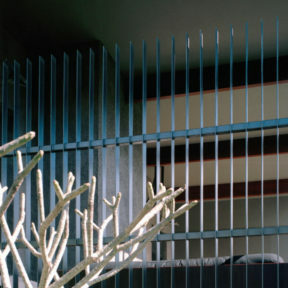 Operable louvres are incorporated to enable the user to define the level of opacity for the screen. 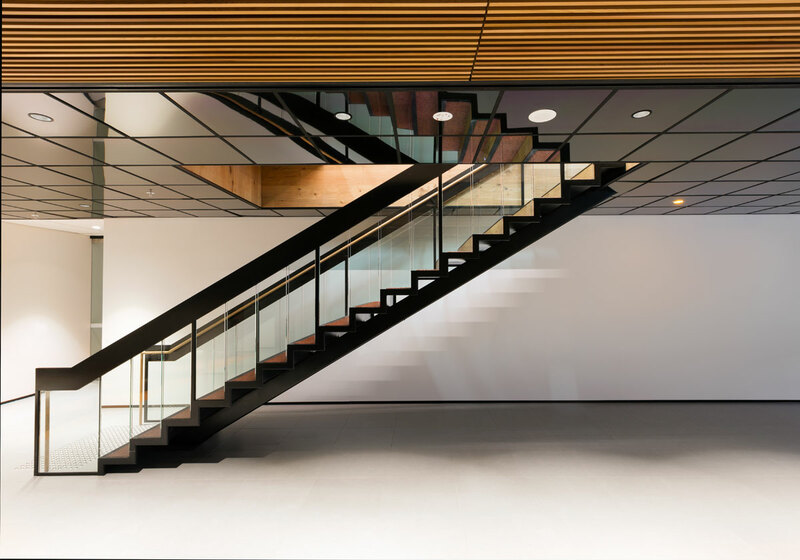 This visual language is reinforced in the interiors, with the texture of the facade ‘basket’ woven through the entry creating a unified concept for architecture and interiors. 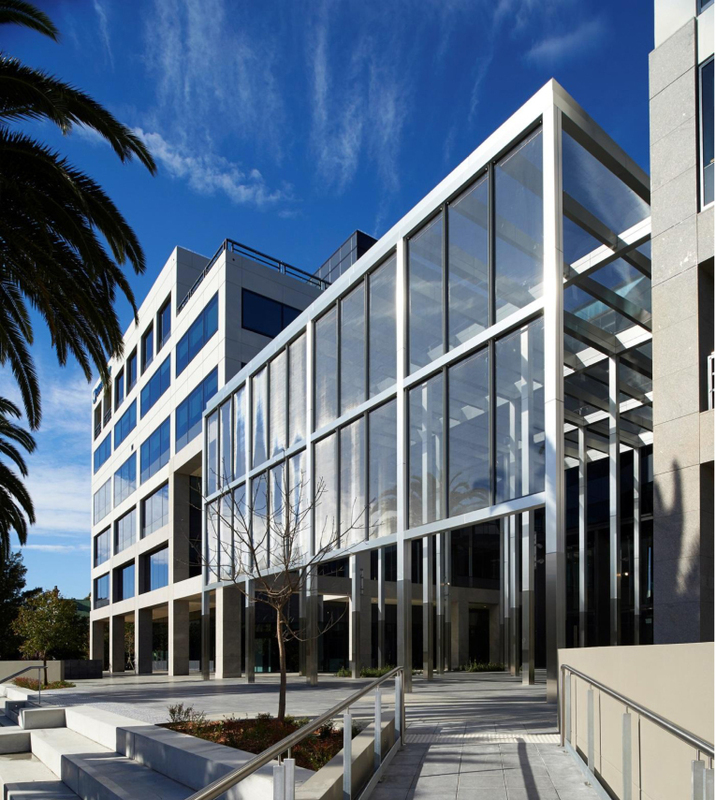 Australia Post’s Cleveland Street site presented an architectural opportunity to activate the landscape and building forecourt through the introduction of an elegant glass atrium. 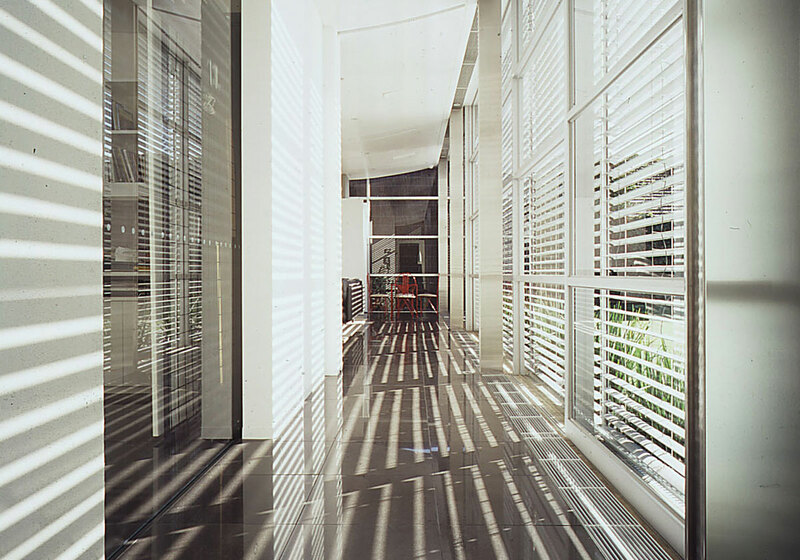 A colonnade of stainless steel columns, the atrium bays are each glazed overhead by a shimmering interlay mesh of silver fabric, further filtering the sun and glare into the building at the lower levels. 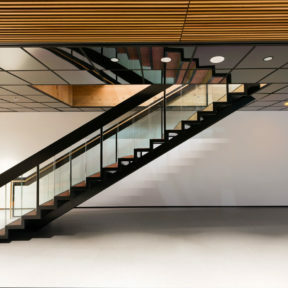 Through a series of ramps and terraces the new atrium opens up and connects to the street scape. 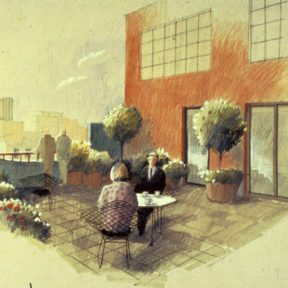 It also provides a greater opportunity for the use of the forecourt as it now houses a café and retail spaces, which spill into the entry of the building, encouraging people to interact. 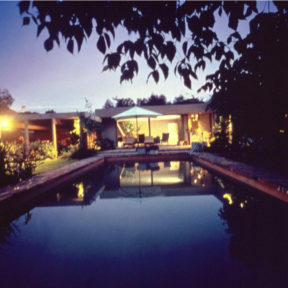 Carr was commissioned to build on an operating station in outback Australia, a resort and working homestead for the use of a construction company’s staff and key executives. 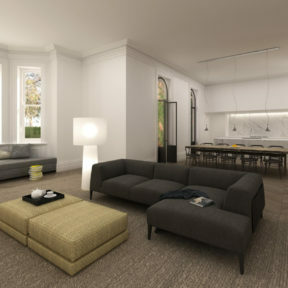 The refined “homestead” contains a catering kitchen for 50, sitting, dining and billiards rooms. 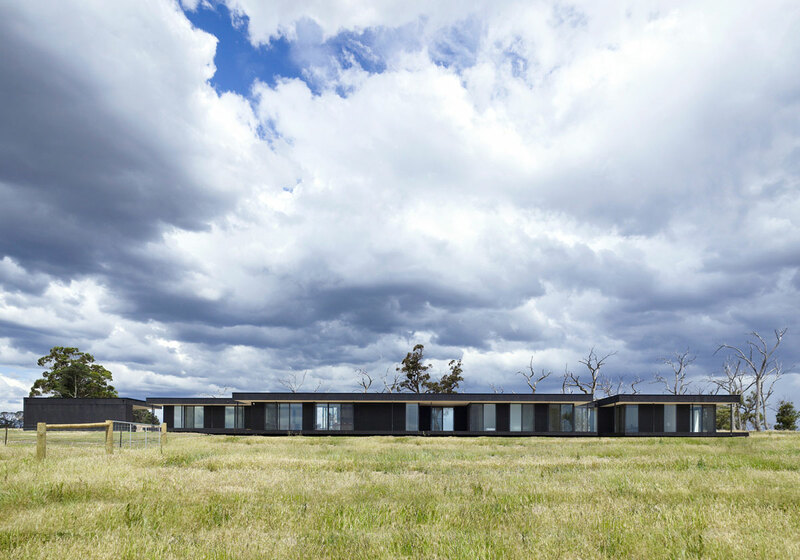 The individual accommodation buildings are grouped away from the Homestead and built of slabbed timber with galvanised roofs. 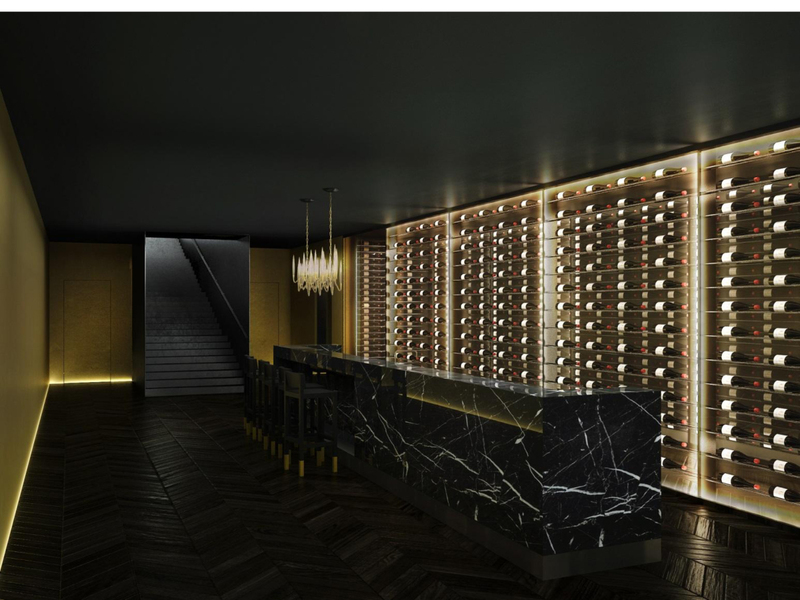 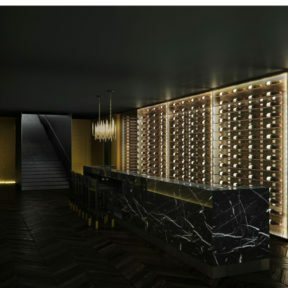 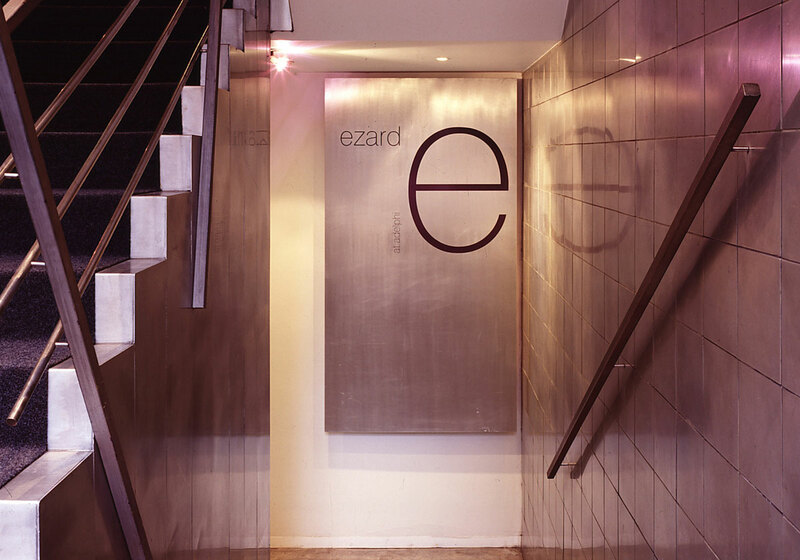 In keeping with the original concept of the Adelphi Hotel, where the restaurants and bars are to exist as destinations in their own right, Ezard was designed to establish its own identity whilst complimenting the Adelphi’s international reputation. 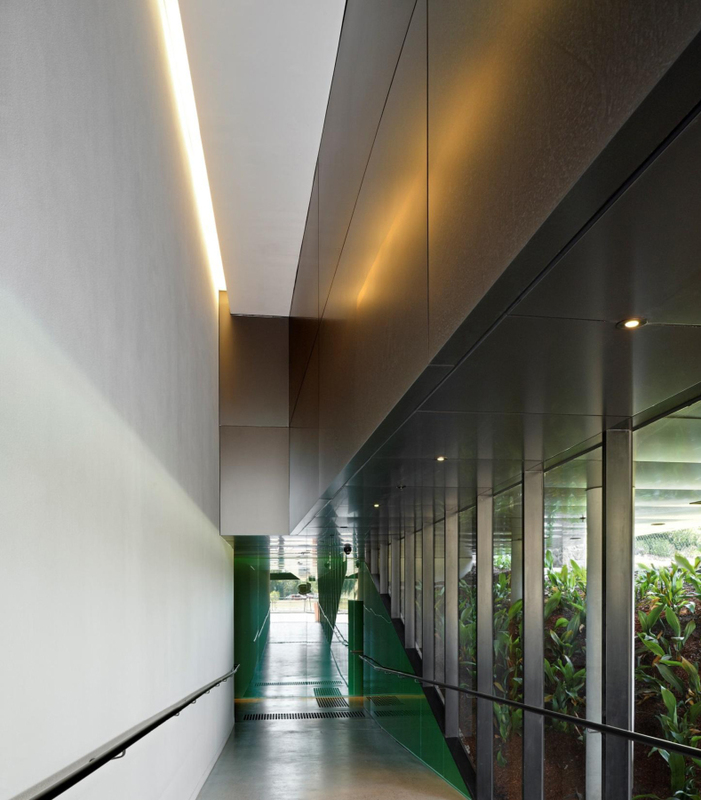 The materials and finishes scheme was designed to create a rich and welcoming subterranean environment whilst maintaining the integrity of the 1930’s building. 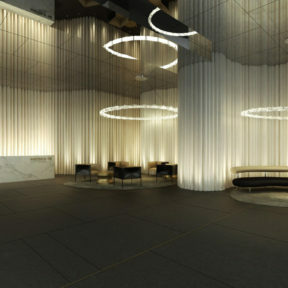 Located in the heart of the Melbourne CBD, Carr was briefed to translate the global brand into a local experience with a distinctive feel and aesthetic, whilst meeting the high standards of a five star hotel chain. 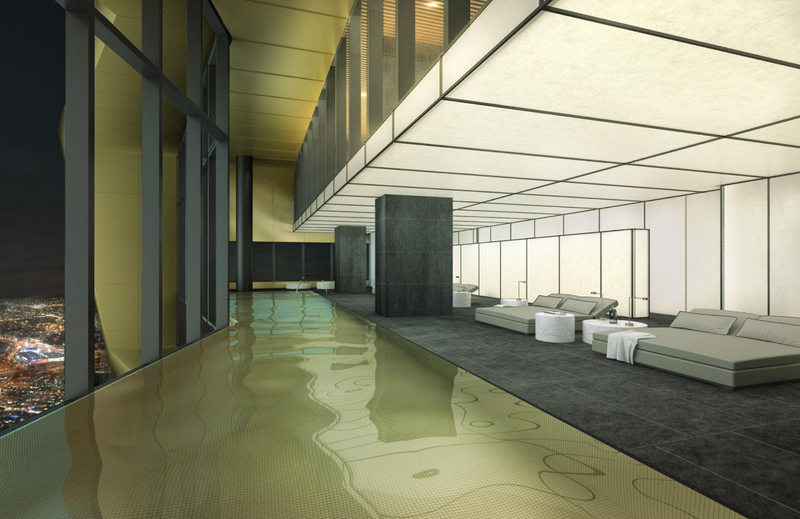 The interior design includes all public spaces, a signature restaurant, pool and spa, function spaces, 262 guest rooms and corridors. 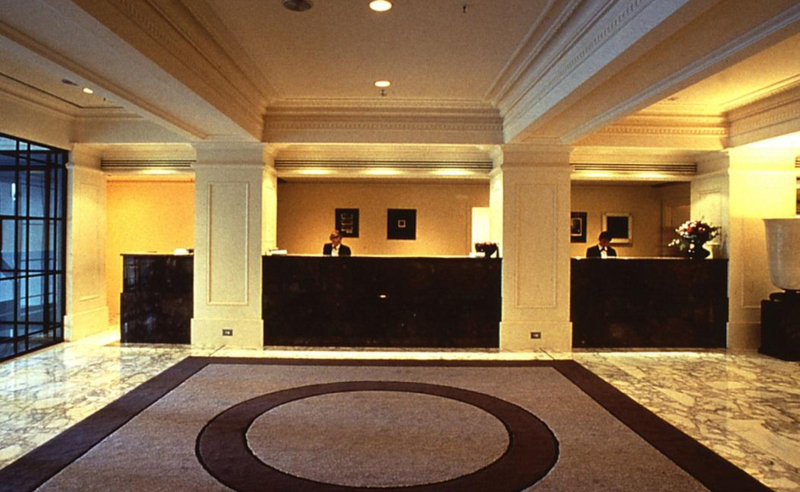 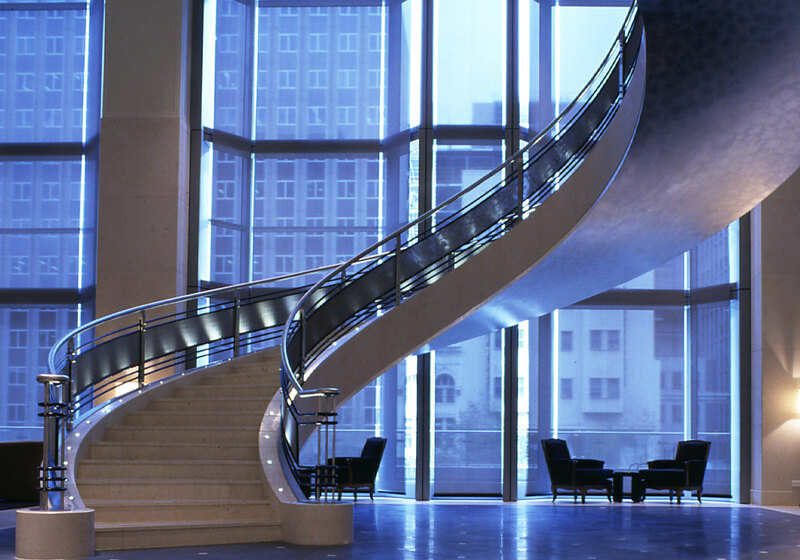 The Westin has continued to consult Carr on new projects to ensure the hotel’s distinct position for years to come. 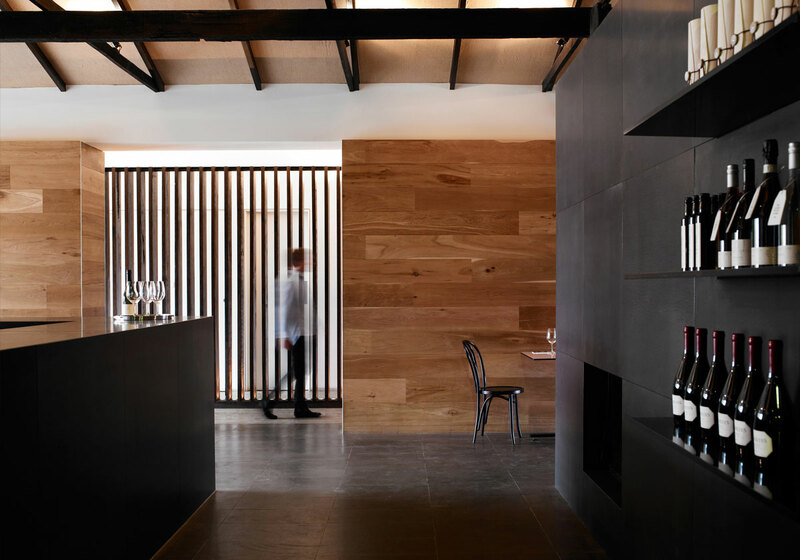 The delivery of “a special food experience” was our goal when we commenced work on the Food and Beverage outlets at Melbourne Museum for Peter Rowland. 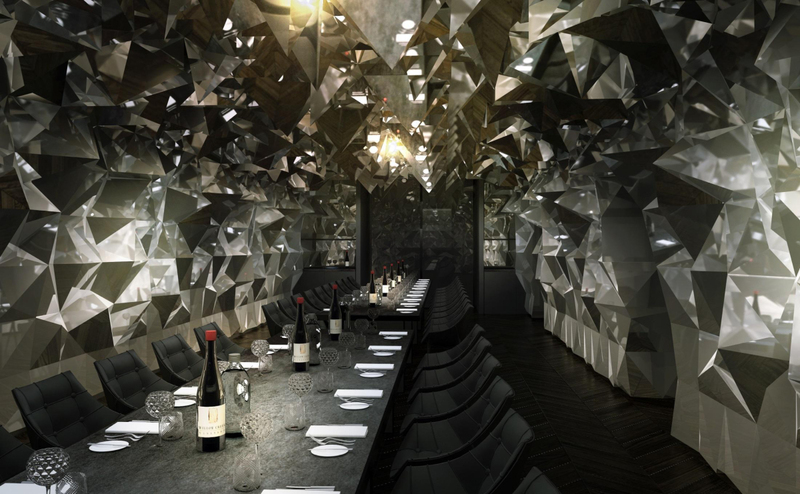 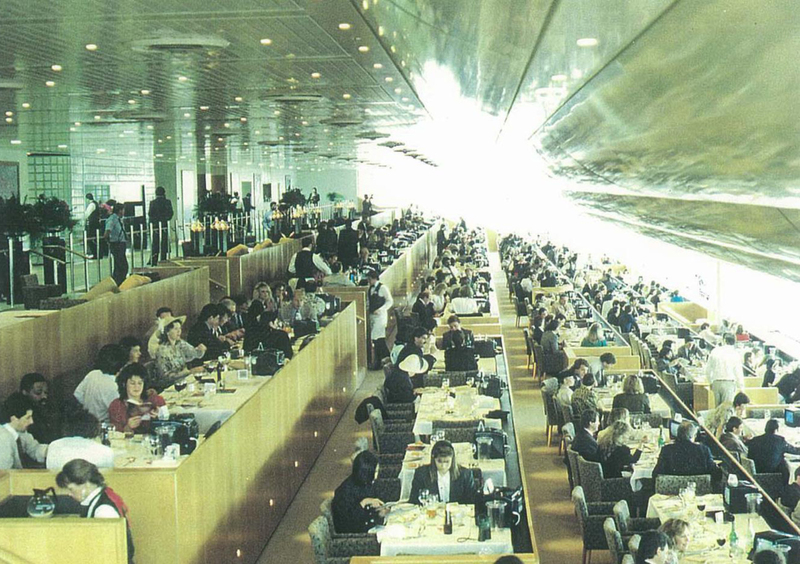 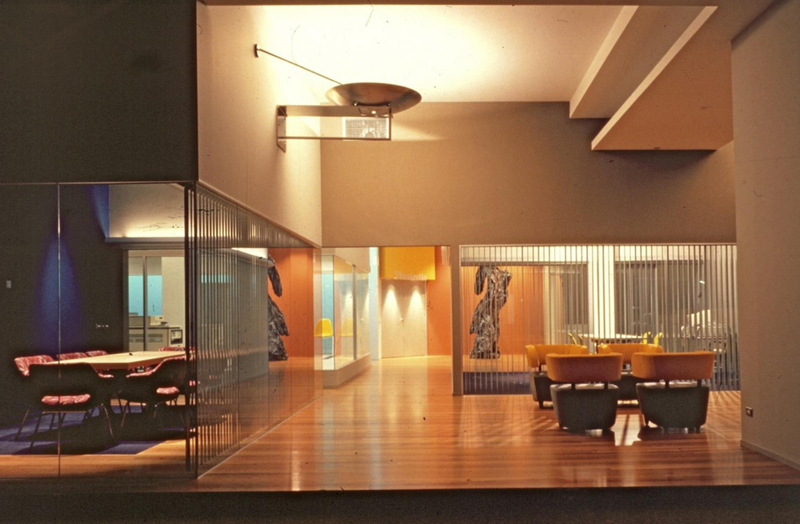 The design created three distinct dining options. 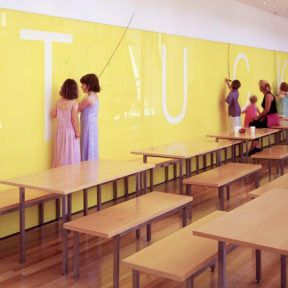 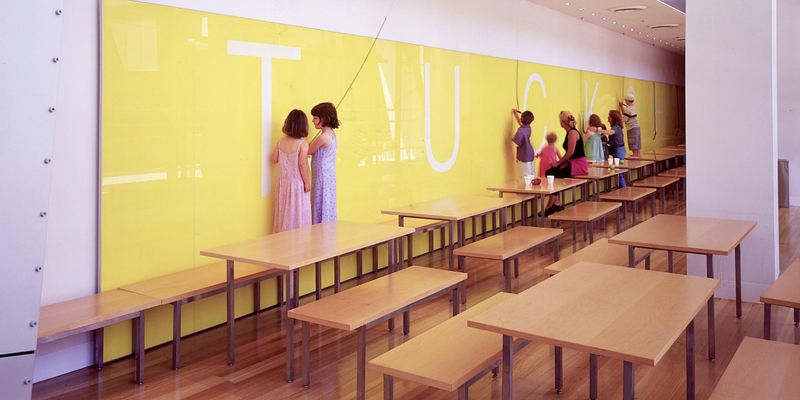 Tuckshop provides communal style seating and features a bright yellow glass scribble wall. 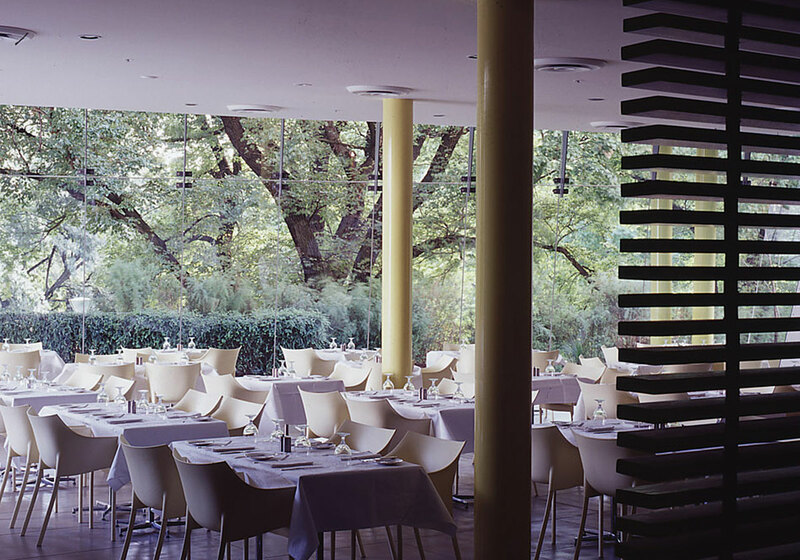 Brassiere adopts natural elements with the use of stone and timber and Tree Tops provides sophisticated dining in a glassed forest surround. 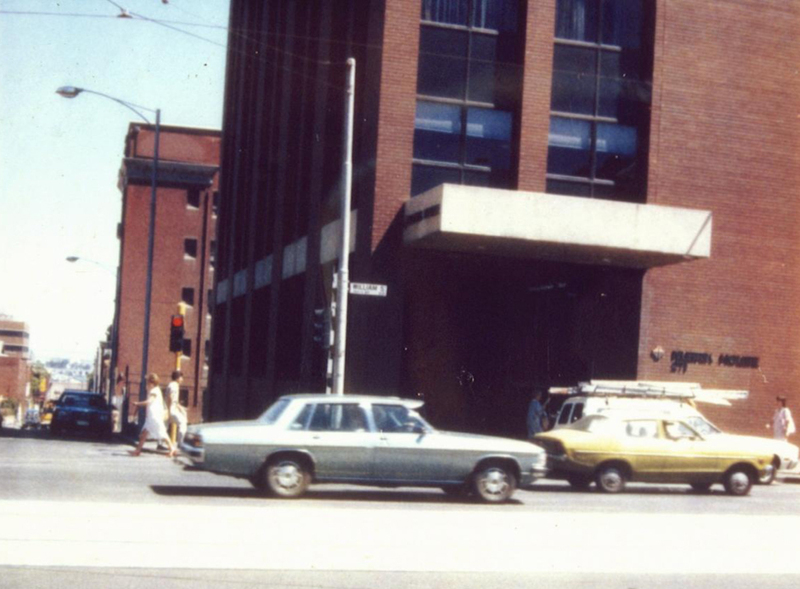 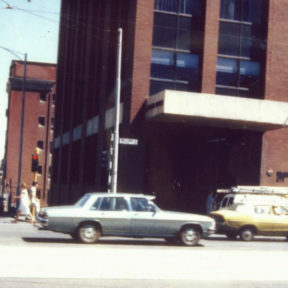 The Hilton Adelaide was built in the early 1980’s. 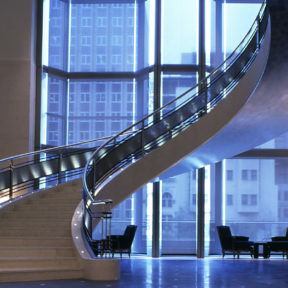 Known in the past for its excellence in architecture, Hilton was keen to retain that reputation. 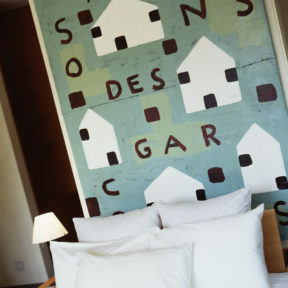 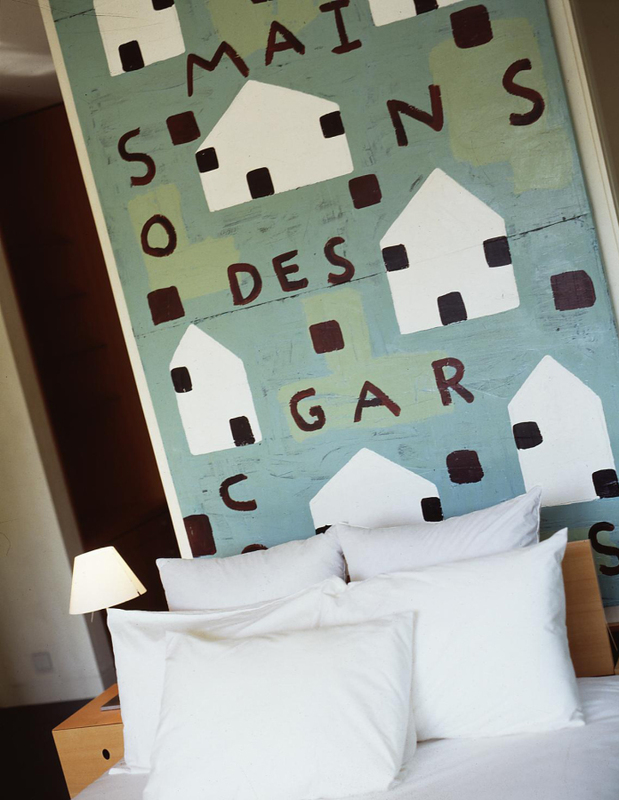 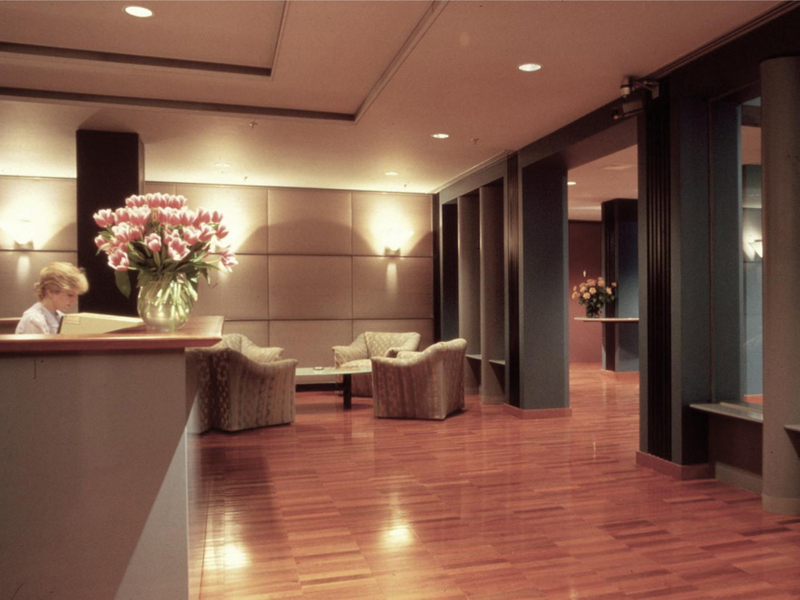 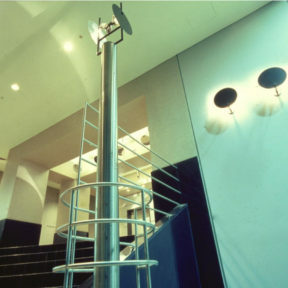 The project involved the redesign of the ground and first floor public areas in stages to allow the hotel to continue operations. 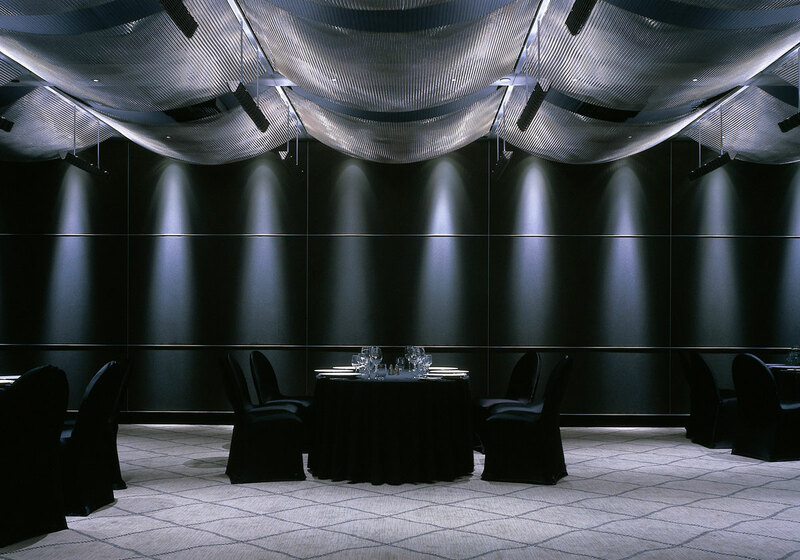 The first stage of the project was a successful combination of groundbreaking aesthetics with the functional requirements of a multi-use ballroom area. 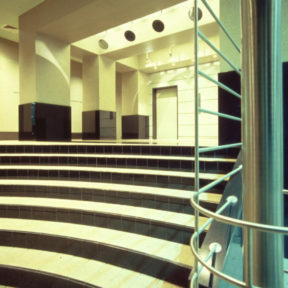 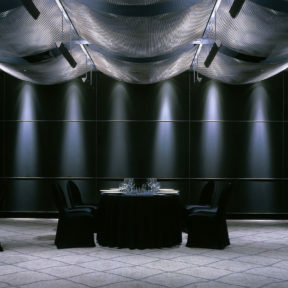 As stage two of the public space renovation at Hilton Adelaide, the design of the Conference Centre is an extension of the Ballroom designed by Carr in 2003. 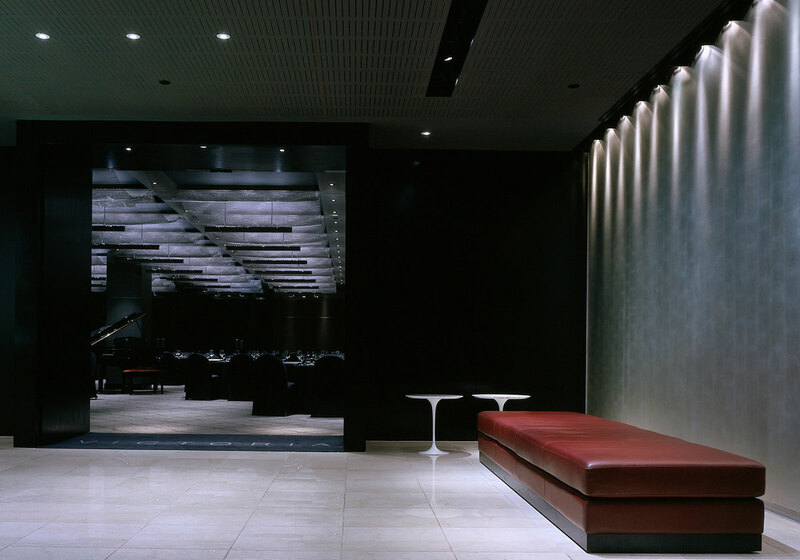 The use of modern materials and lighting technology allowed the design to have an impact whilst retaining all existing structure and services. 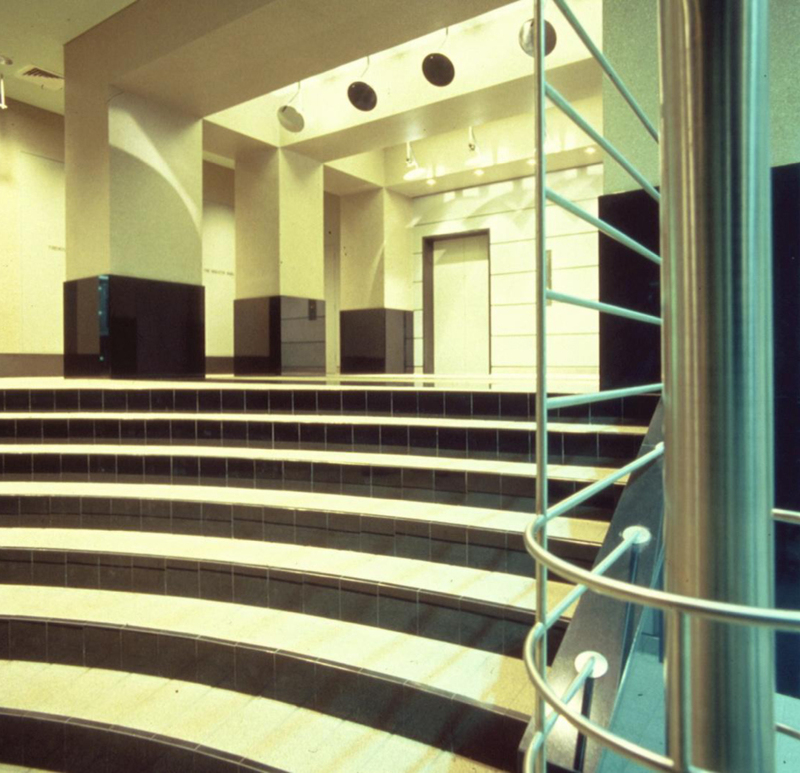 The planning and aesthetics enable the areas to attract a wide range of events. 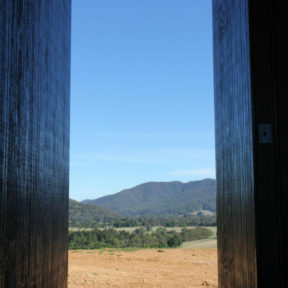 A golf course and hinterland provide the backdrop for the four acre Port Douglas site. 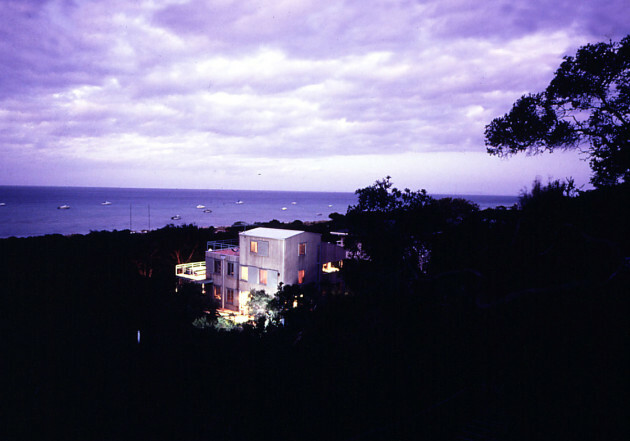 Carr’s master plan resulted in 72 two and three bedroom contemporary suites surrounded by a pool stretching 170 meters in length. 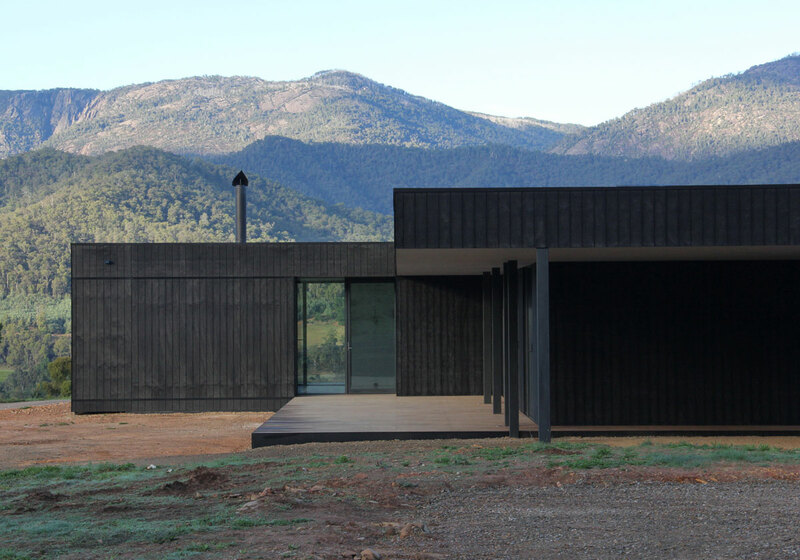 A strip of ‘ground scaper’ apartments nestle into the landscape along the west so that all suites are afforded a mountain aspect with outdoor living areas to maximise the views. 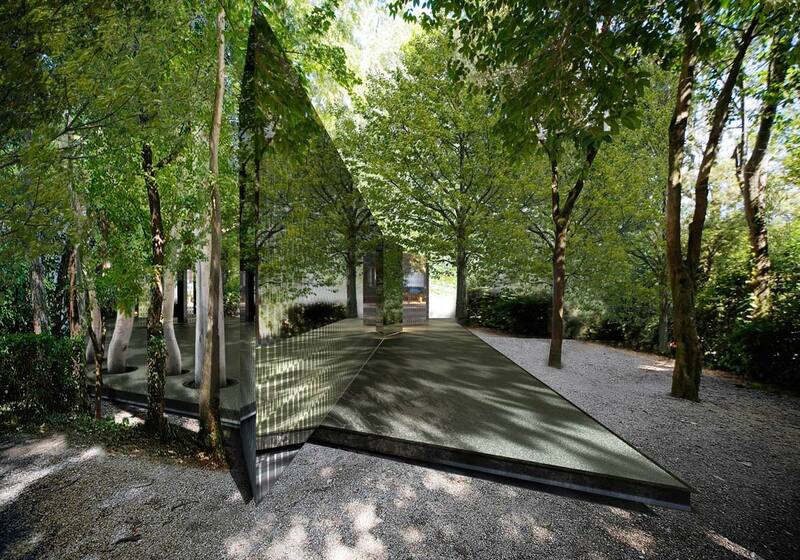 Obscured amongst native Australian trees, a reflective surface reveals dappled shadows on the landscape. 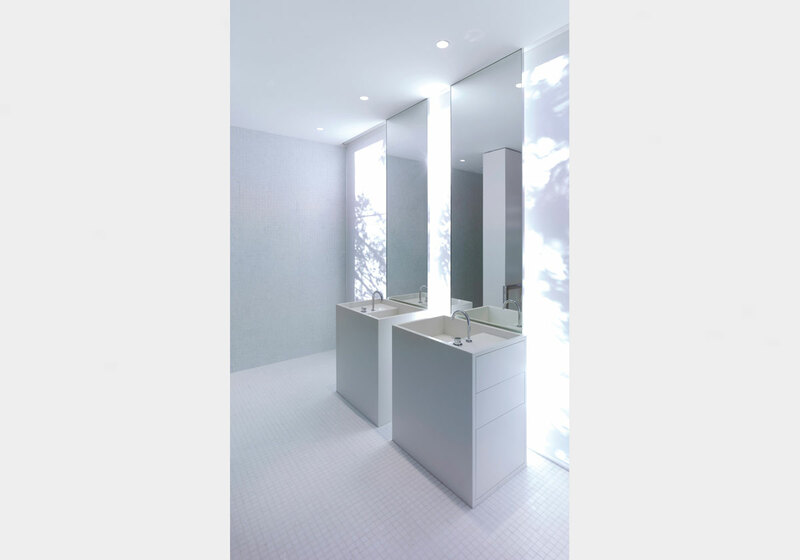 Upon first impression, light, trees, surroundings and viewers are reflected on a hidden wall to create a sense of wonder and exploration. 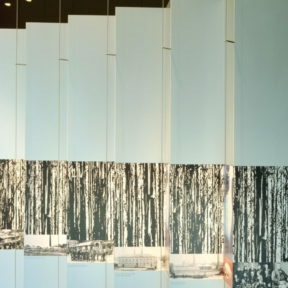 The subtle shifting of the elements fracture the initial perception to expose an intimate artist show experience for the Venice Biennale at the Australian Pavilion. 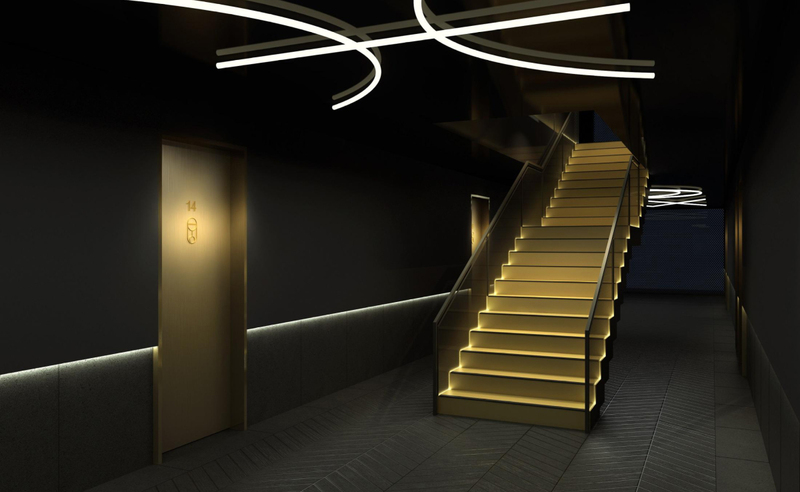 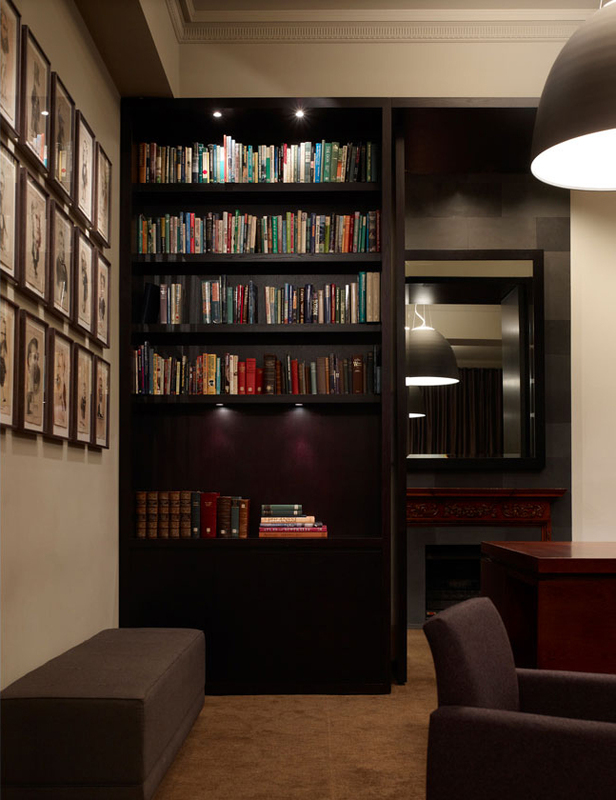 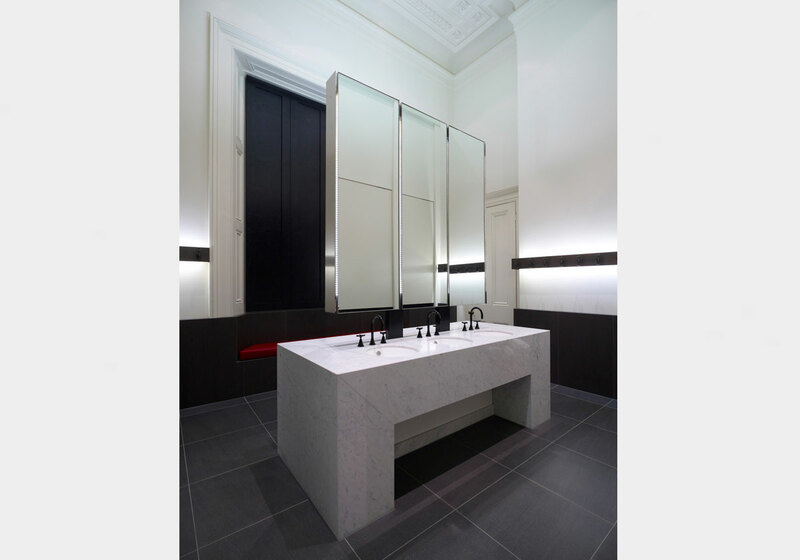 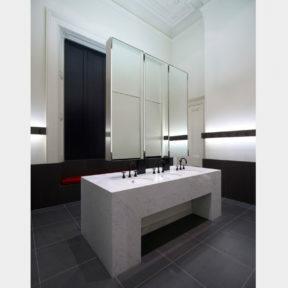 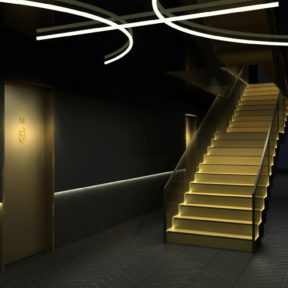 Situated in one of Melbourne’s oldest heritage buildings, Carr’s brief was to rejuvenate the basement and washrooms of an exclusive members club. 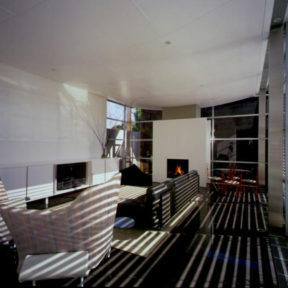 The aim was to create a comfortable, informal retreat. 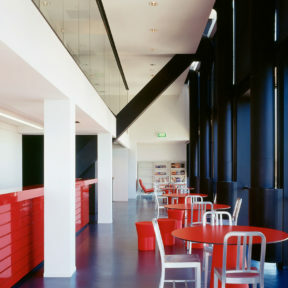 The new, modern layer required seamless integration within the fabric of the existing building. 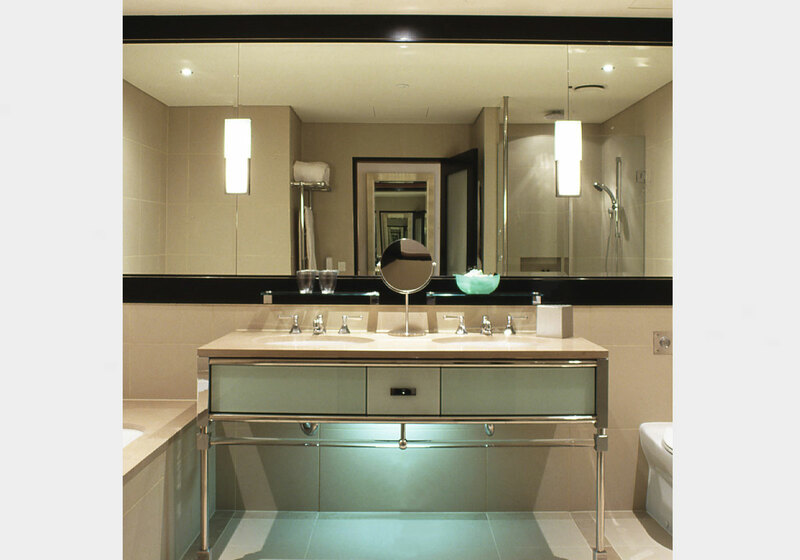 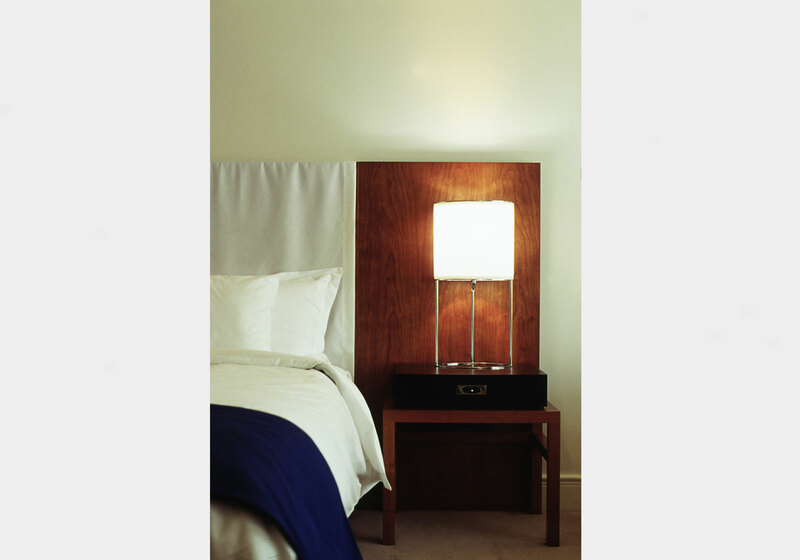 The warm, subtle colour palette offers a contemporary interpretation of the classic library and washroom amenity. 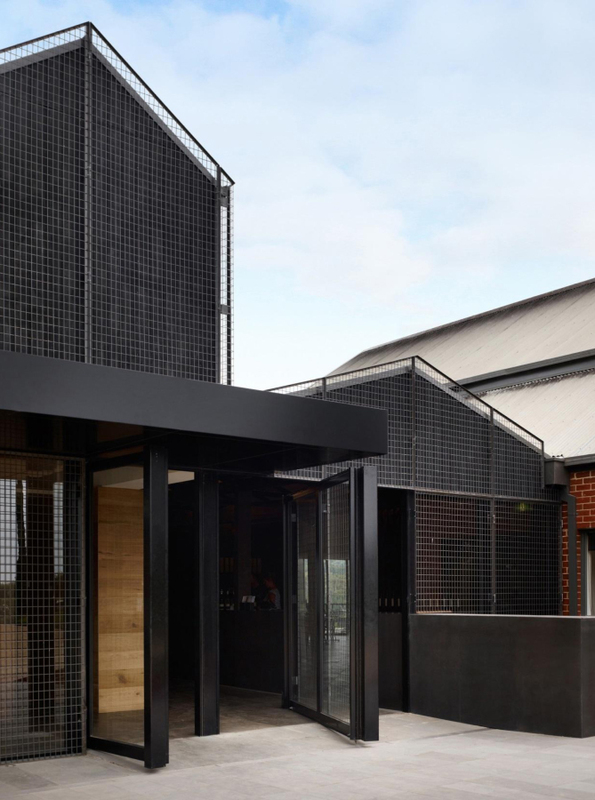 The bold extension of the Royal South Yarra Lawn Tennis Club (RSYLTC) is one that responds to its surrounding context and rich architectural roots. 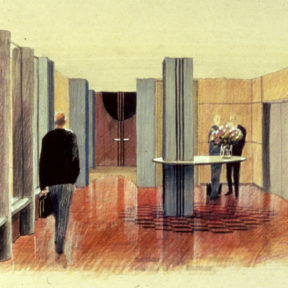 Incorporating its history and traditions, which date back to 1884, RSYLTC requested a design that would address the changing needs of their members while appealing to future generations. 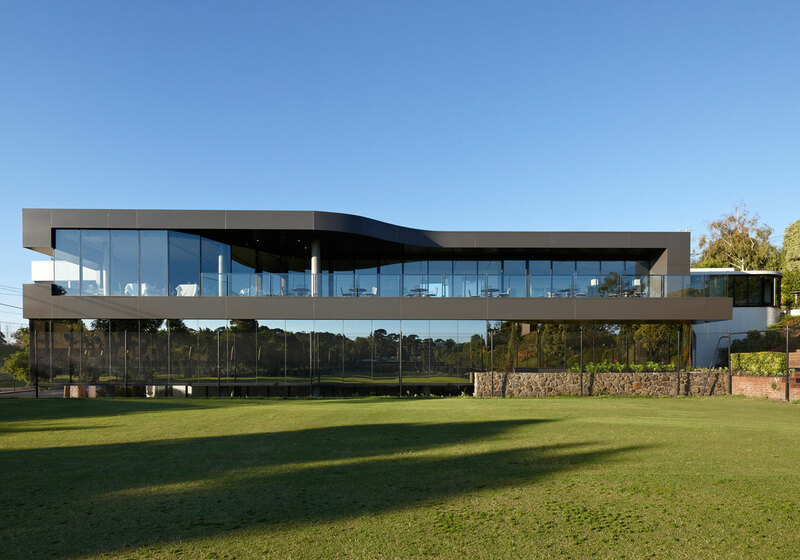 Truly a design for all ages, the club has seen an increase in membership since its completion. 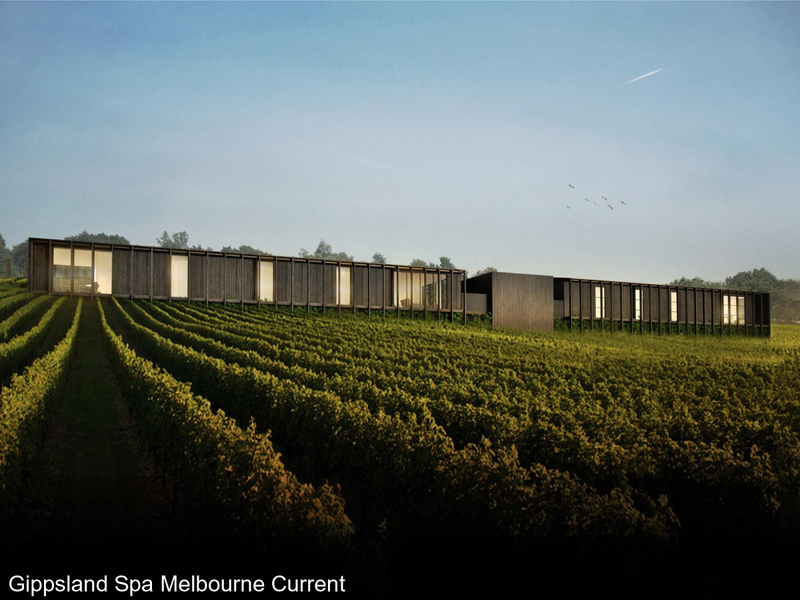 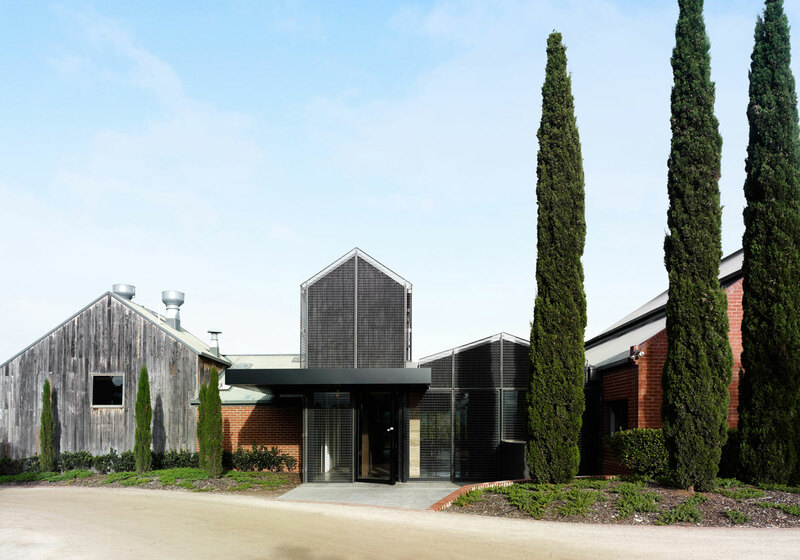 Located on the Mornington Peninsula, Willow Creek Vineyard is the site for a new Cellar Door and Bistro. 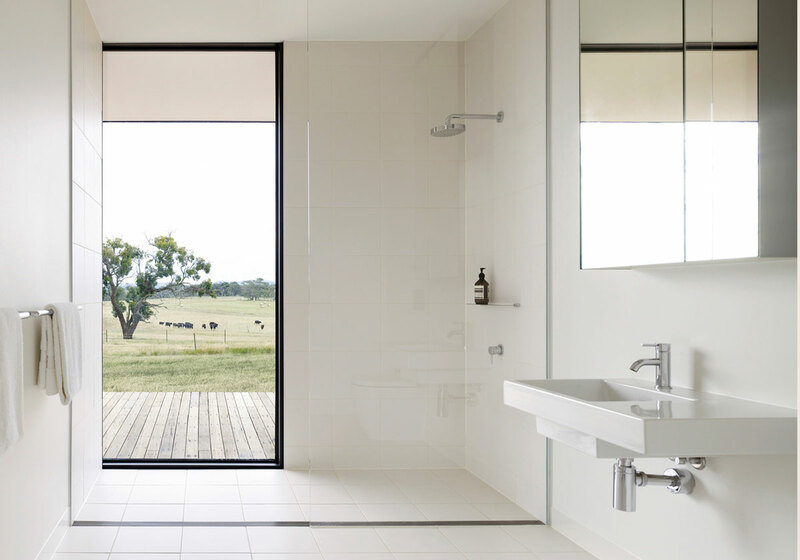 As phase one of a broader development, the architecture and interior reflects a strong contemporary design that sits embedded in the rural landscape adjacent to the original Edwardian house. 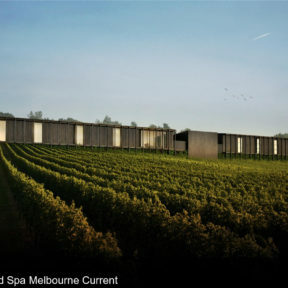 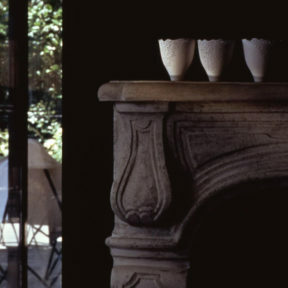 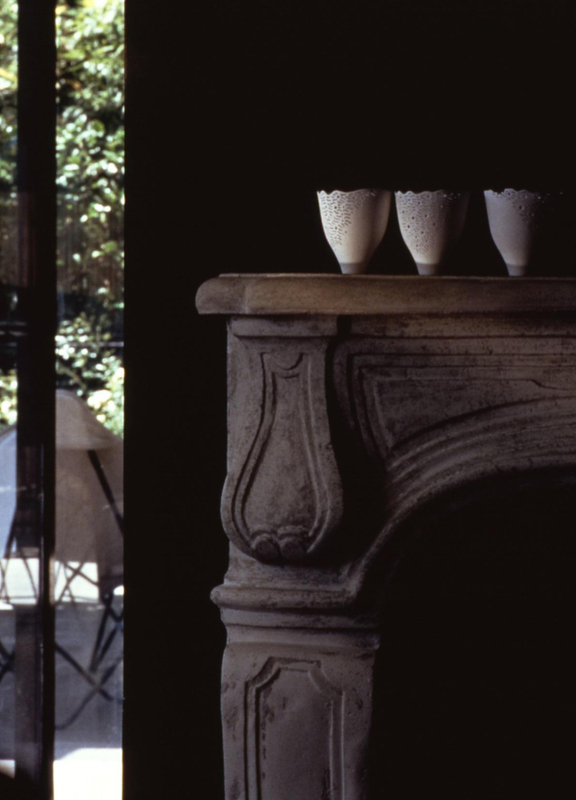 From arrival to departure, guests are kept aware of the connection to the artisanal wine-making process through selection of authentic materials and discrete views. 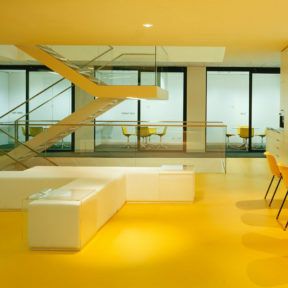 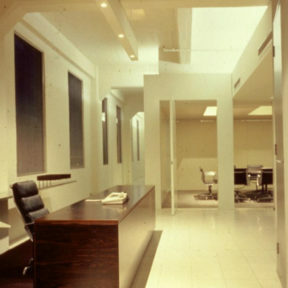 Carr designed contemporary office fit-out in the east tower at Southgate for Amor, a packing company. 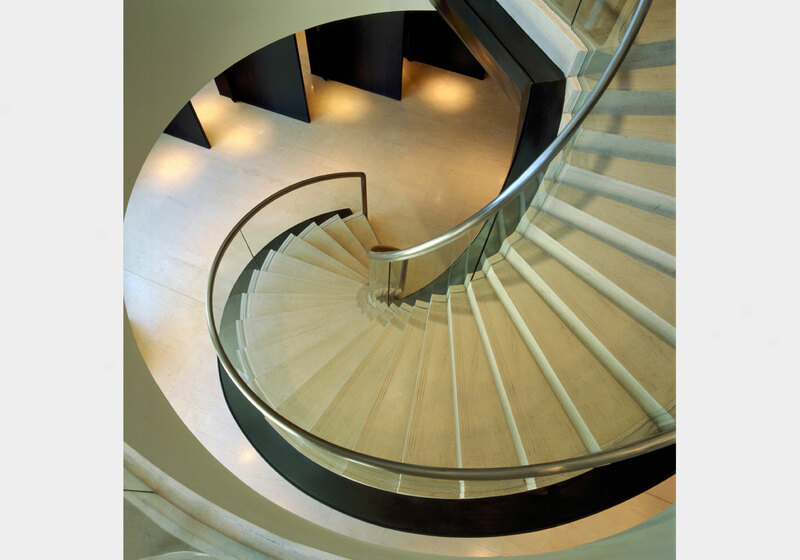 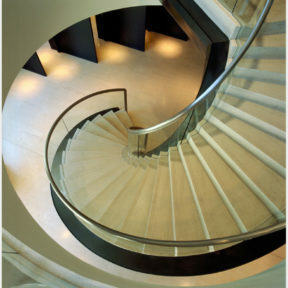 The expansive limestone clad entry foyer provides a strongly branded client space while an inter-tenancy spiral stair links to the upper level. 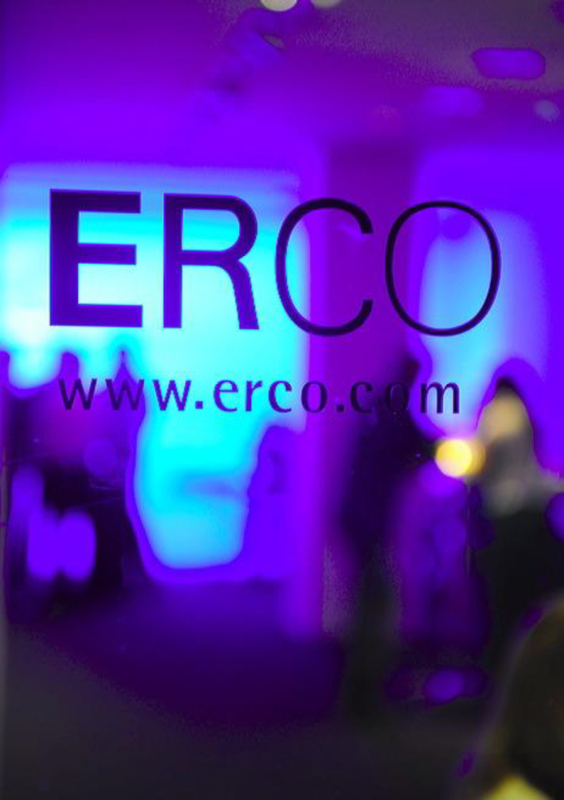 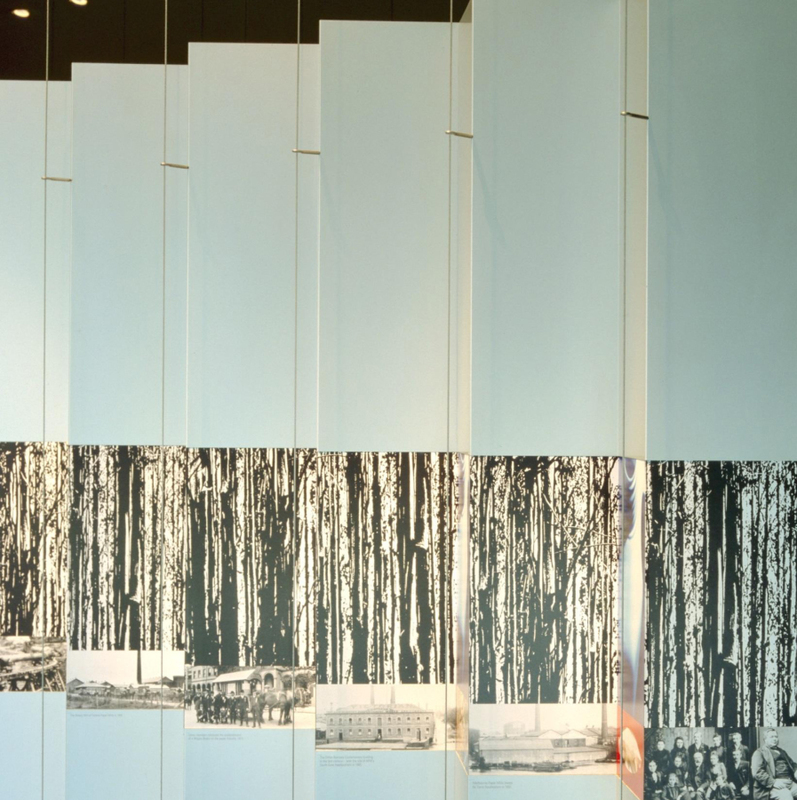 A kinetic wall demonstrates Amcor’s history and future business interests. 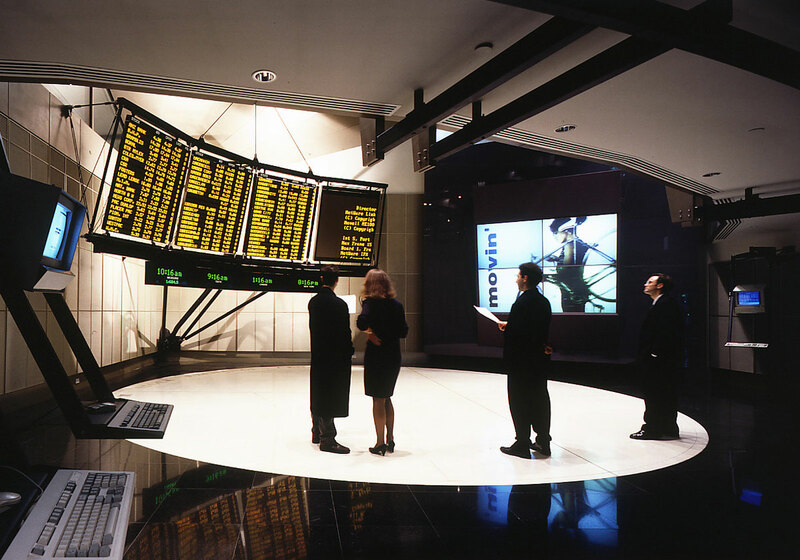 To provide “somewhere for the people to find out what is going on” was the challenge presented by the Chairman of the Australian Stock Exchange when the traditional Melbourne Trading Floor was to be replaced with automated trading at in a new facility. 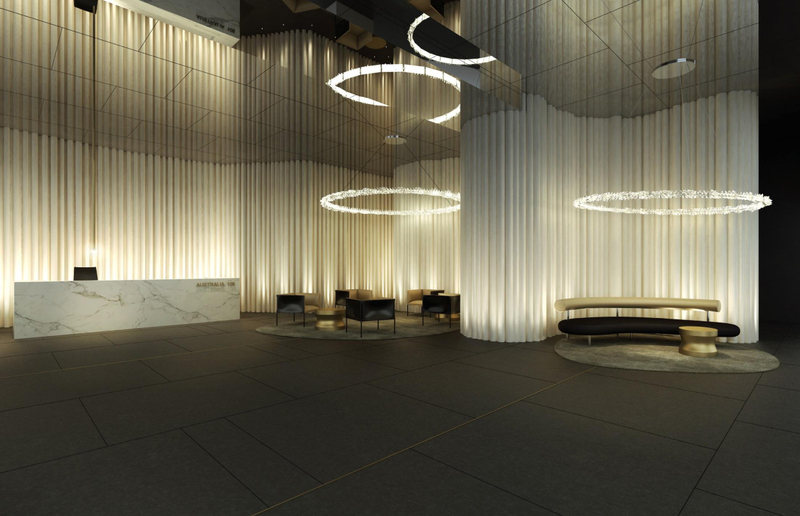 Pushing new technologies, the area includes the first-ever LED digital display board, a multi screen video wall and 10 touch screen interactive information terminals. 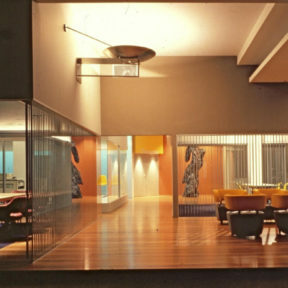 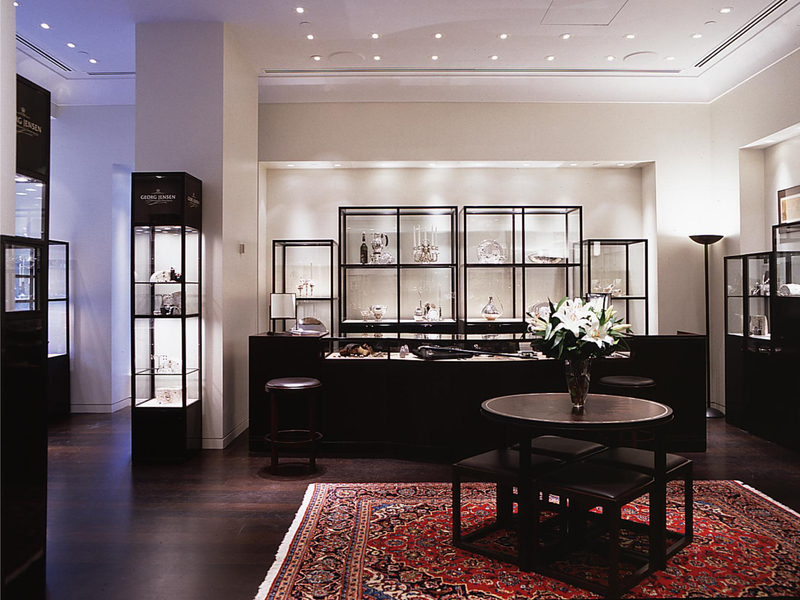 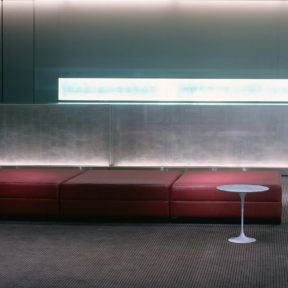 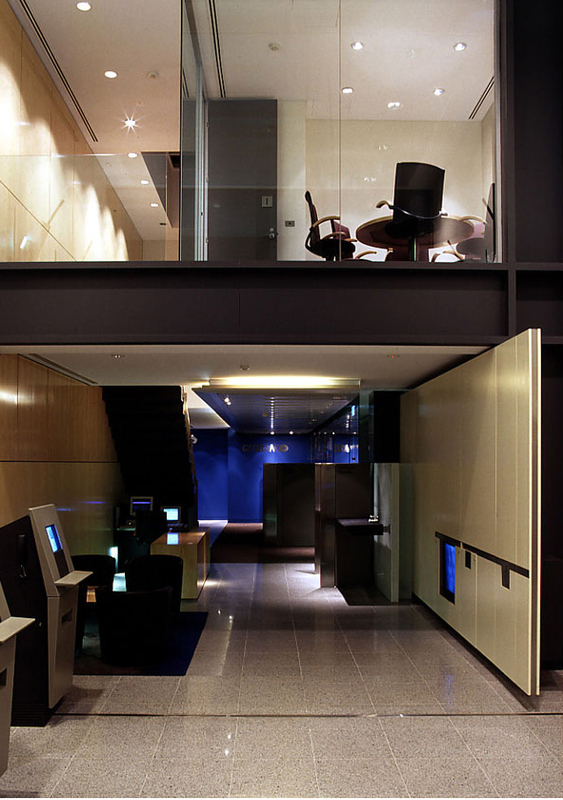 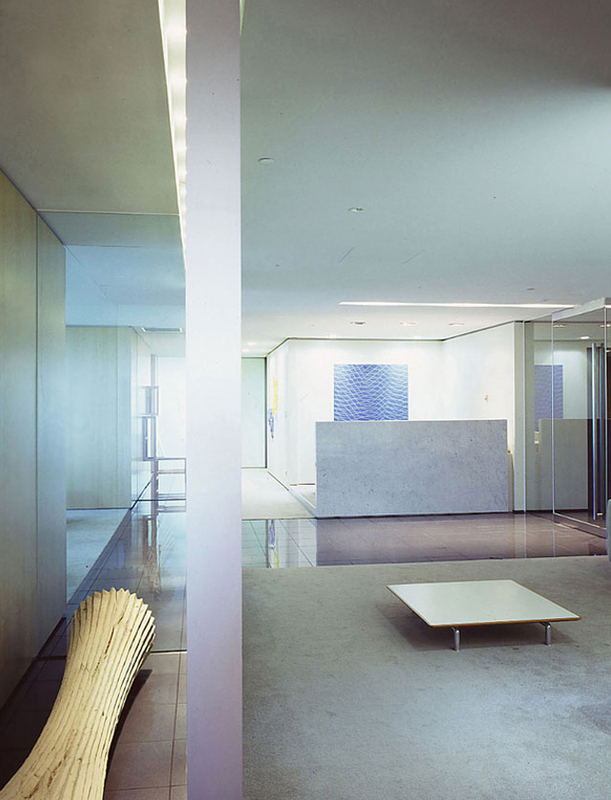 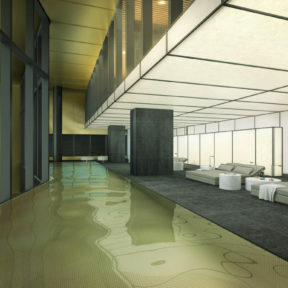 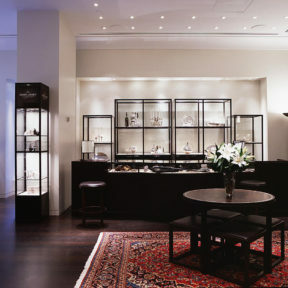 Sumitomo, one of the world’s largest trading companies commissioned Carr to design their Sydney premises. 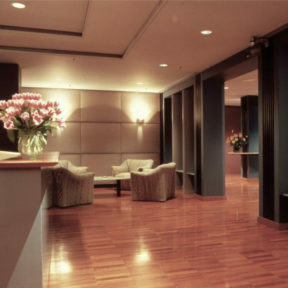 The office occupies the whole floor of level 41 Governor Phillip Tower. 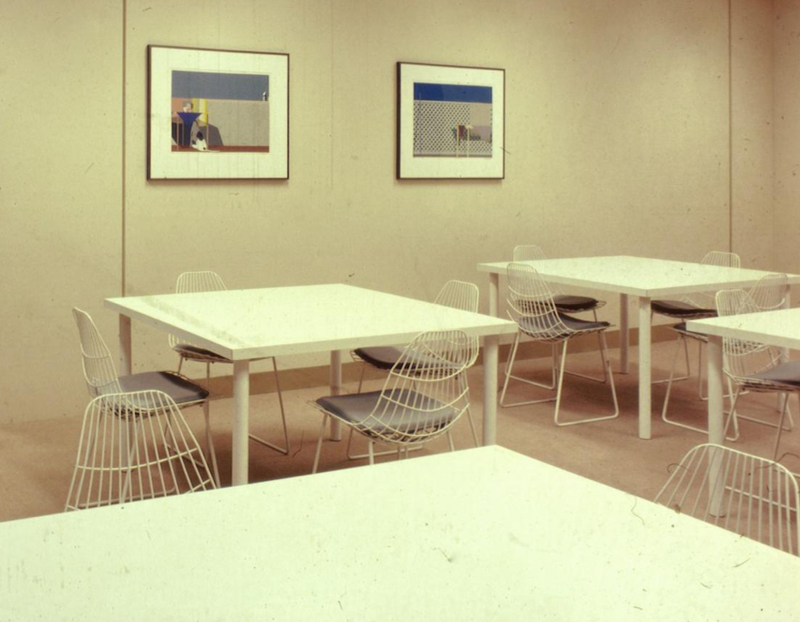 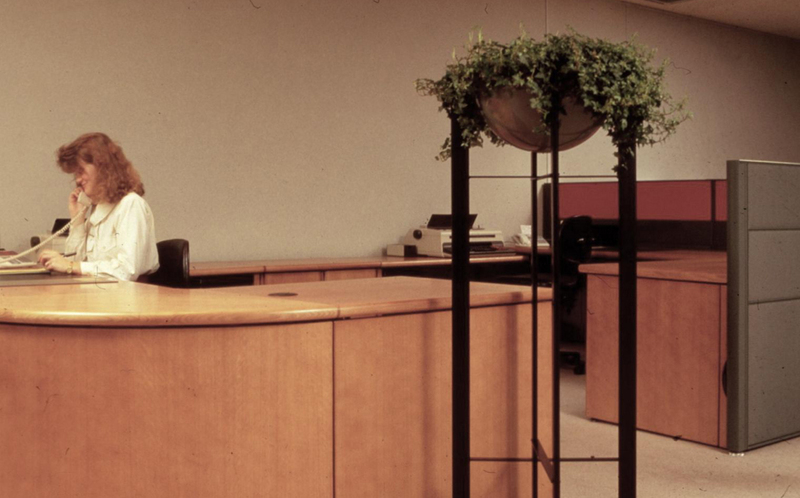 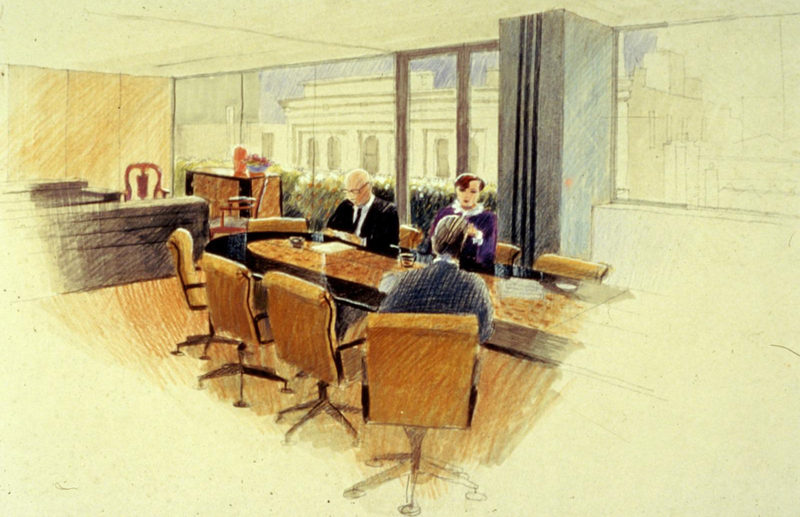 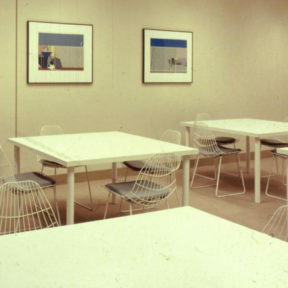 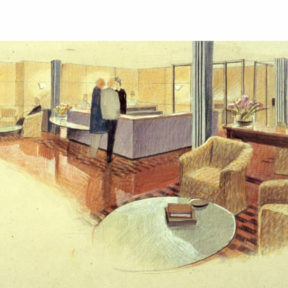 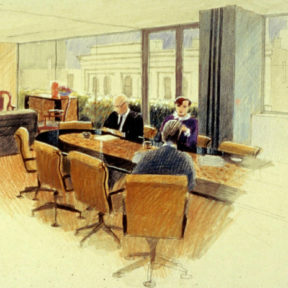 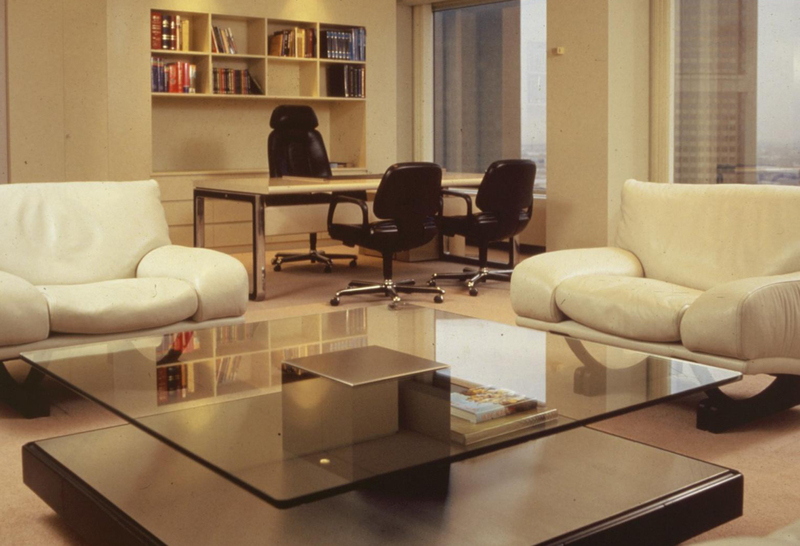 The staff of 55 were accommodated in new open plan workstations with boardrooms and meeting rooms taking full advantage of the magnificent views of Sydney Harbour. 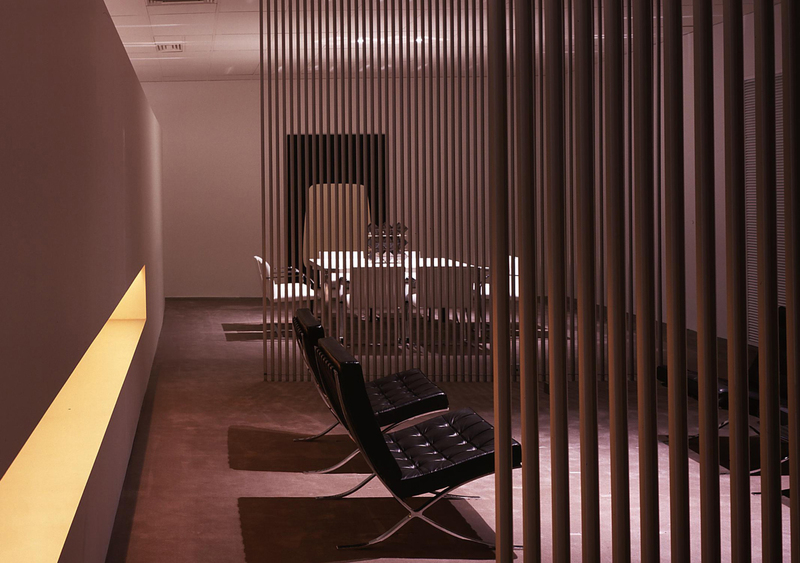 Carr worked closely with both the client and specialist consultants to develop a new worldwide banking facility – an “unmanned” branch network. A kit of parts was designed for implementation into any site location and construction was completed for this prototype within a short 10 week period. 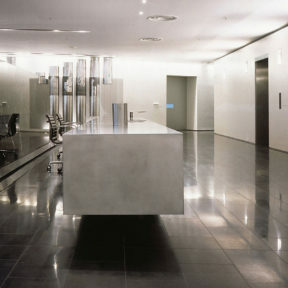 Successfully positioning the client at the leading edge of their industry, the concept has since been repeated worldwide. 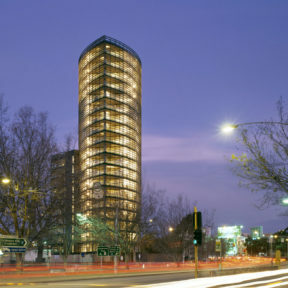 Having obtained the naming rights to the landmark State Bank Building in Adelaide, Santos appointed Carr to bring together the various Santos offices throughout Adelaide and consolidate their premises to one tenancy. 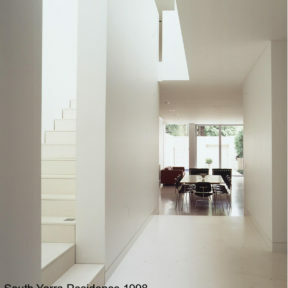 In spite of the triangular building footprint, a planning grid was established to maximise ongoing flexibility. 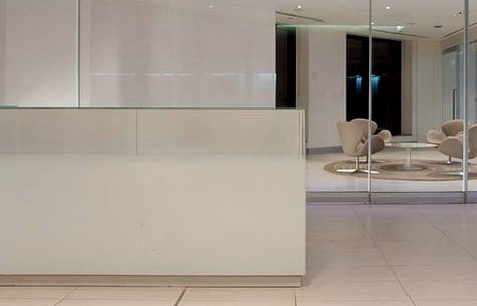 Carr cleverly incorporated existing furniture throughout the new tenancy without compromising the design impact of the new workplace. 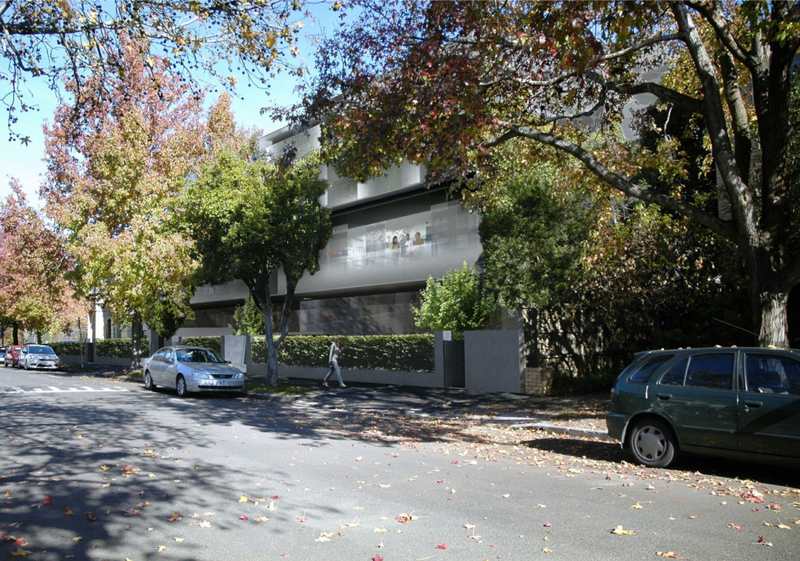 Prior to commencing a scheme for the headquarters of Tabcorp Holdings Limited, Carr also worked with the client in developing relocation strategies. 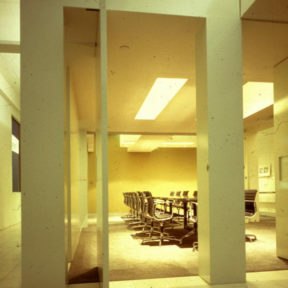 With a building selected, glazed offices and service facilities were blocked around the core to create an ordered centre within a complex building footprint. 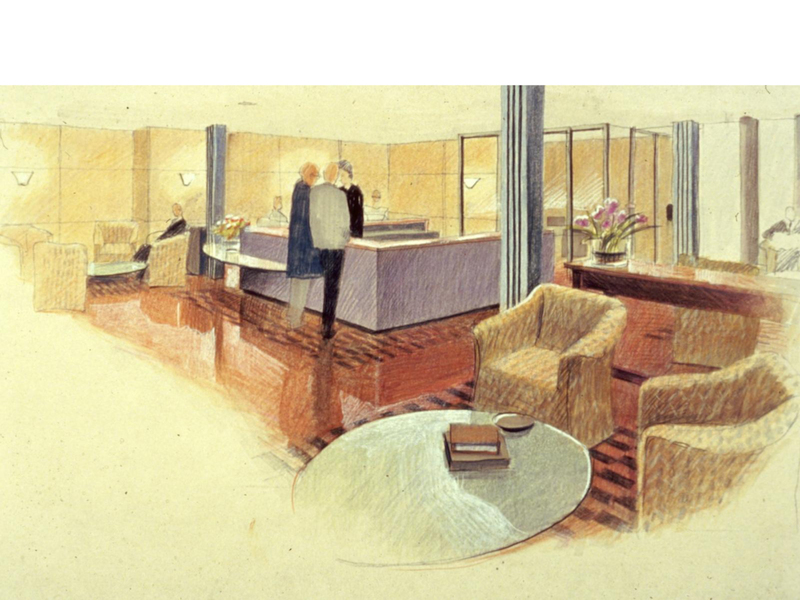 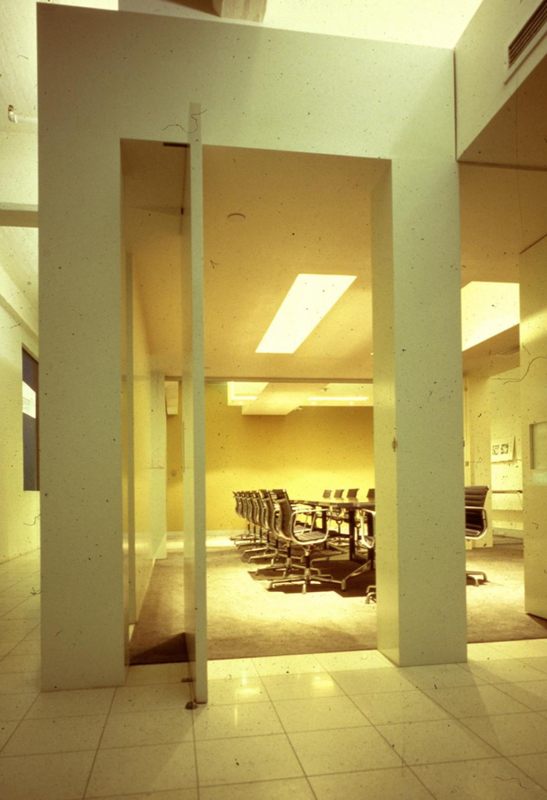 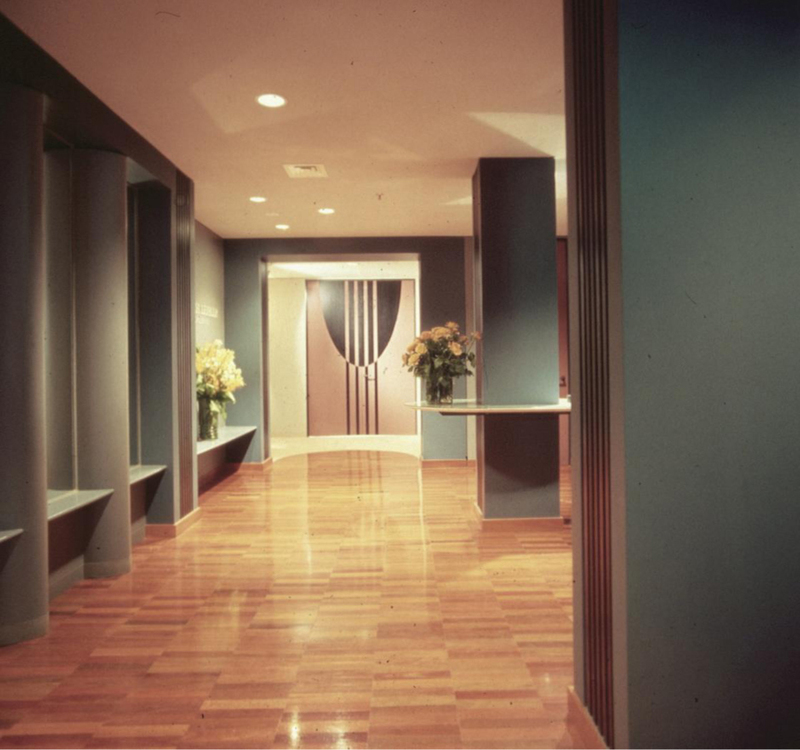 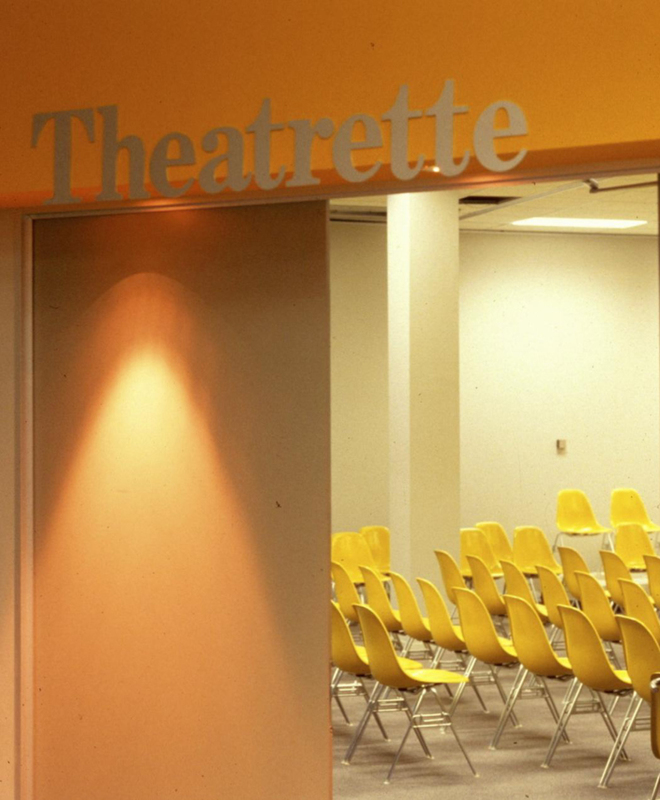 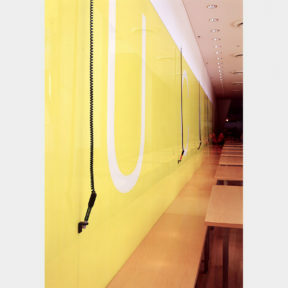 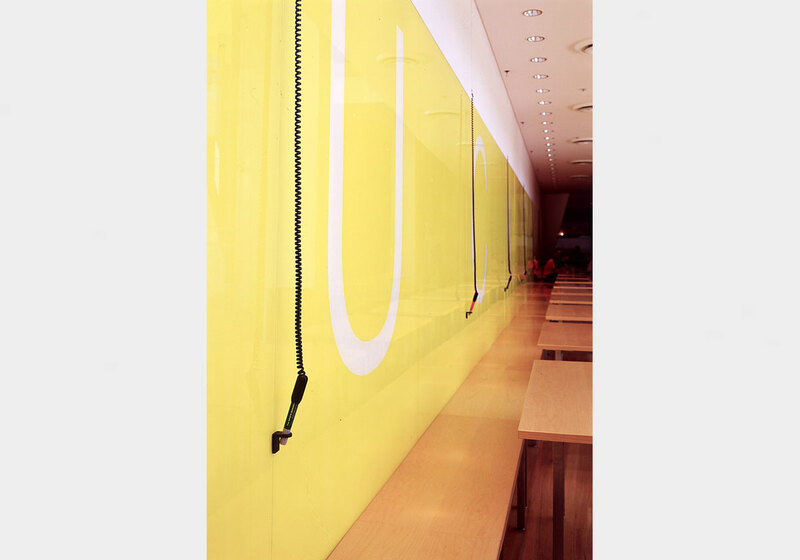 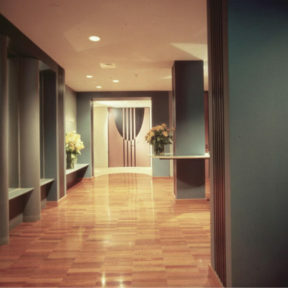 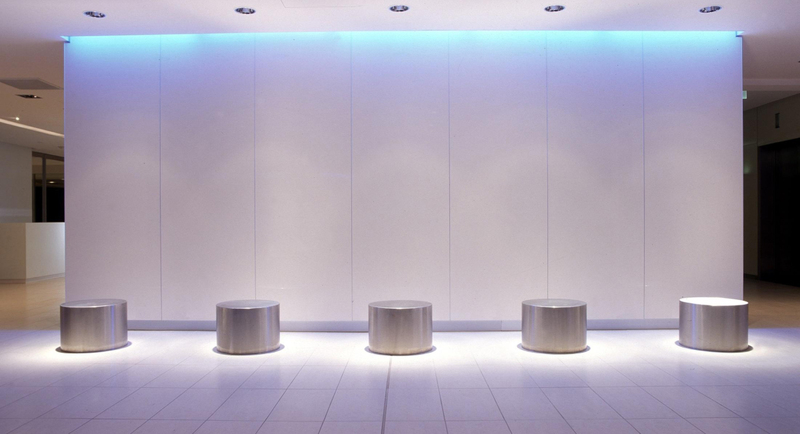 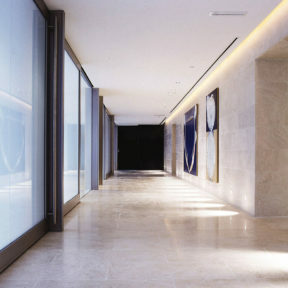 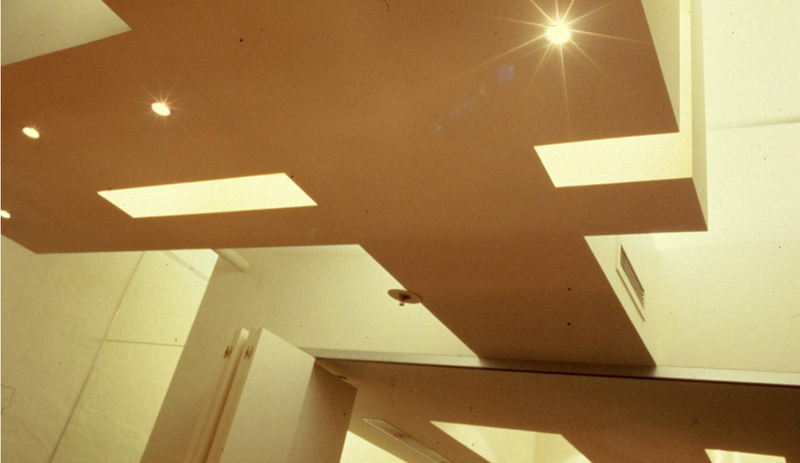 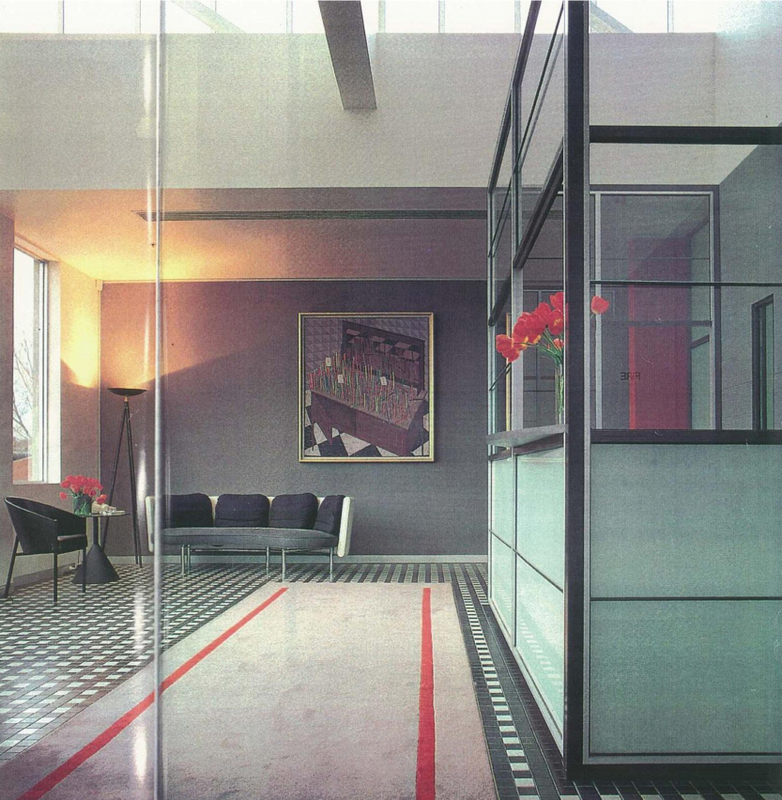 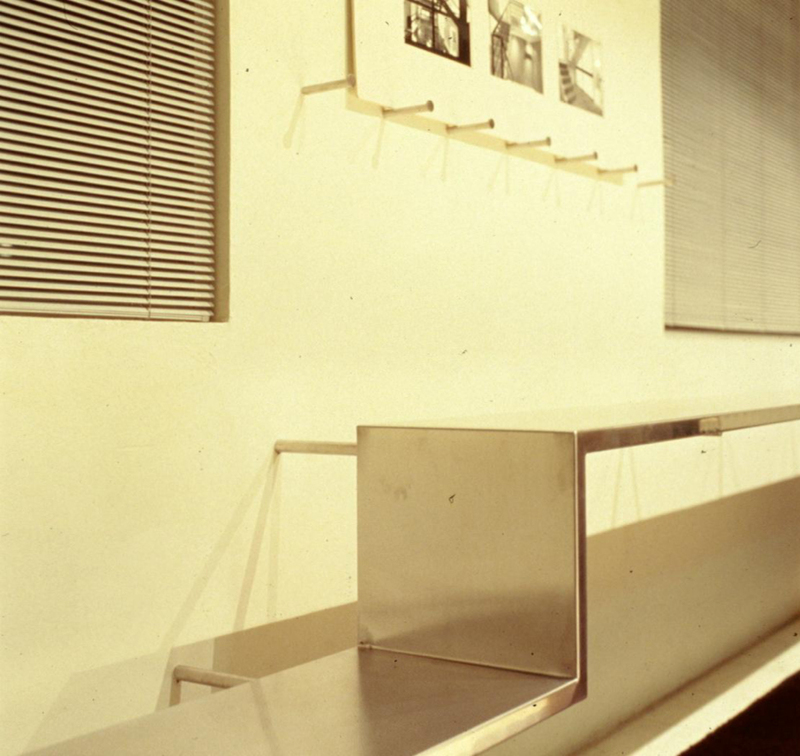 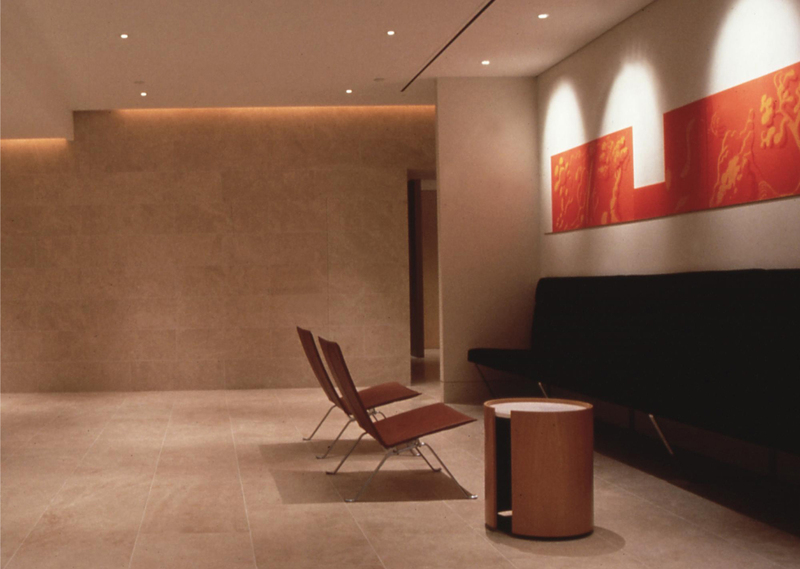 Carr’s scope included design of the ground floor lobby which incorporated a striking art wall and exhibition space. 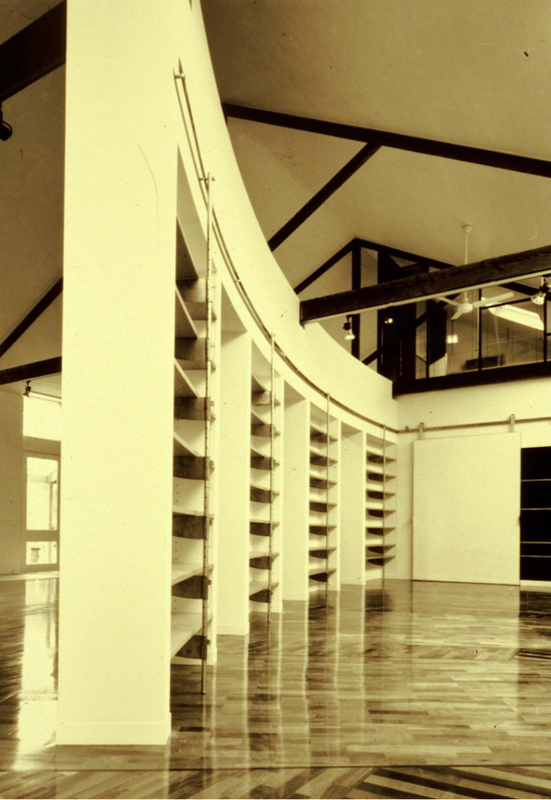 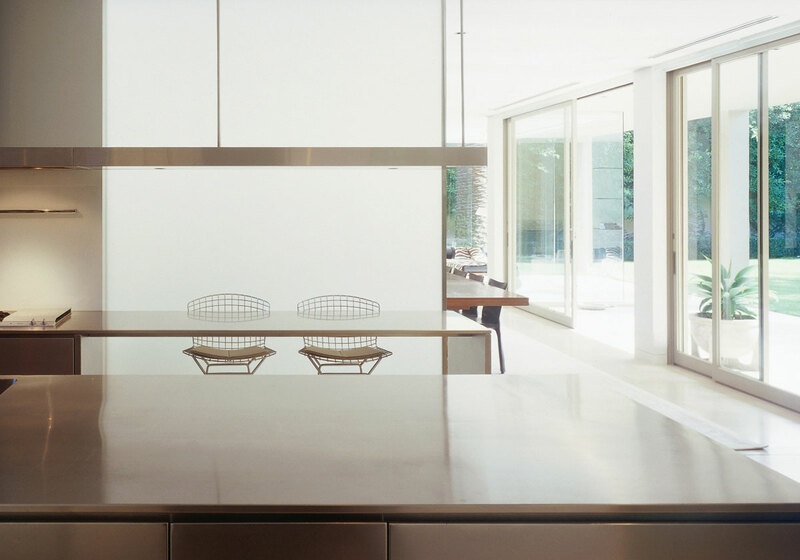 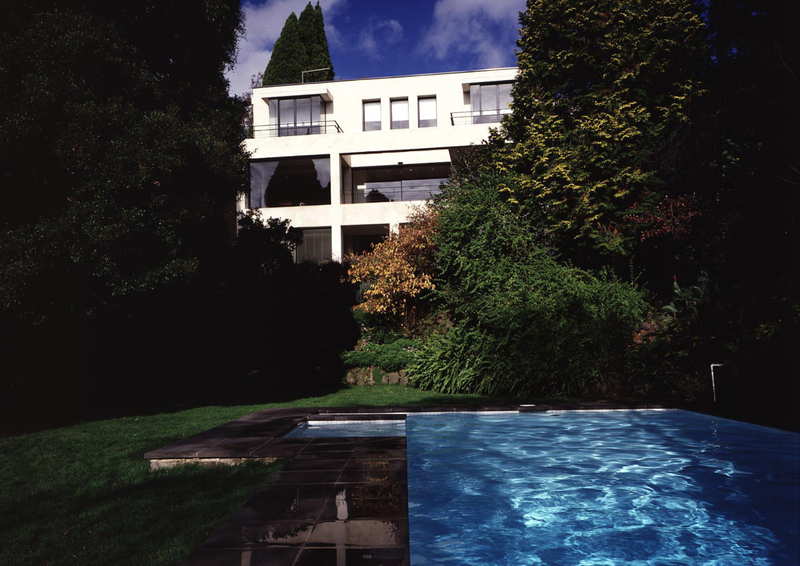 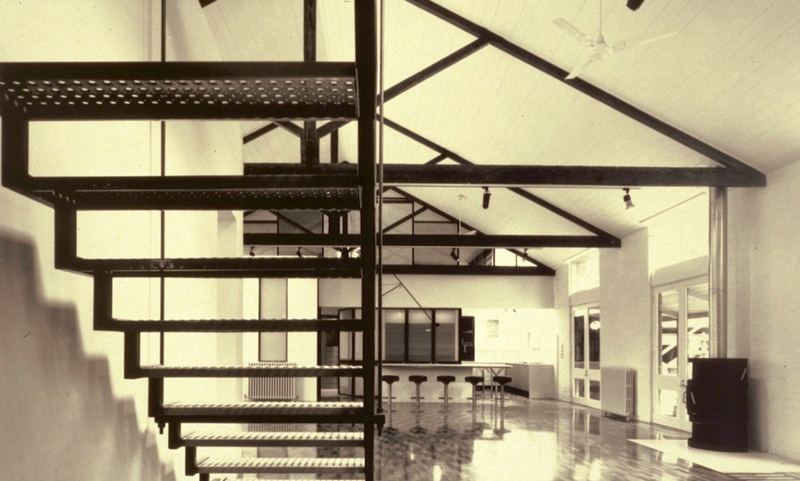 As a testament to Carr’s timeless design approach, the Knowles Group Tenancy is lasting example of modern design. 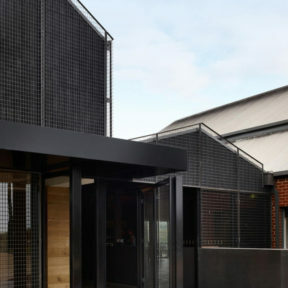 Developed through a researched understanding of client needs rather than fleeting trends, the design embraces central courtyards to bring natural light and ventilation to the work spaces which are fully accessible to staff. 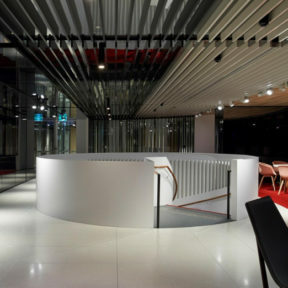 Norton Rose Fulbright Melbourne signifies the fourth installment in the national roll-out of a unifying, contemporary national identity for Norton Rose’s 600 partners and lawyers. 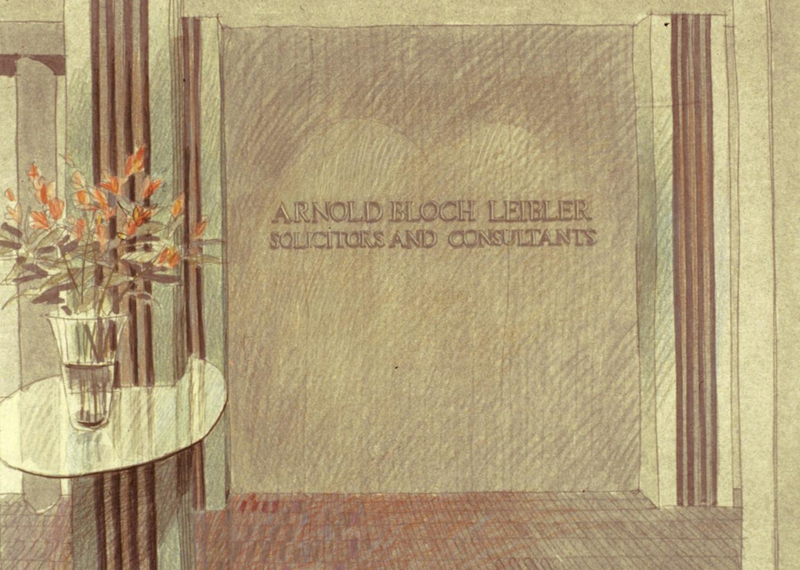 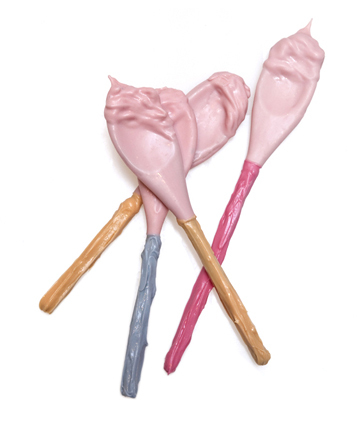 In keeping with the national design strategy, use of vibrant colours and clean-lined aesthetic have successfully rewritten the rulebook on what it means to be a contemporary law practice in fast changing times. 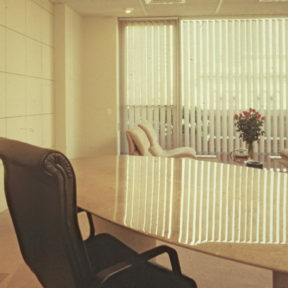 Over Fifty Group is a funds management and financial services company that specialises in meeting the financial and lifestyle needs of the over 50 community. 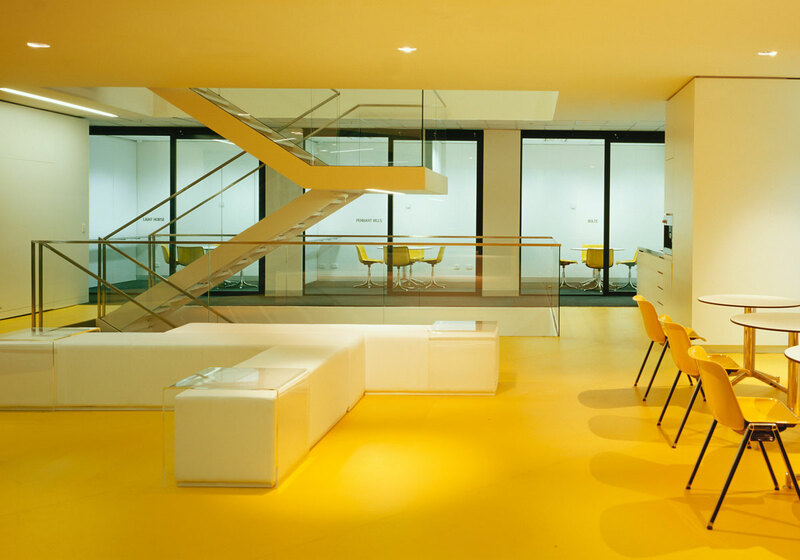 This tenancy was designed to support the re-branding of Over Fifty Group by positioning the firm as a progressive organisation responding to the needs of an increasingly dynamic group of over fifties clientele. 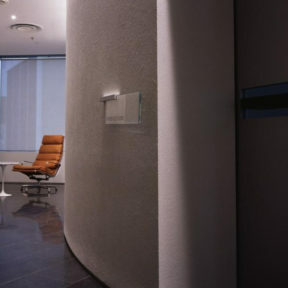 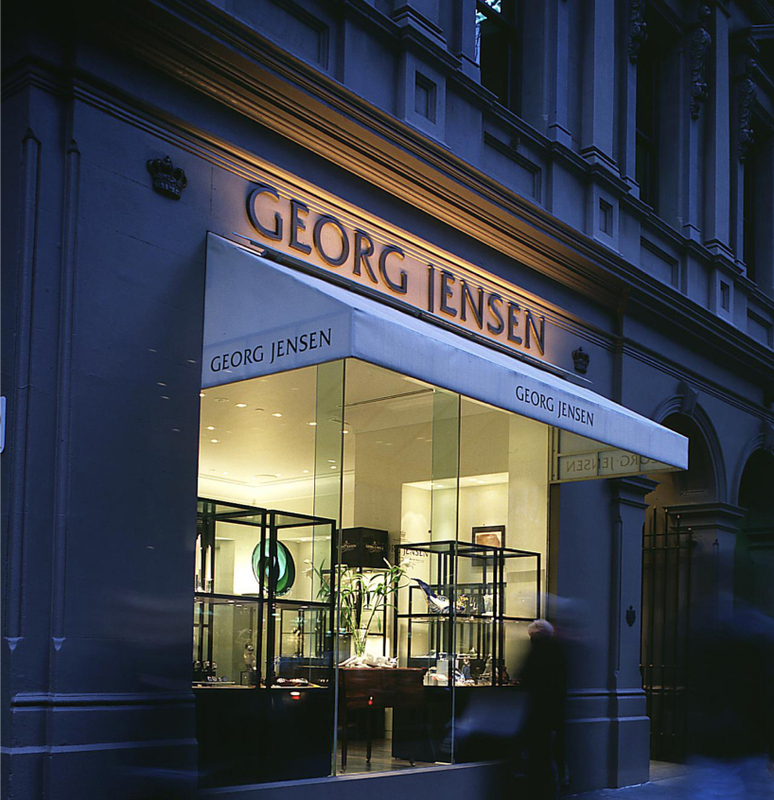 Located on Little Collins Street Melbourne, the four level Transurban tenancy brings a degree of inventiveness to the typically uninspiring spaces often accommodating Operation Centres. 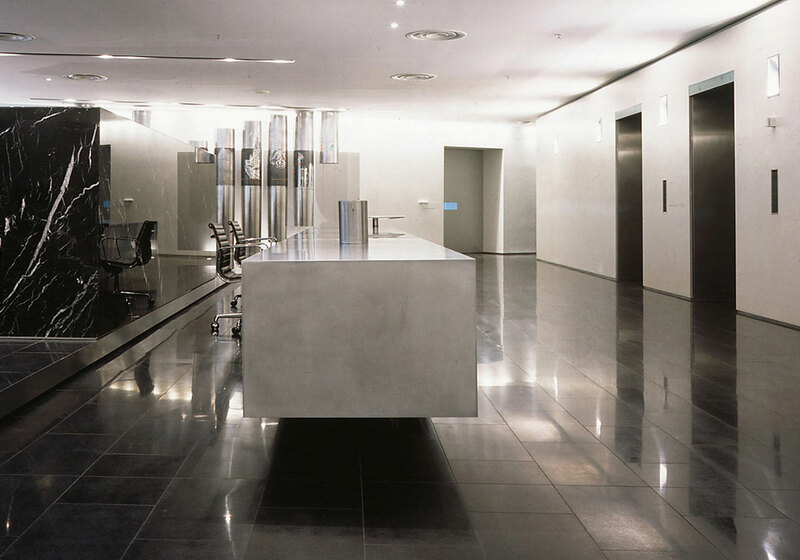 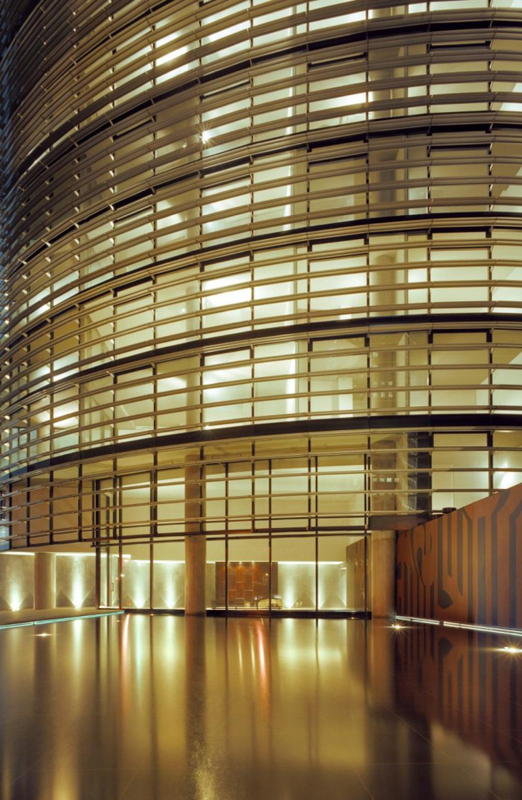 Central to the design is the architectural ‘tunnel’ that adopts various functions according to the level including reception, boardroom and a glass server room. 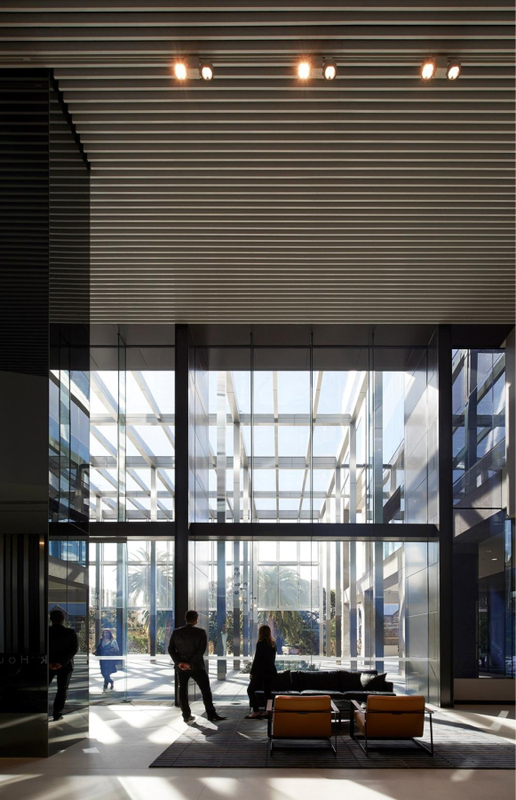 This glass and steel structure provides an important focus drawing attention away from a limited external view towards a lively, exciting work hub. 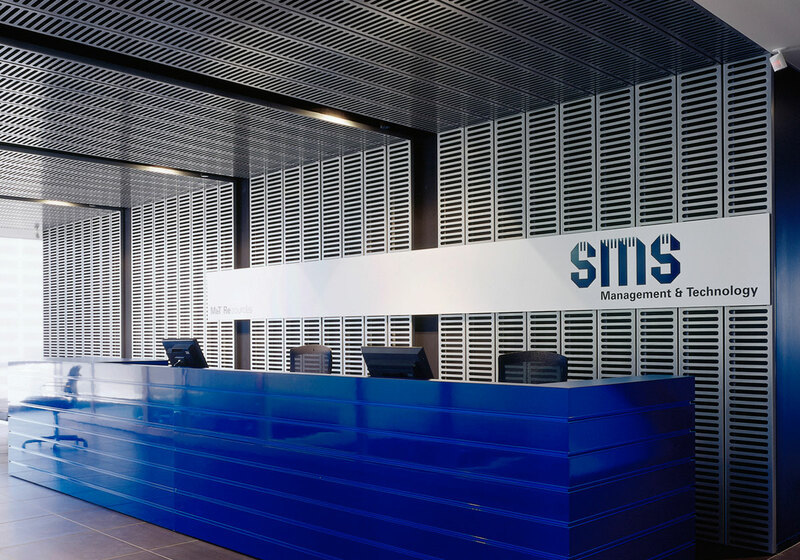 Located across the top three levels of 140 William Street Melbourne, the SMS workplace is designed to inspire and stimulate. 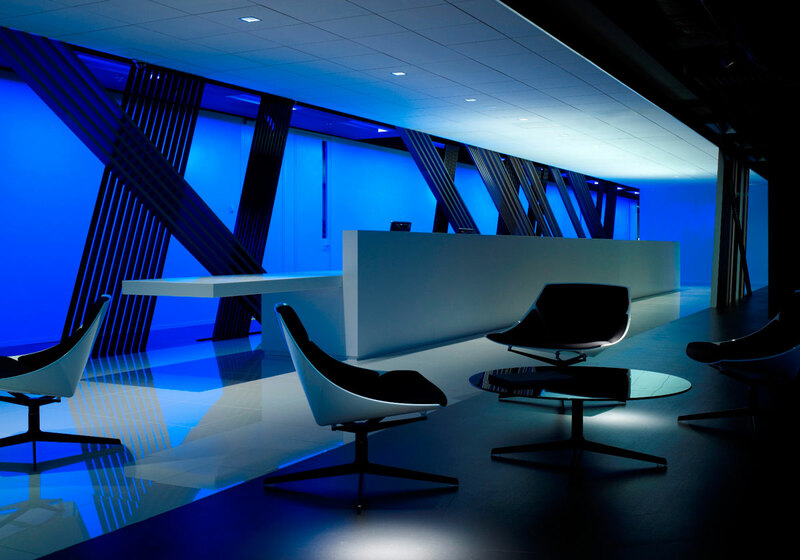 The development of vibrant, modern spaces creates a sense of optimism and progression, embodying the SMS culture and entrepreneurial spirit. 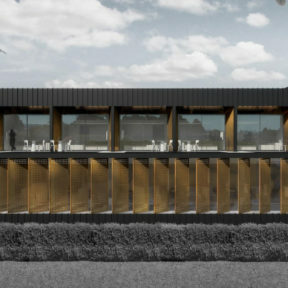 Through modular flexibility, the plan accommodates the current team of 90 with the capacity to accommodate 130 within the same footprint. 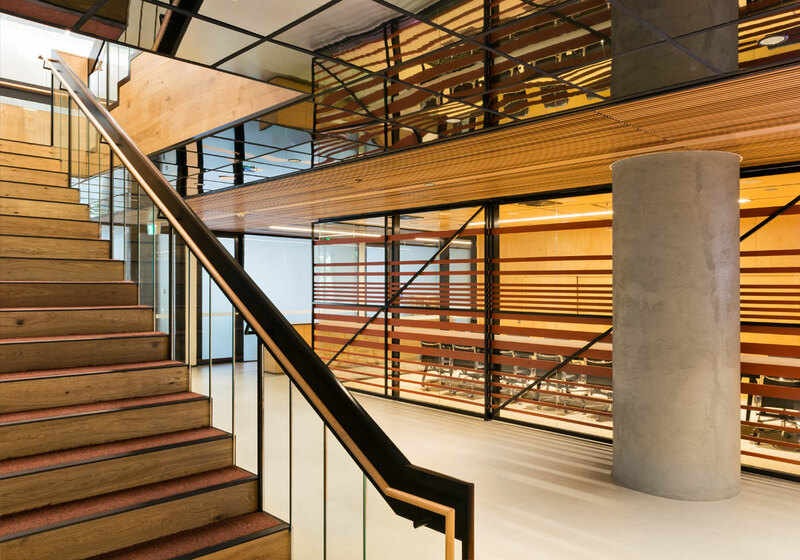 The five-level fit-out in Sydney’s iconic Grosvenor Place, creates collaborative spaces positioned around a defined circulation hubs at the centre of the tenancy. 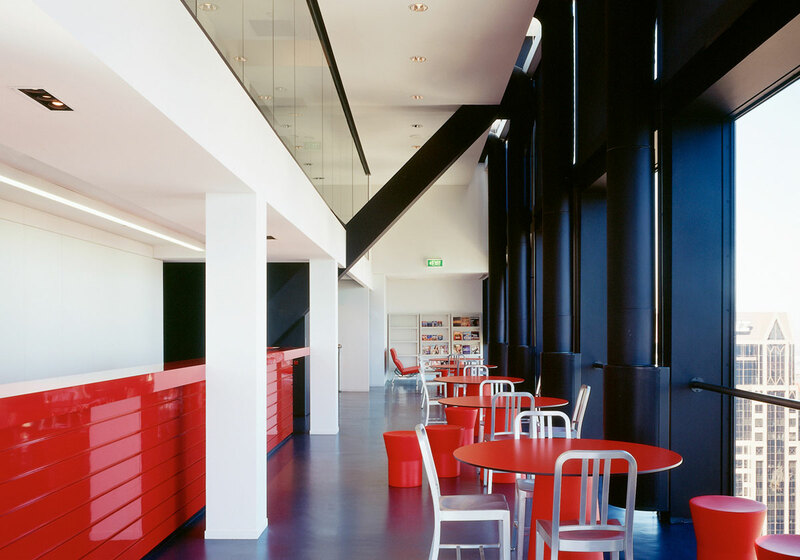 These hubs, in the form of cafés, libraries and casual meeting areas, are distinguished by intense colour used sparingly but dramatically. 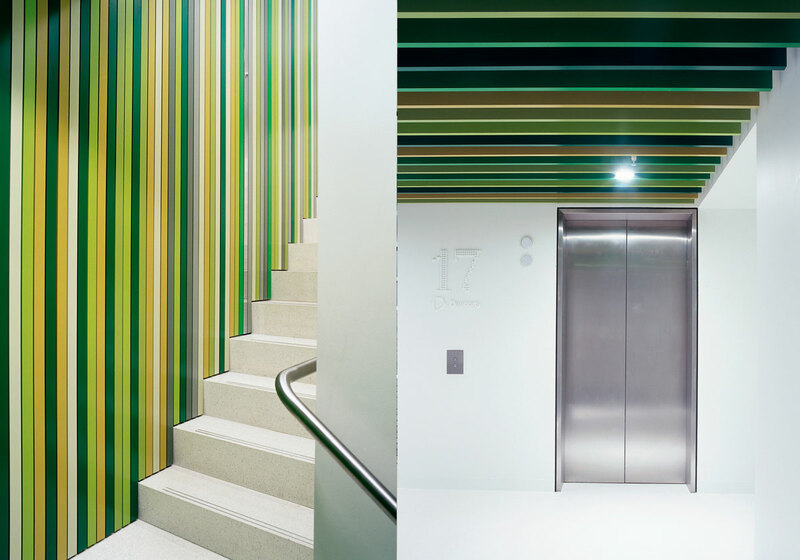 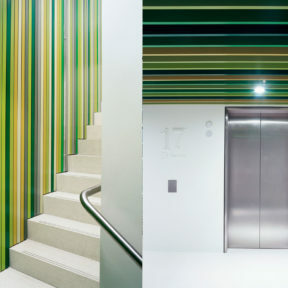 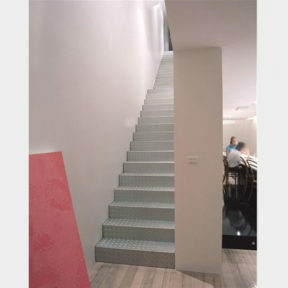 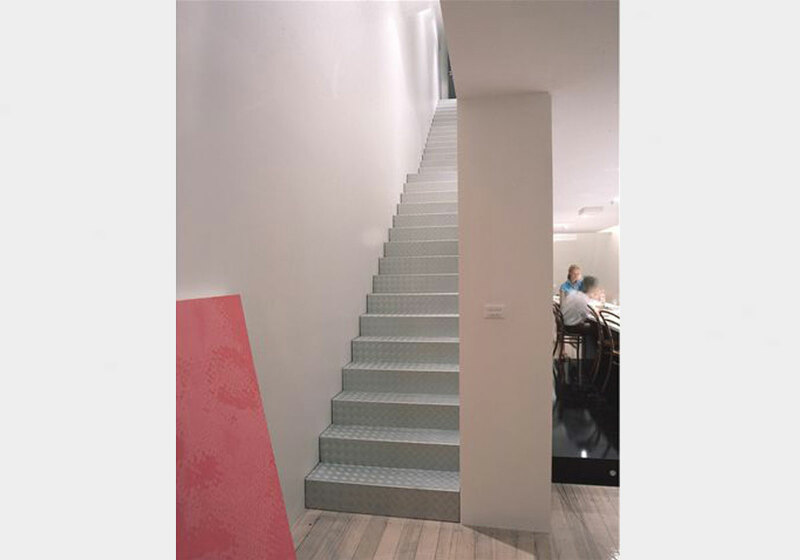 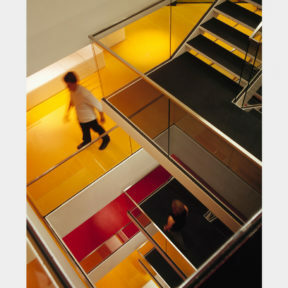 The centre point is the inter-tenancy stair, lined with over 500 aluminium extrusions of varying colours, creating an anchor to identify the user’s location within the tenancy. 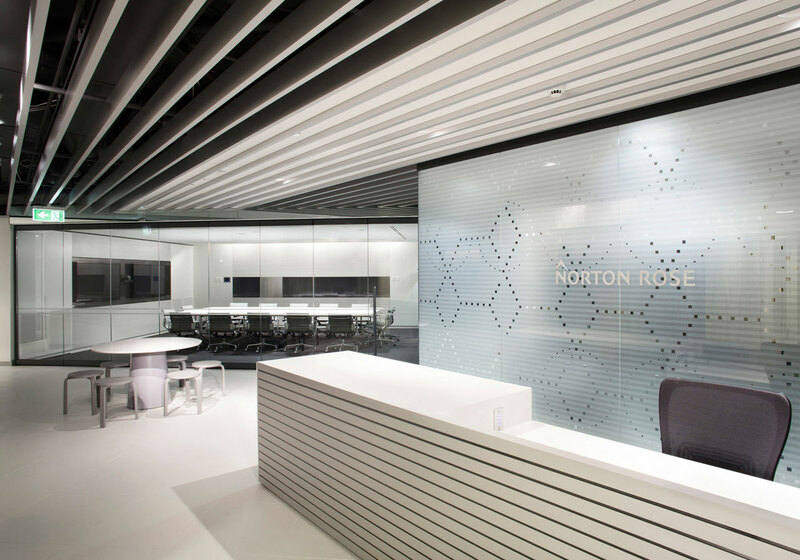 The Boston Consulting Group (BCG) is one of the world’s leading management consulting firms who, for many years, has been at the forefront of business strategic thinking. 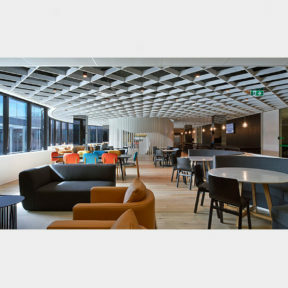 Ultimately reducing the occupied space yet accommodating an increase in staff capacity assisted BCG in maintaining, their A grade location through achieving substantial economic advantages. 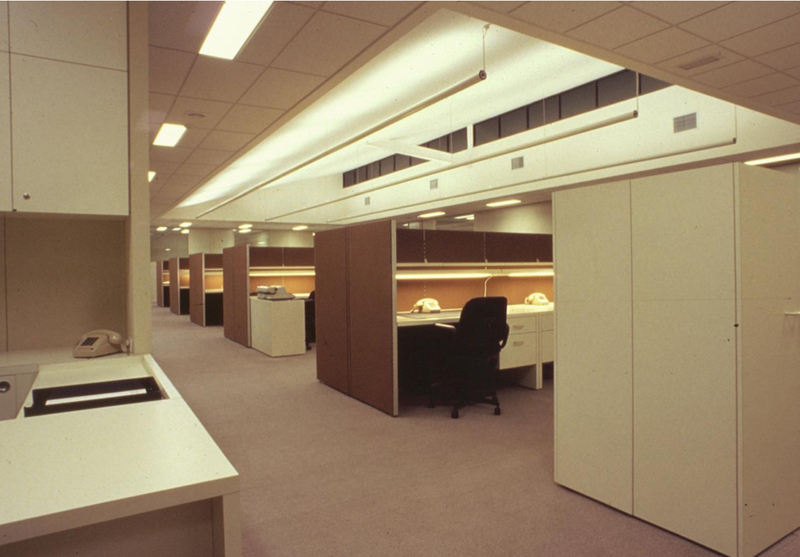 The efficient solution maximised capacity while still accommodating a primarily enclosed office plan. 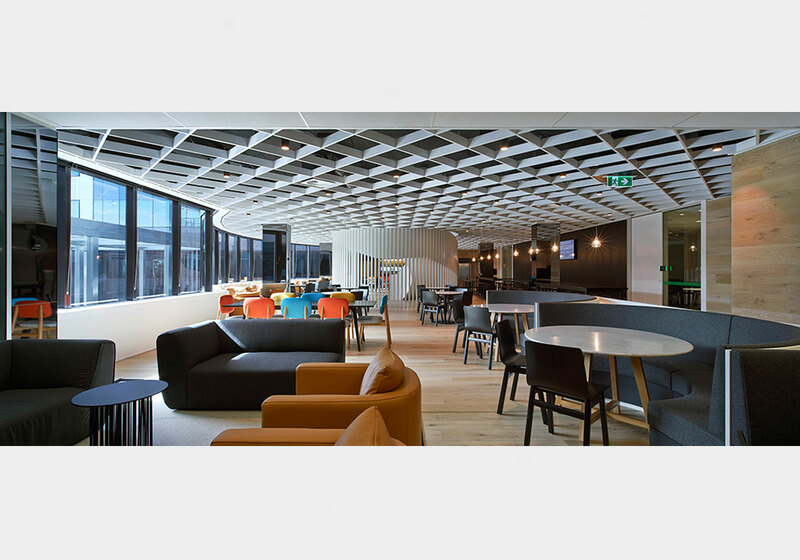 The new Minerals and Metals Group workplace needed to be responsive to what was a rapidly evolving industry with the key focus being to provide flexibility. 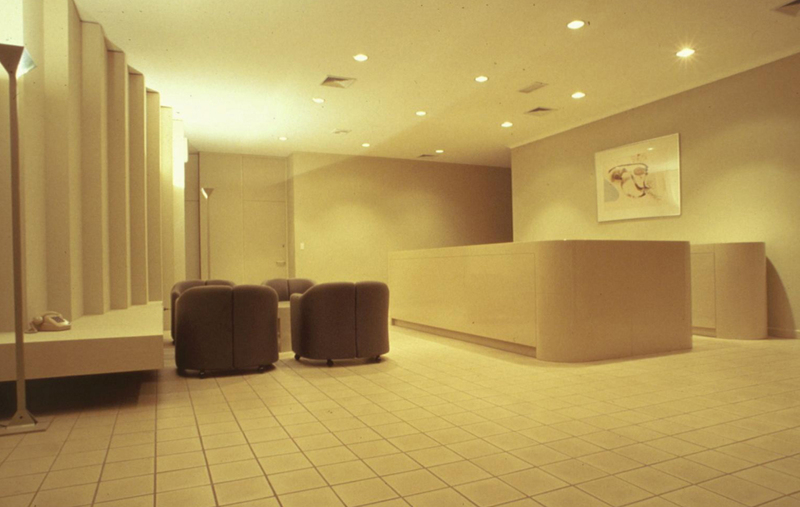 Planning accommodated for growth and expansion and was proven successful for two years into their lease. 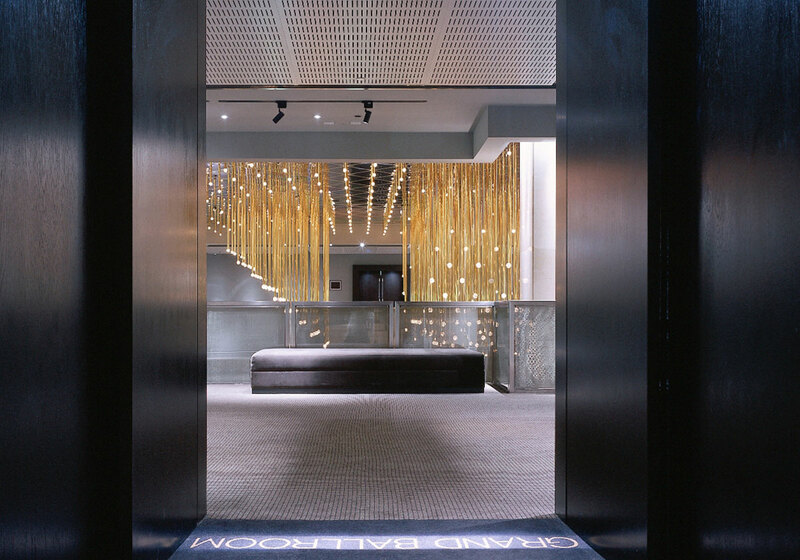 The architectural language of the scheme elegantly displays minerals and metals exploration as well as references to their commitment to industry safety. 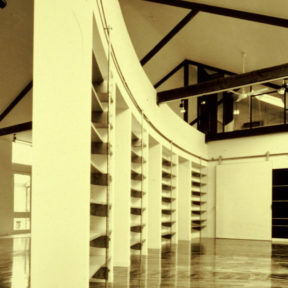 Carr assisted the organisation in 2011 to expand their capacity whilst maintaining the same footprint. 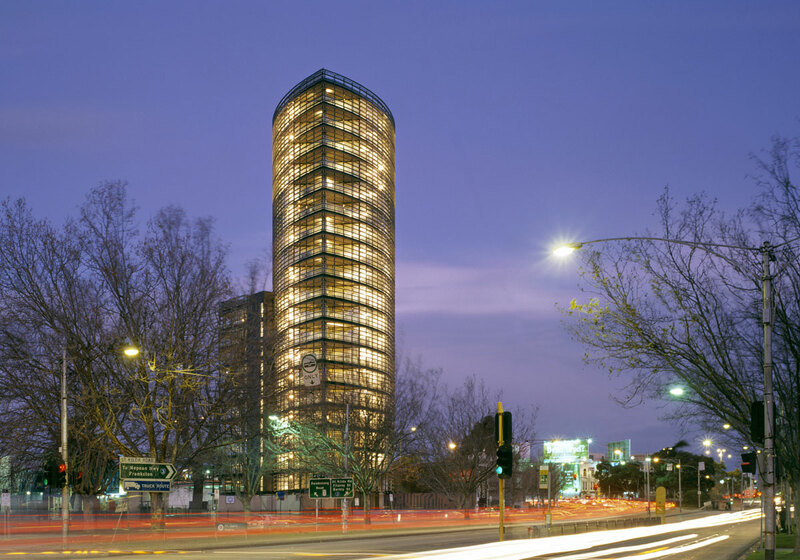 Given the recent merger of global law practice Norton Rose with Deacons (now Norton Rose Fulbright), it was important for the Canberra office to establish Norton Rose’s global values within the context of Australia. 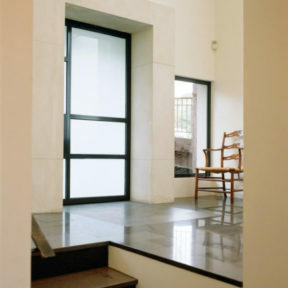 The front of house takes on a modernist appeal providing a sharp and professional introduction whist the work areas incorporate very specific references to locale. 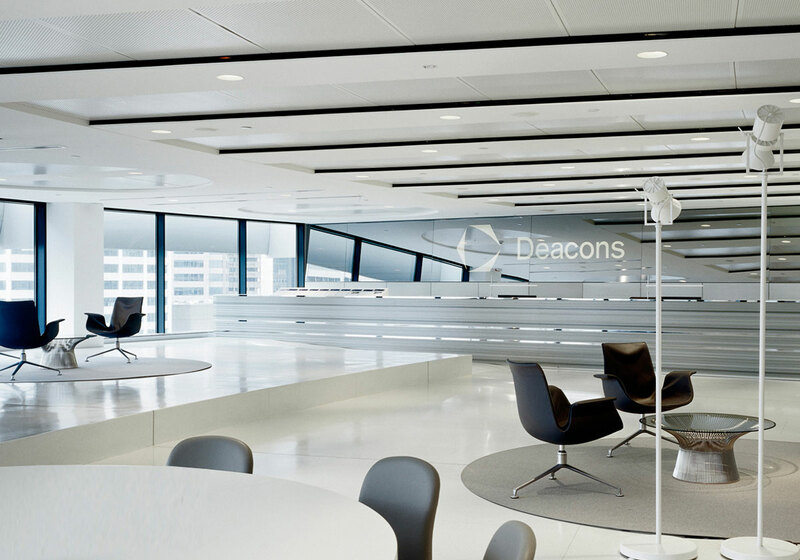 Having undertaken the roll out of workplaces for international law firm Deacons around the country, Carr was appointed to assist the organisation in rebranding its tenancies following a merger with leading global legal practice Norton Rose. 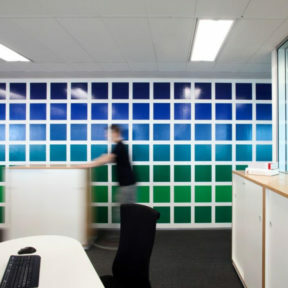 The project included external, reception and way finding signage elements for workplaces in Sydney, Melbourne, Brisbane, Perth and Canberra. 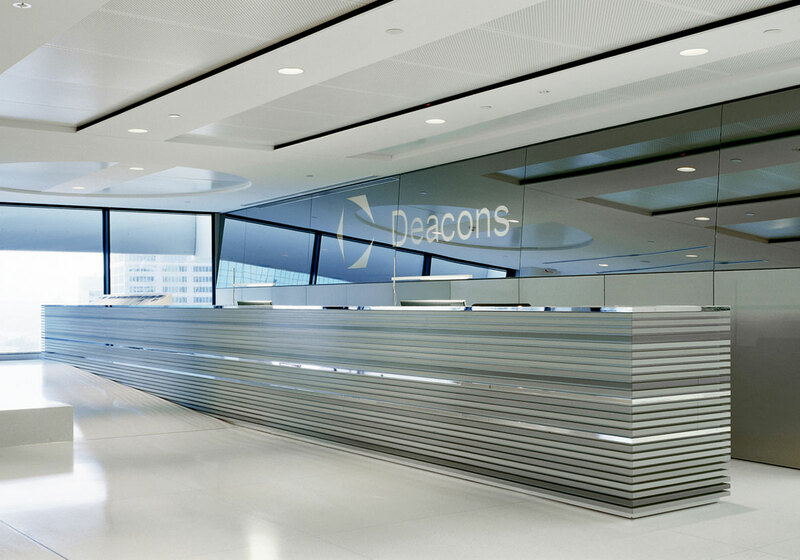 The process was recently undertaken again to accommodate the firm’s shift to Norton Rose Fulbright. 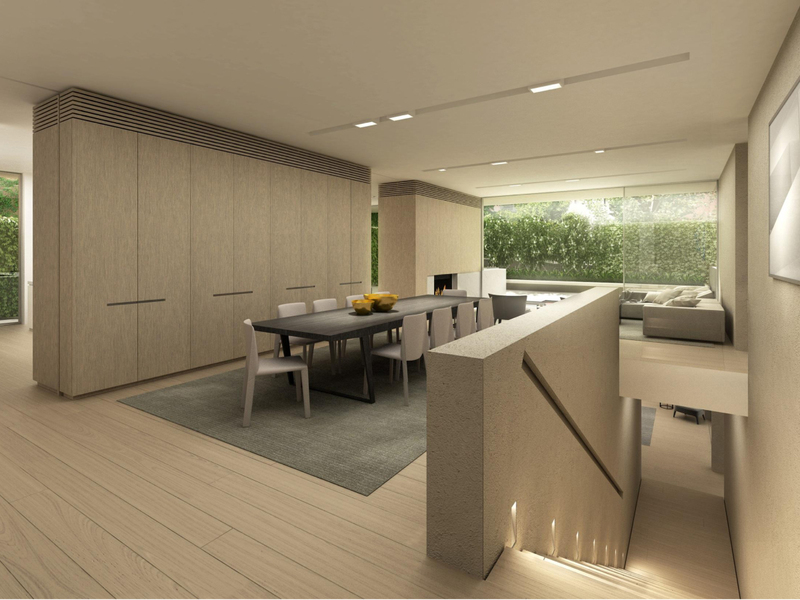 Having outgrown their existing accommodation, Renascent, a commercial fit out construction specialist engaged Carr to assist with both the choice and design of a new premise. 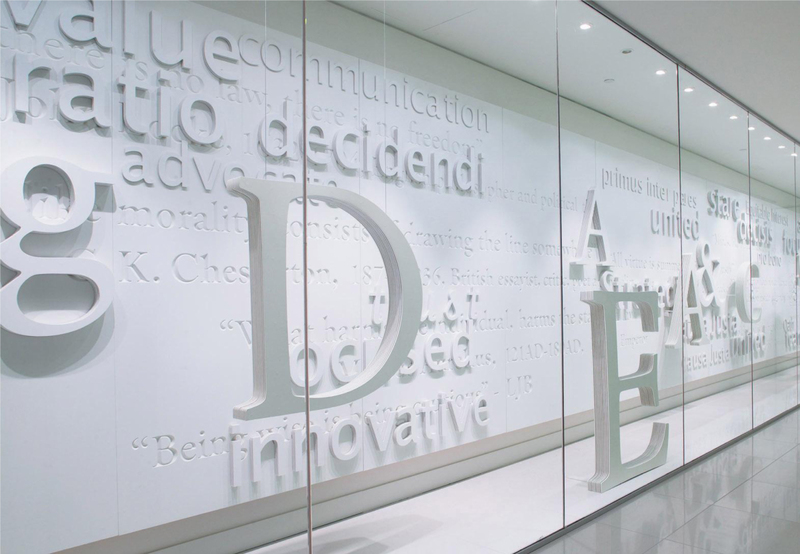 This process not only ensured strong brand and cultural alignment for their team, it also incorporated potential for long term growth. 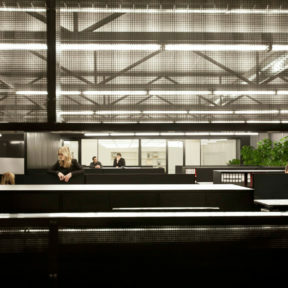 In the refurbished warehouse, industrial windows capture and frame a panoramic view of the cityscape and freeway access. 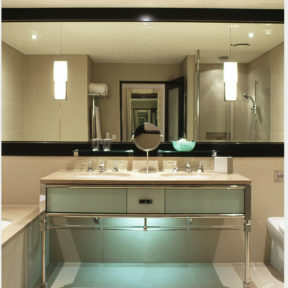 The design language speaks directly of their industry and expertise. 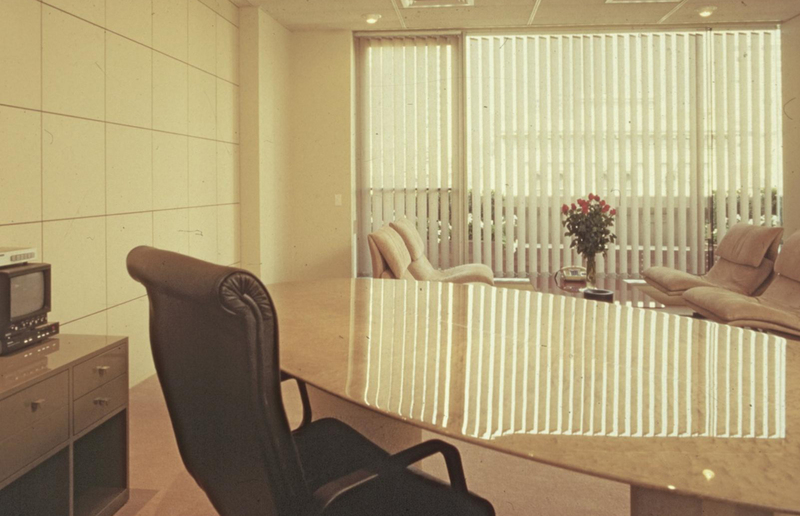 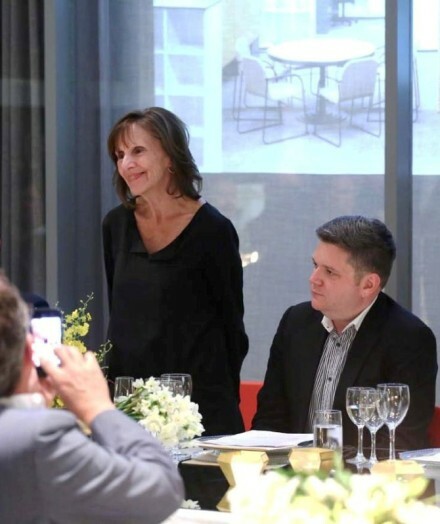 Teamwork and collaboration are an important aspect of working at The Boston Consulting Group and is a critical component of their long relationship with Carr. 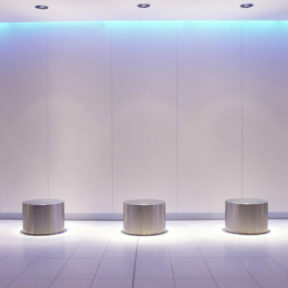 Each project involves an extensive briefing process to uncover unique team requirements. 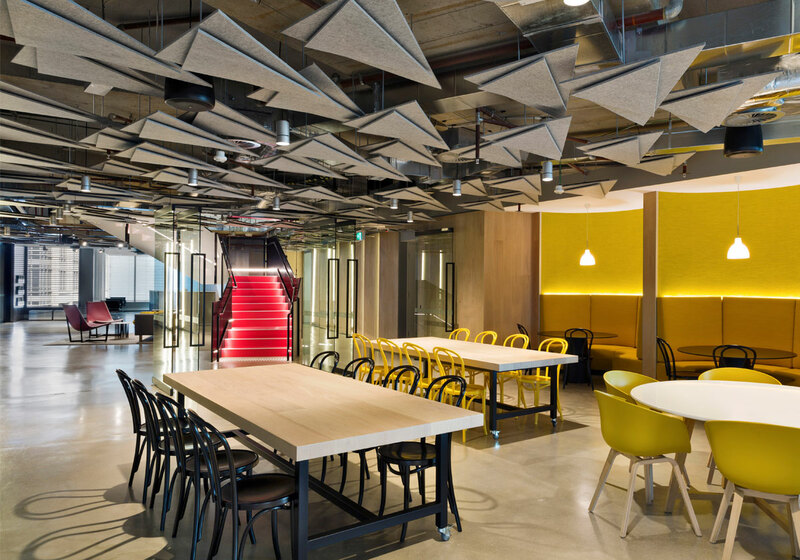 The Sydney team emphasised the mobility of consultant work which in turn pointed to the need for a mix of owned and non-owned work spaces to suit different types of tasks and patterns of use. 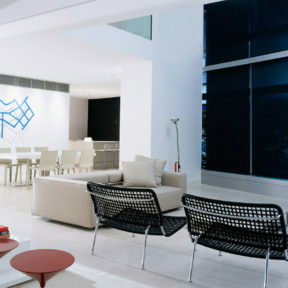 Project 37 is a private global consultancy firm that services many of the world’s leading organisations. 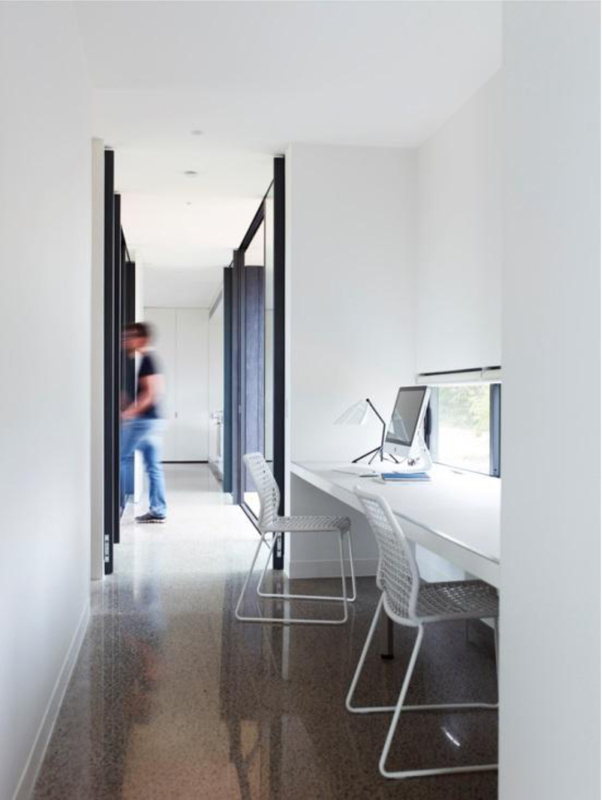 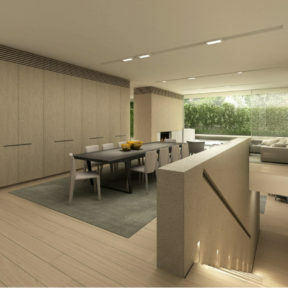 The brief was to create private and public work zones, encouraging collaborative practice whilst also facilitating a high level of confidentiality. 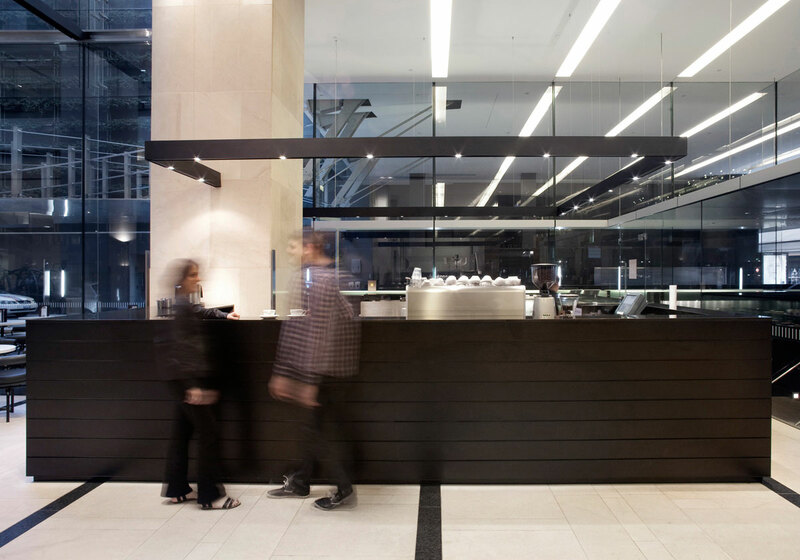 The public zone, referencing Melbourne’s “cafe culture” is characterised by casual, open spaces with a warm material palette. 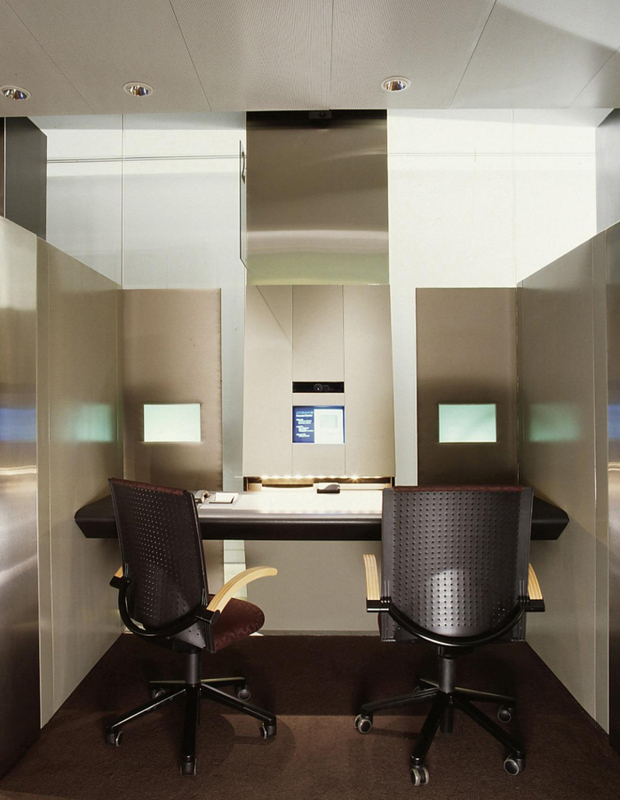 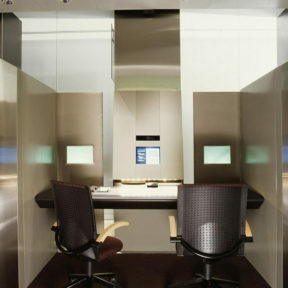 The private zone, is a mix of workstations and highly transparent offices to maintain team interaction and connection. 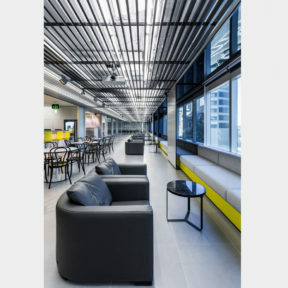 The Savills Brisbane team required a new workplace that would support their end to end provision of property services, from strategic consulting through to project and facilities management. 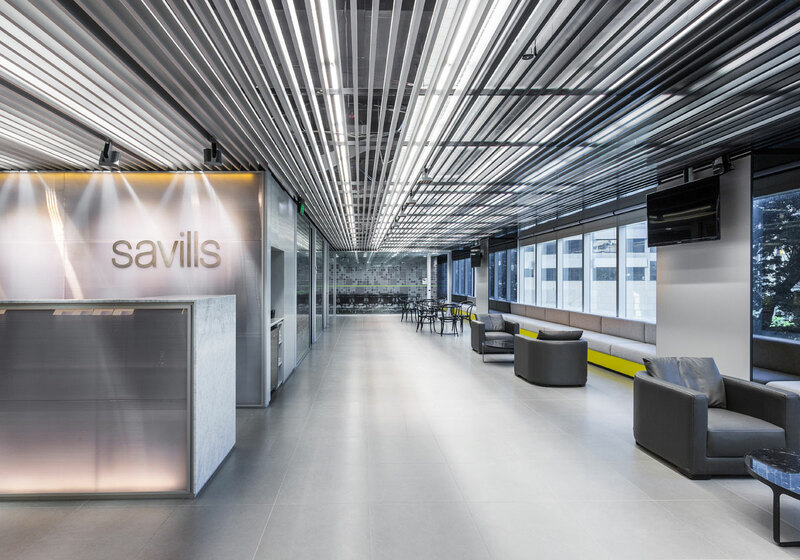 The fit-out embodies the Savills brand highlighting their trademark yellow and using materials and graphics to specifically reference the property and construction industry. 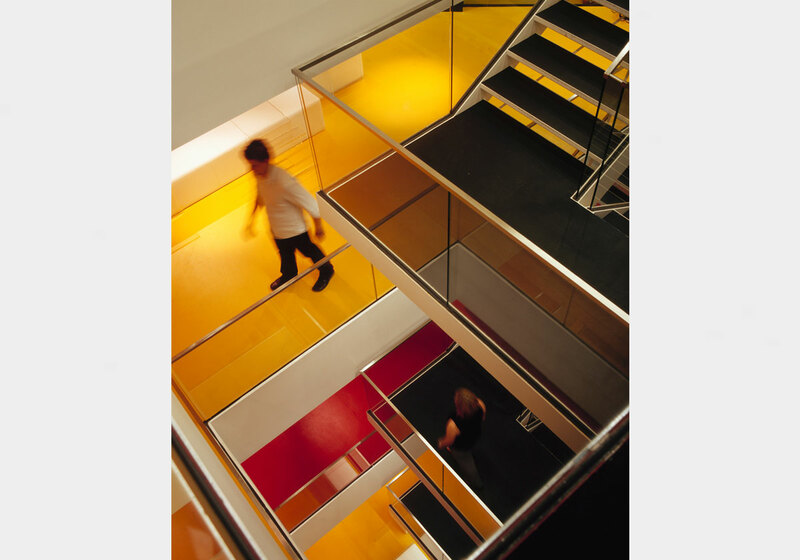 With a focus on efficiency, spaces are multi-purpose, responding to tasks and activities; adapting to suit different needs and demands. 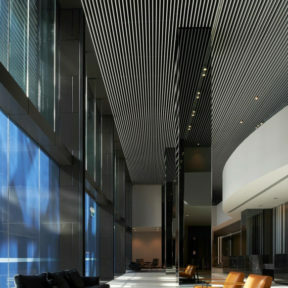 To create a distinctive connection to the company’s Canberra location, The Boston Consulting Group’s office references the urban planning of Walter Burley Griffin and celebrates the unique vistas and colours of ‘The Bush Capital’. 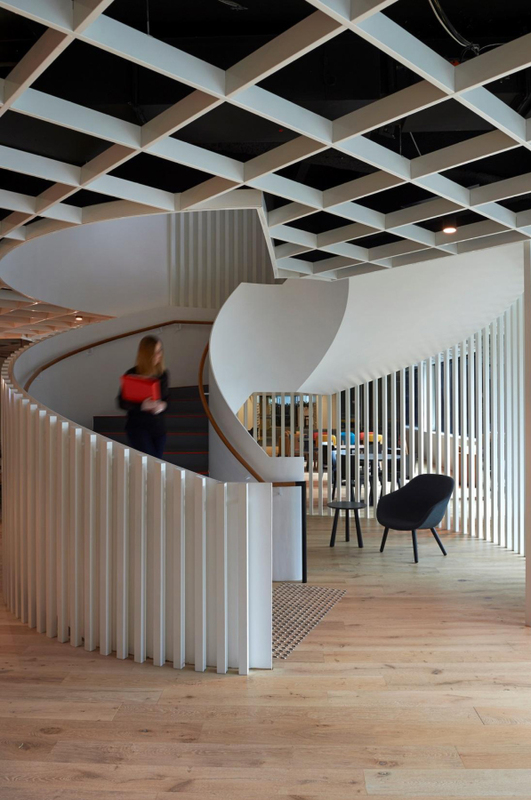 The office embraces curved forms through sculptural joinery and undulating roof-lines, providing a flexible, multifunctional space that encourages collaboration. 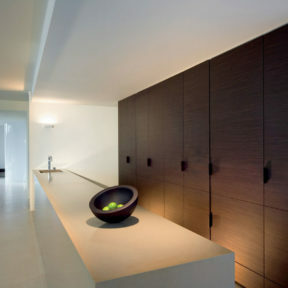 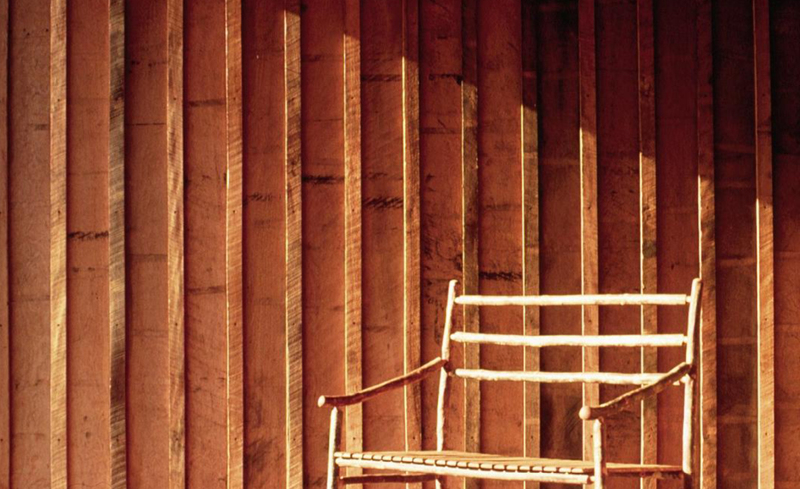 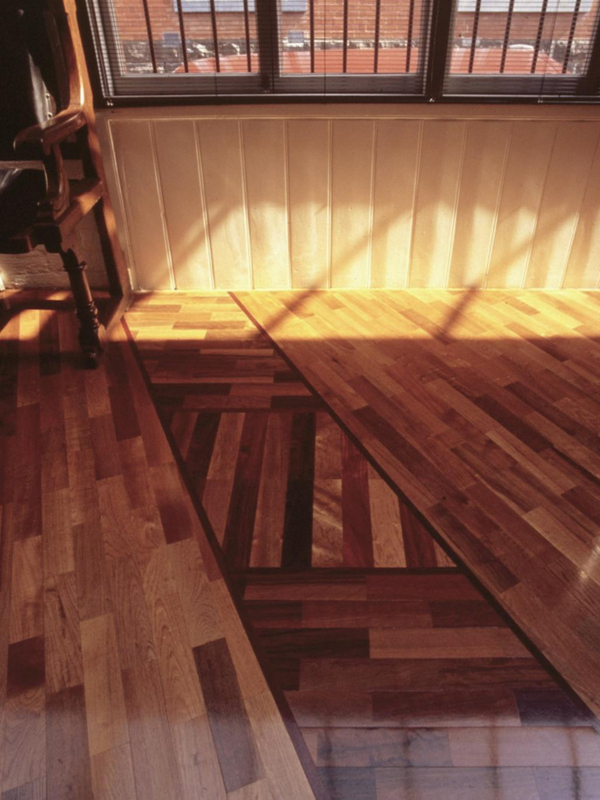 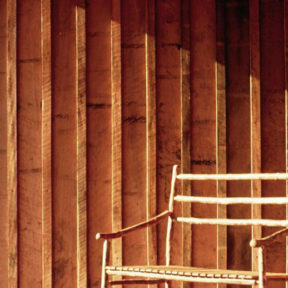 Extracting colours and materials from the natural surrounding creates a warm and inviting environment. 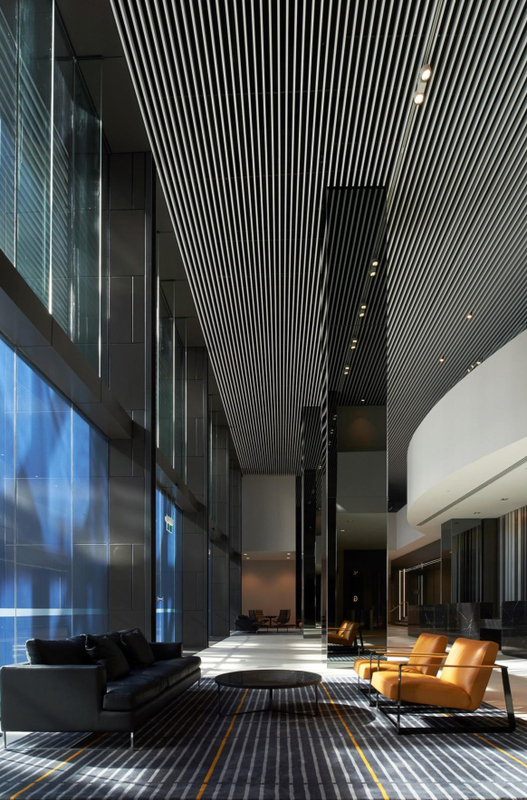 Continuing Norton Rose Fulbright’s tradition of striving for innovation and excellence, the new office at One One One Eagle Street Brisbane combines highly considered design and environmentally sustainable principles. 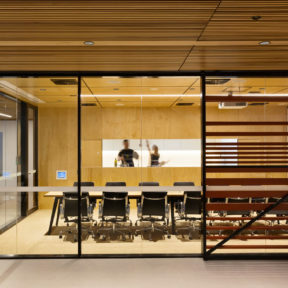 The fit-out not only meets the building’s 5 Star NABERS rating, but also is expecting to receive a 5 Star Greenstar Certification. 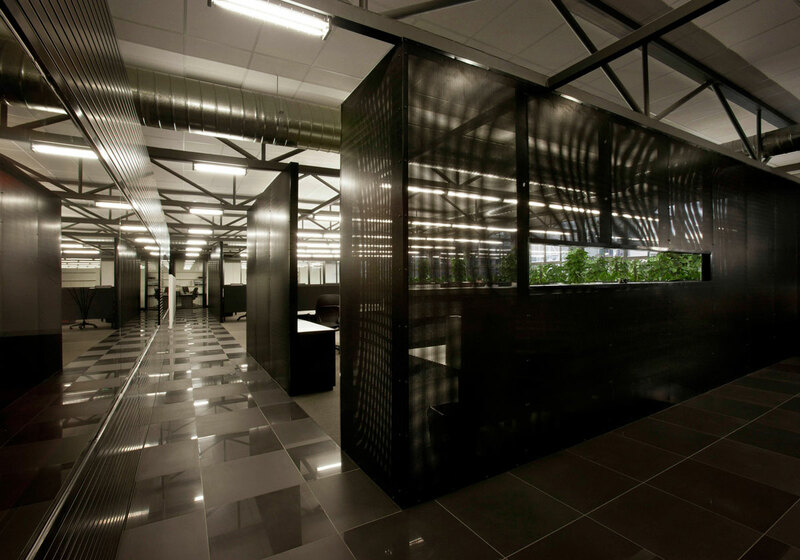 The workplace has a very strong focus on indoor environmental quality reflecting the firm’s commitment to employee well being. 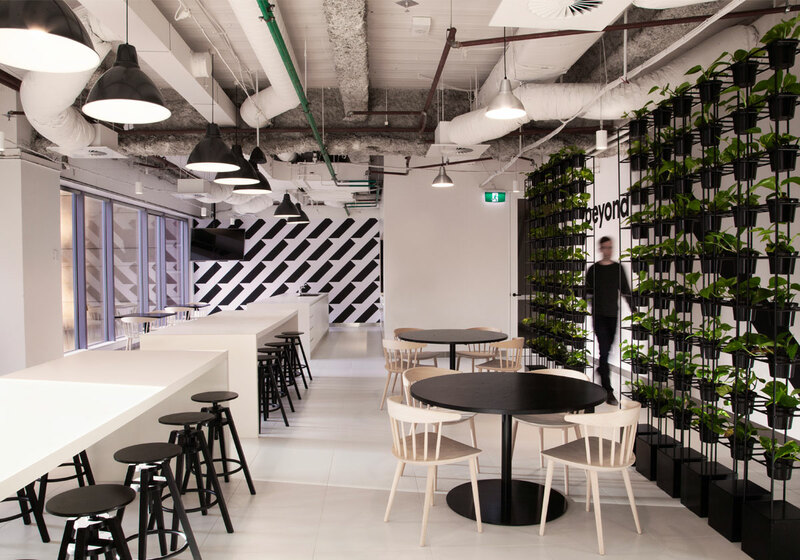 The Boston Consulting Group’s Perth office reveals an impressive understanding of the contribution of workplace design to business success. 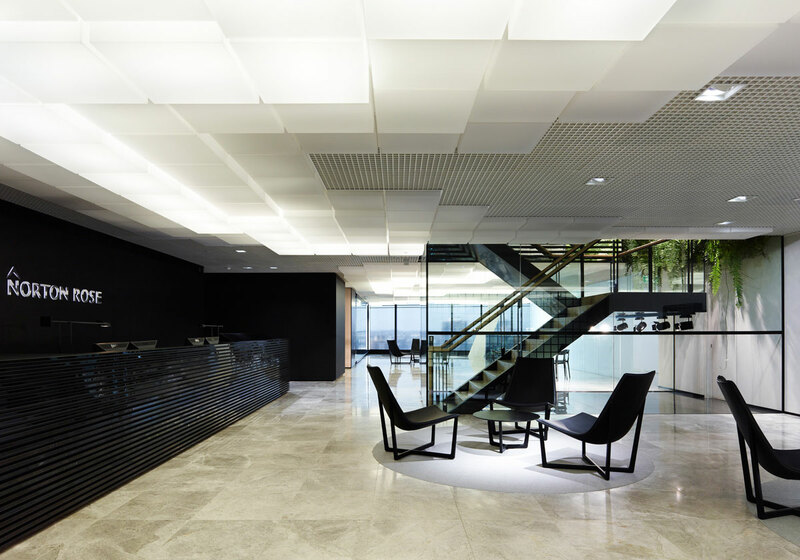 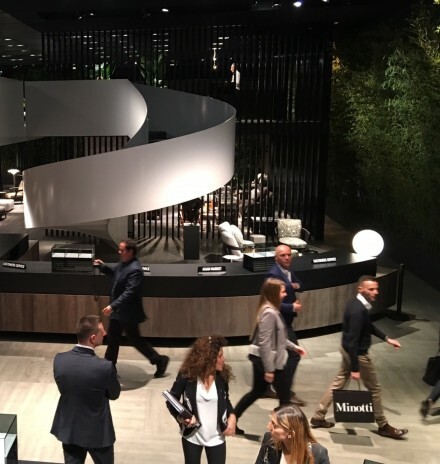 Skilfully executed, with an intrinsic connection to the landscape, the new design serves as a commercial tool which has the potential to contribute to employee satisfaction, the company’s recruitment success and general workplace productivity. 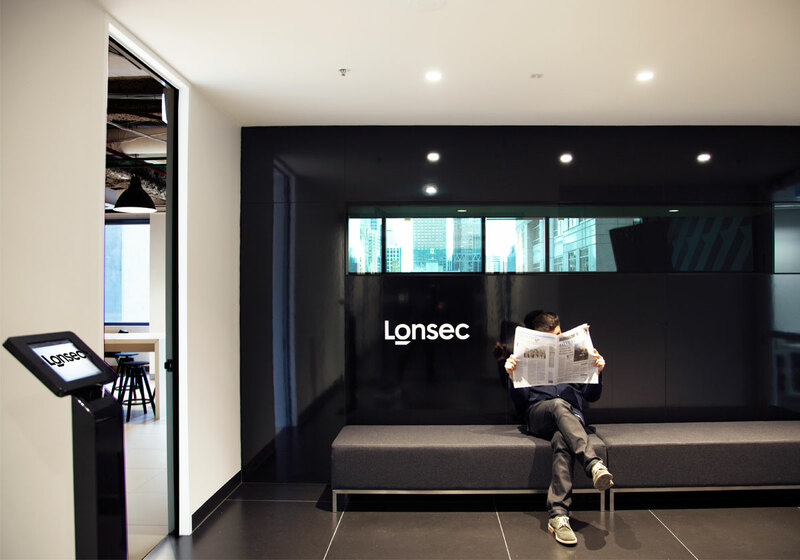 Representing a fresh approach to the integration of corporate identity in the workplace, super graphic elements combined with a bold materials palette closely align to the new Lonsec brand and workspace. 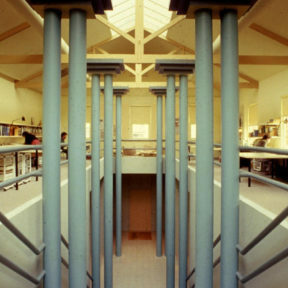 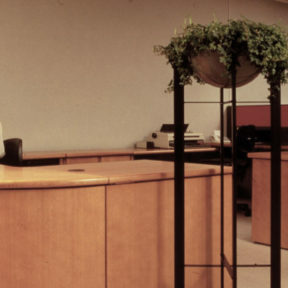 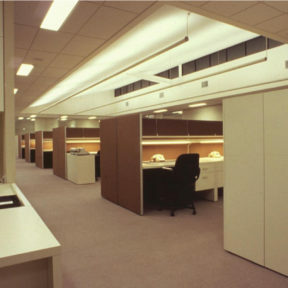 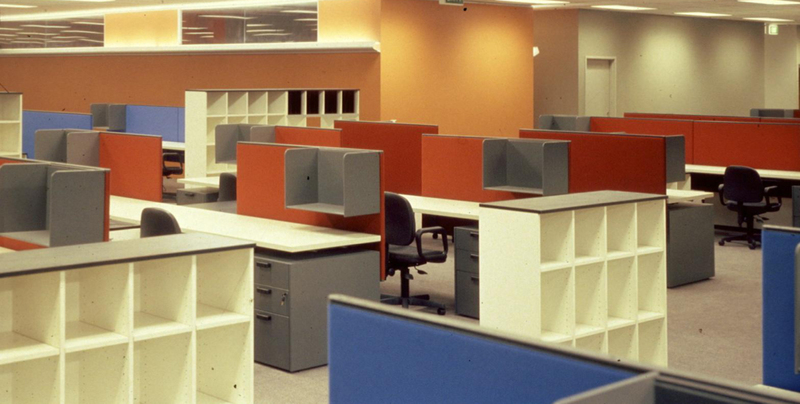 Integral to cultural change, an open plan work area considers the separation of business functions compulsory under financial services regulatory requirement. 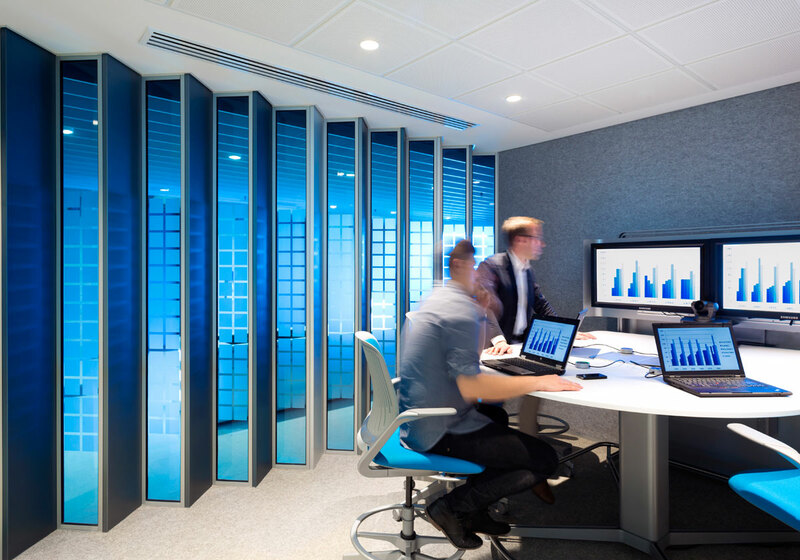 Highly cost effective, the fit out successfully balanced the defined budget objectives with the broader visual design and architectural intent. 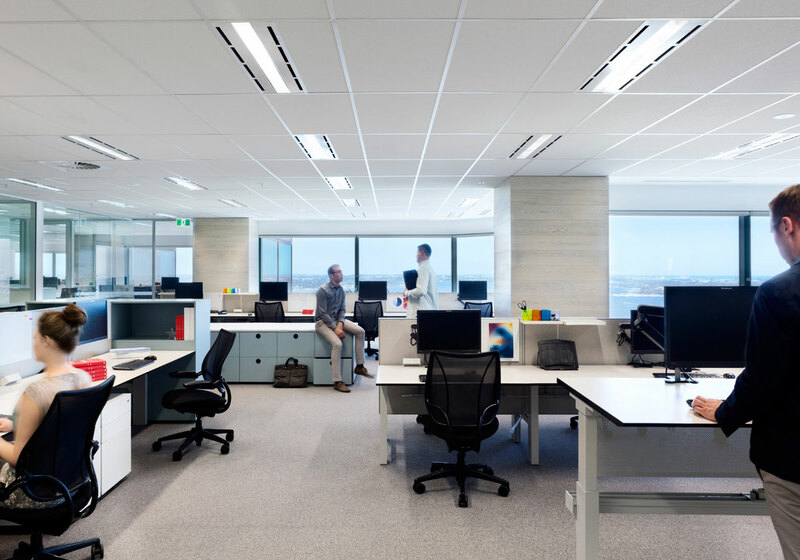 Formerly split between six levels in a traditional office fit-out, Meat Livestock Australia (MLA) required not just a new office location but a complete overhaul of work practices. 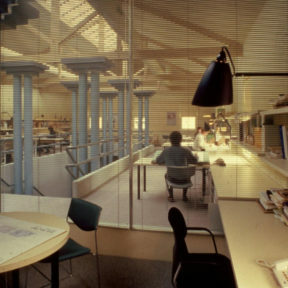 The design offers a diverse set of non-owned work settings. 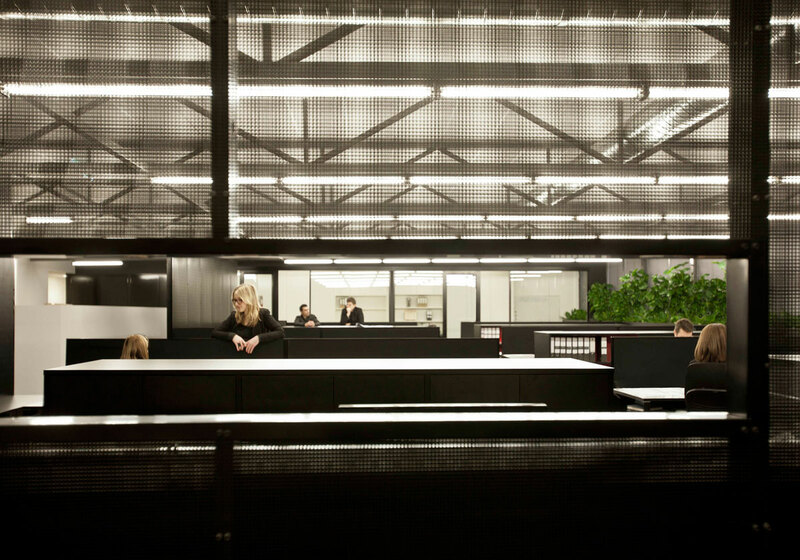 Four distinct zones offer variable levels of interaction and focus including a project, collaborative, hush and silent areas. 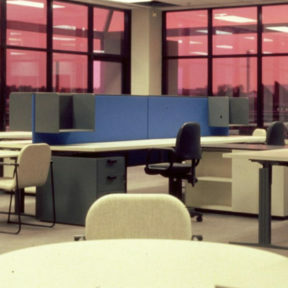 Each zone has a unique layout and activity settings catering to the specific type of working. 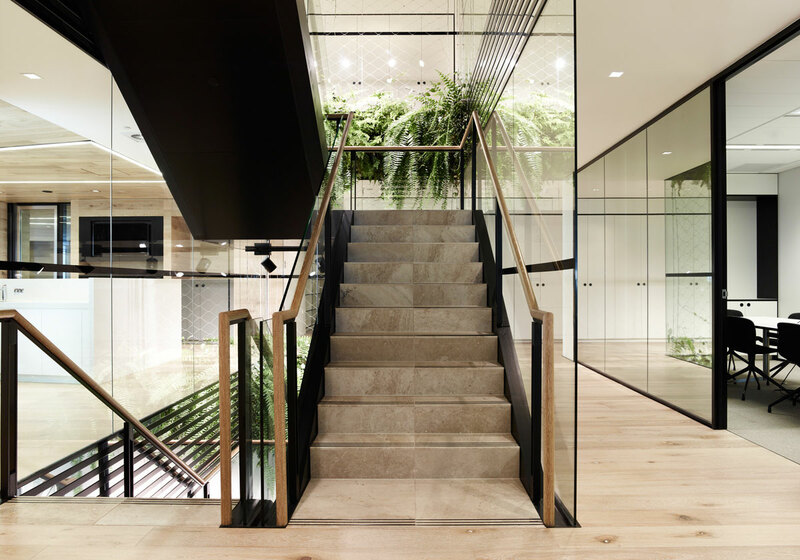 With a solid understanding of The Boston Consulting Group’s core values, the new Sydney fit-out reveals the enormous potential and artistry that goes into staging a contemporary office environment. 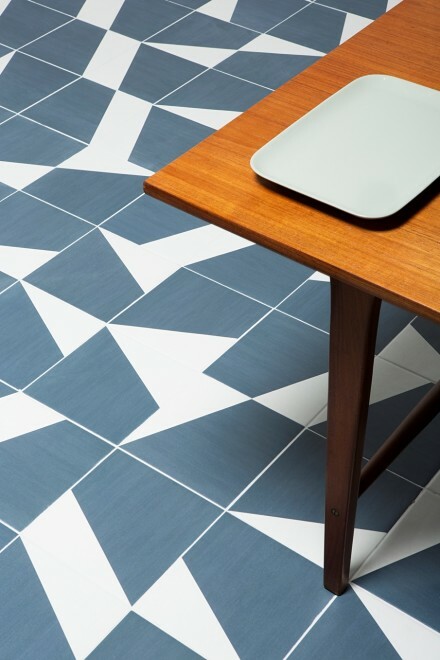 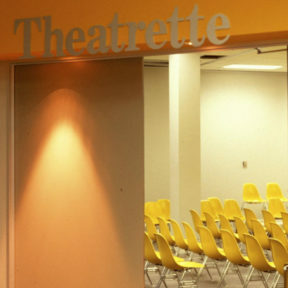 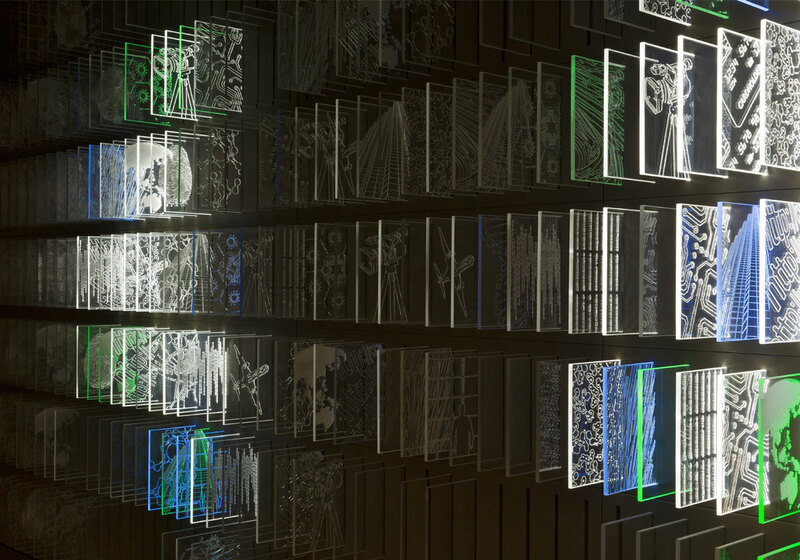 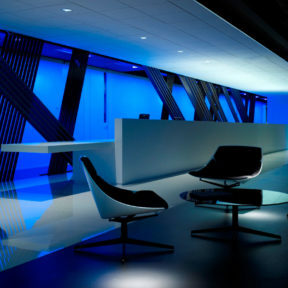 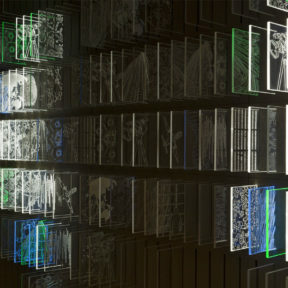 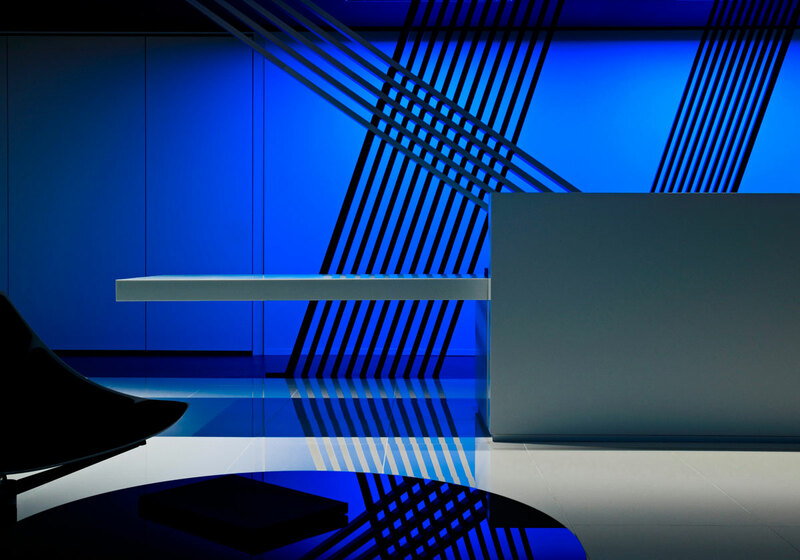 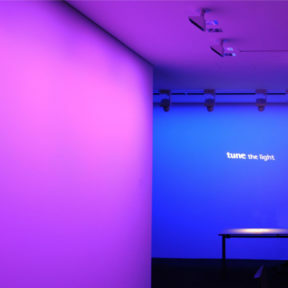 Inspired by an overarching metaphor of ‘trans’ – transglobal, transcending, transformative – the fit-out incorporates bold aesthetics, a unique floor plan, an interactive installation wall and a series of custom-designed graphics. 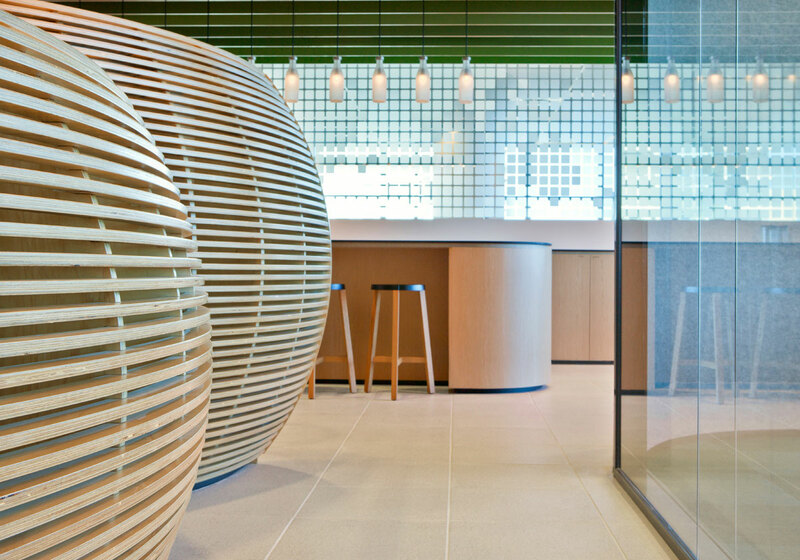 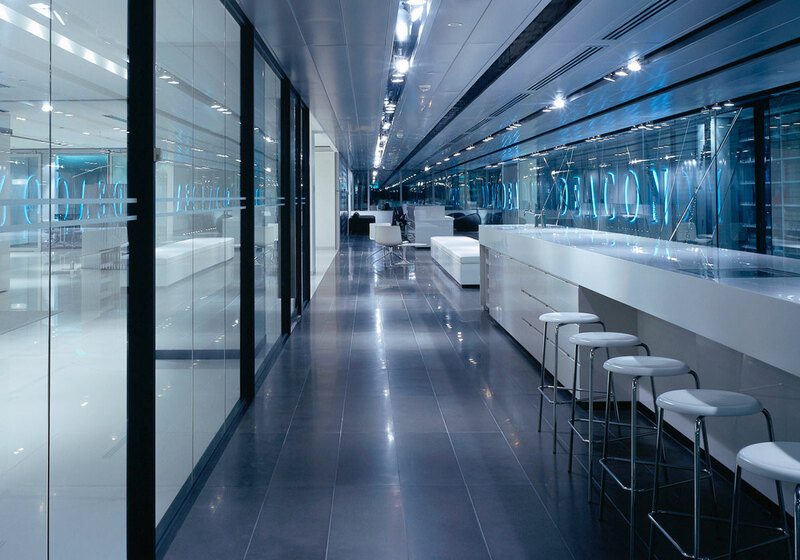 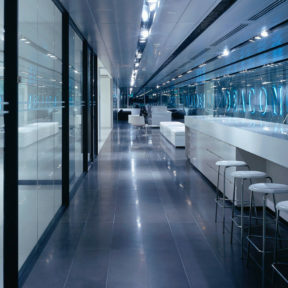 Pushing the boundaries of what a branded space can be, BCG’s fit-out is complex, radical and distinctive. 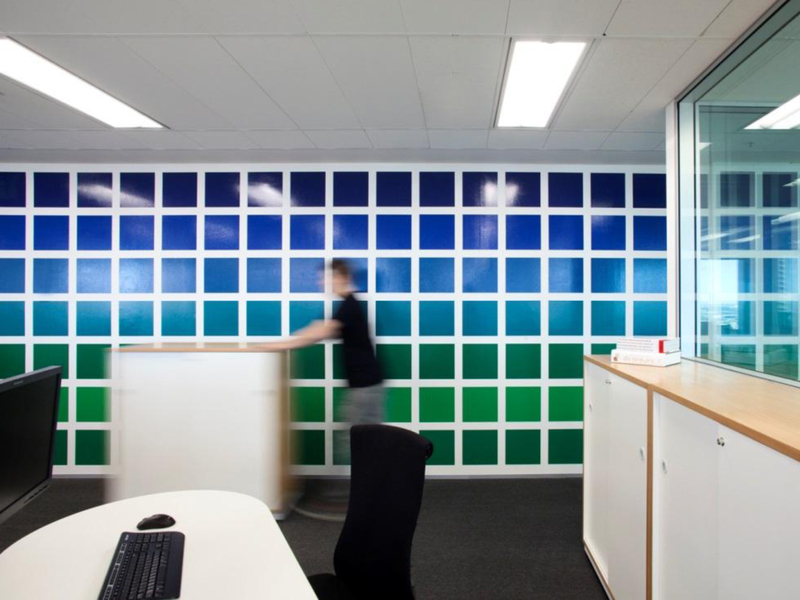 Set within StarTrack’s new premises in Cleveland Street, the company requested a space that would see a clear shift away from Australia Post. 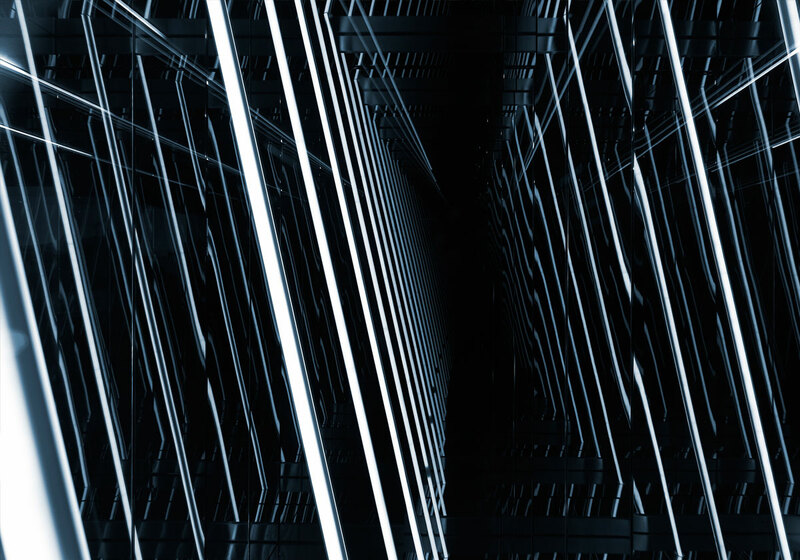 As a premium parcels and logistics company, StarTrack wanted a corporate graphic that would position them as sophisticated, future-focused and technically advanced. 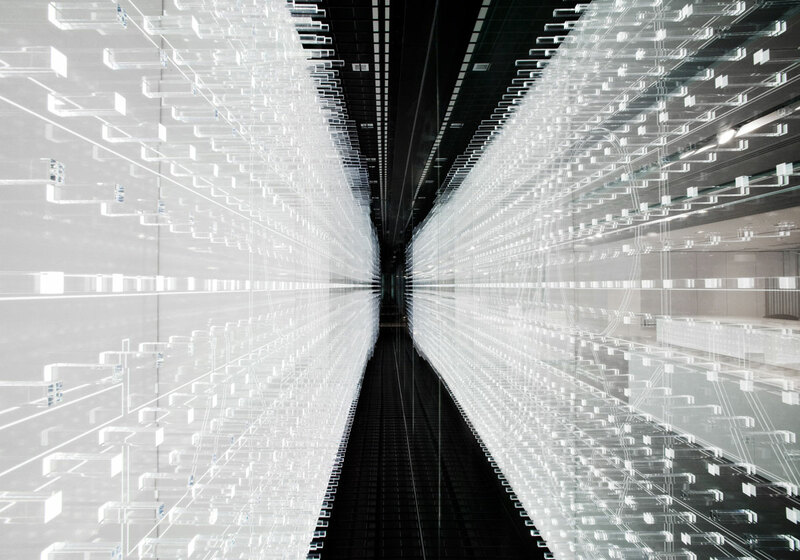 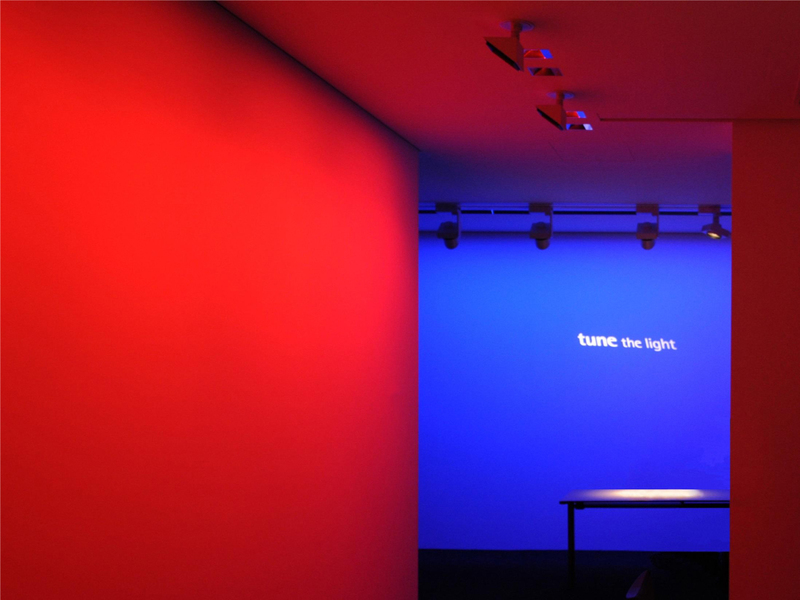 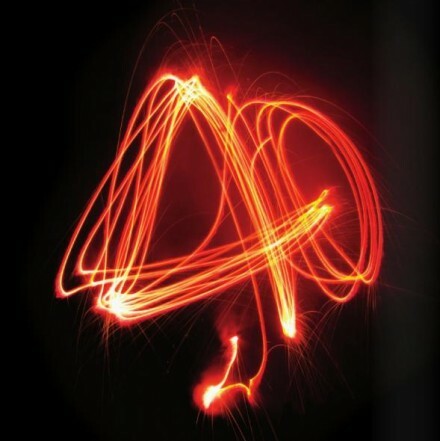 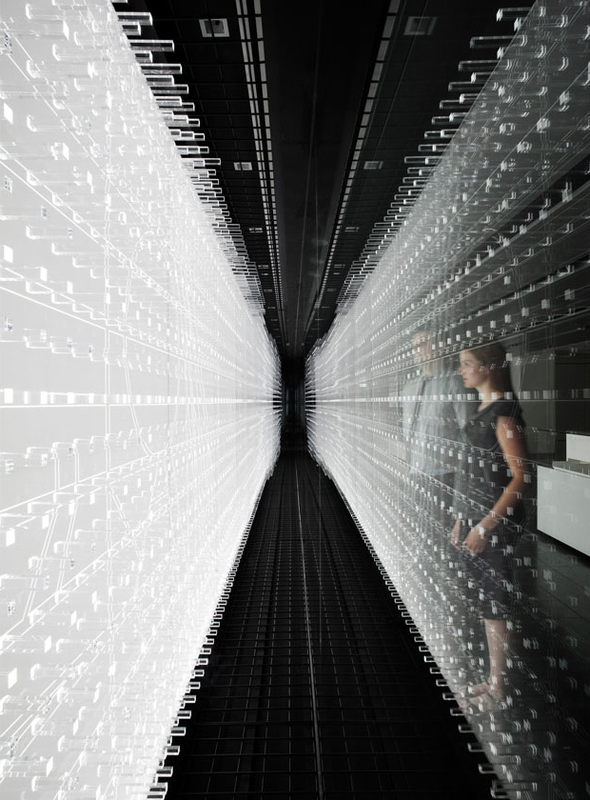 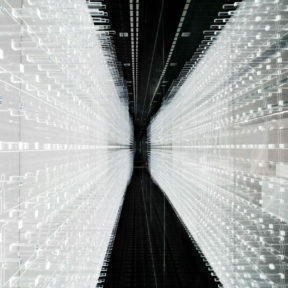 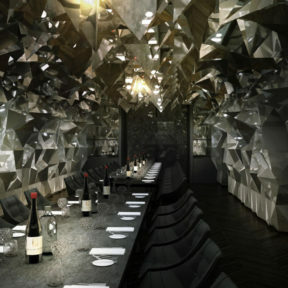 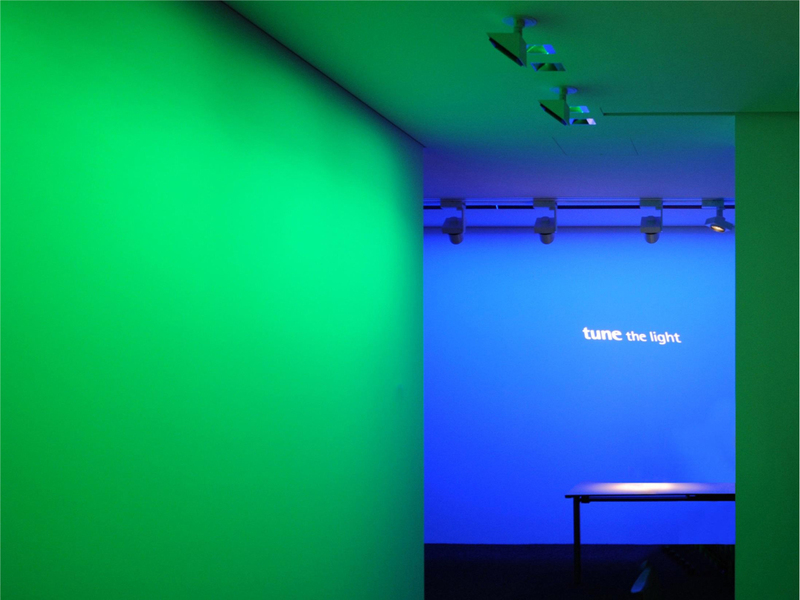 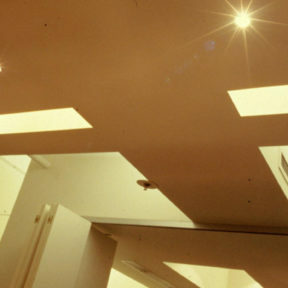 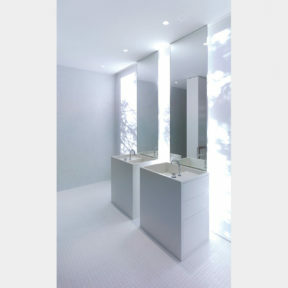 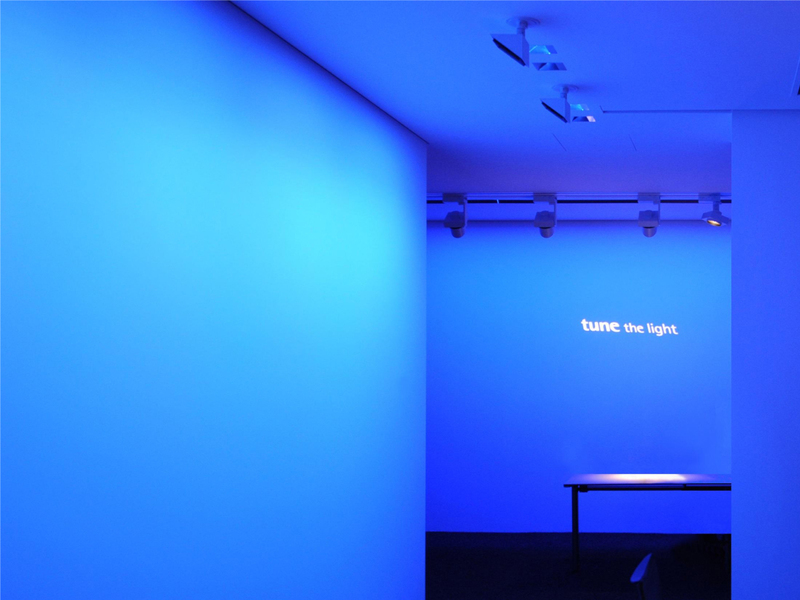 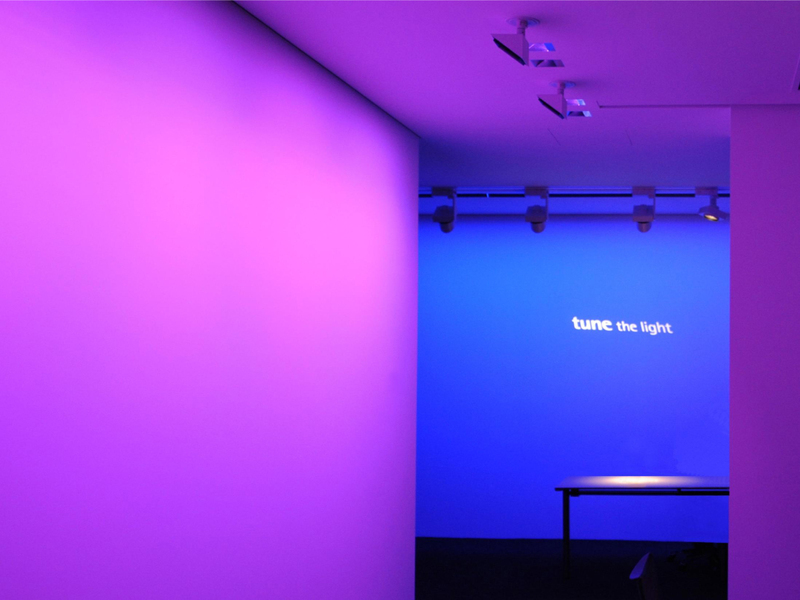 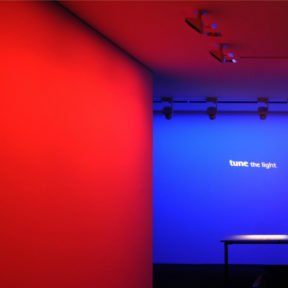 Using glass and mirror to distort light and reflection, Infinite Lights explores art installation to communicate brand. 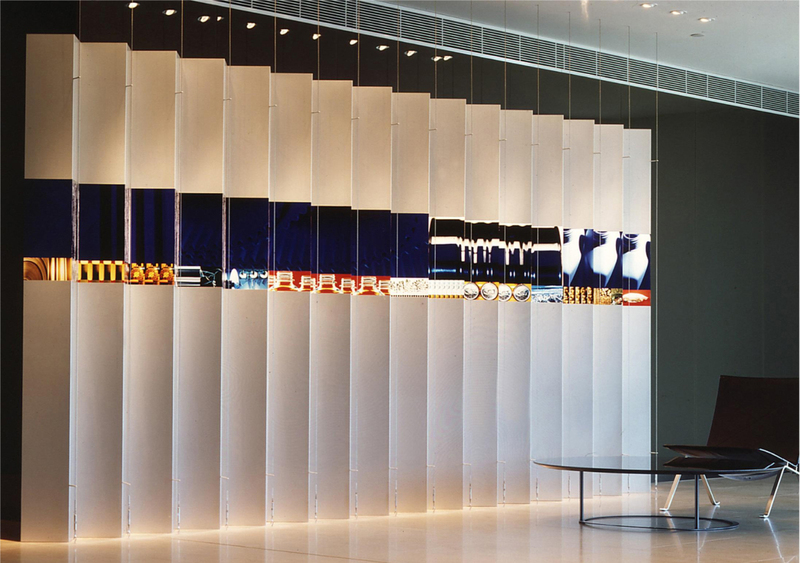 Referencing StarTrack’s graphics and its speed and distance, the translucent wall mediates between the specifics of site and lighting, which is framed in ever-shifting perspectives. 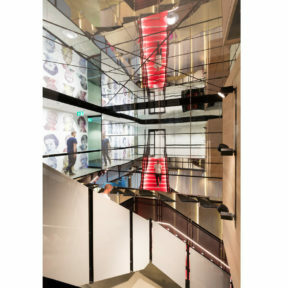 Positioned in the infamously iconic Cleveland Street headquarters, the fit-out for Australia Post offers contemporary office accommodation underpinned by an obvious – without being garish – branded aesthetic. 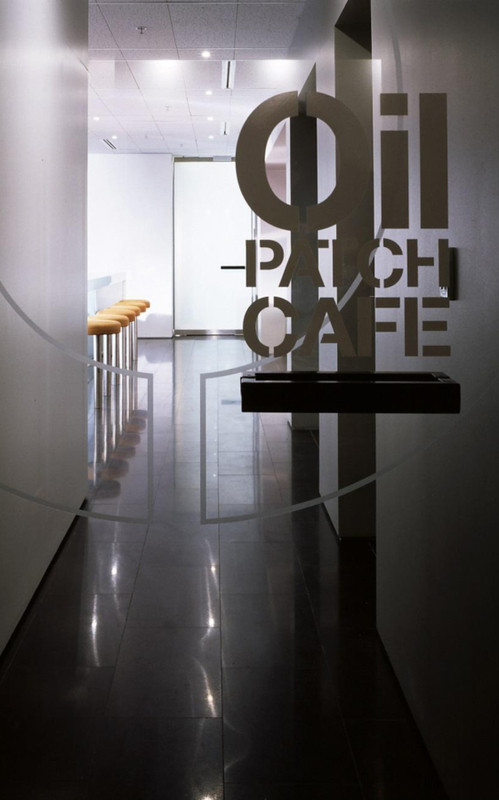 Translating ideas of digital economy into binary and bar coding, we designed screen motifs, ceiling details, reflective surfaces and graphics, to establish contemporary branded spaces. 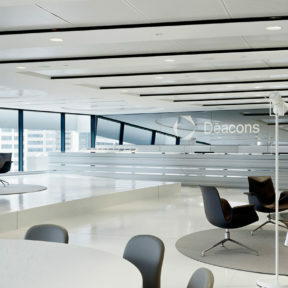 Significantly reducing its footprint, the offices are spread across two floors and are made up of five distinct wings on each floor. 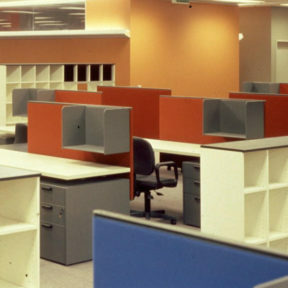 Adopting a completely open plan approach, the new work settings are flexible, enabling teams to change and re-form in response to business needs. 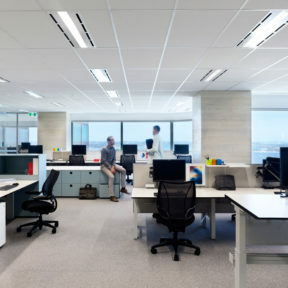 This will see a greater focus on collaboration and connectivity, as well as improved efficiency and effectiveness.